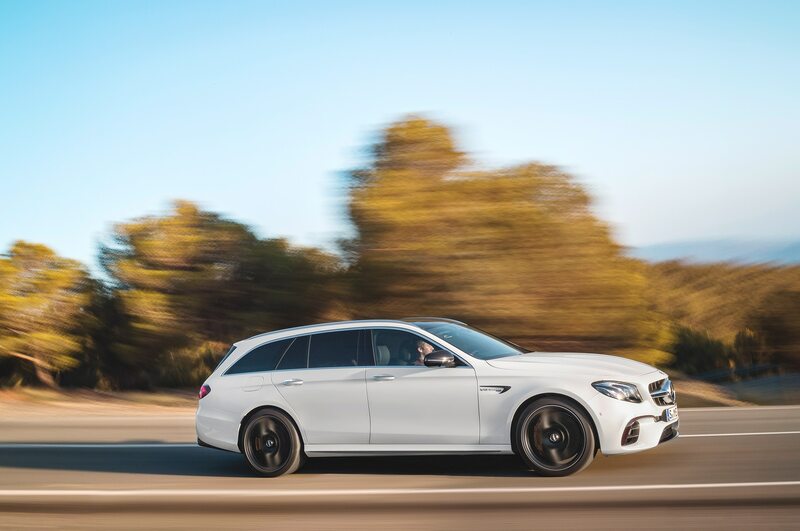 MALIBU, California — The last time I drove a Mercedes E63 AMG was about 10 years ago, before there was even a Mercedes-AMG. 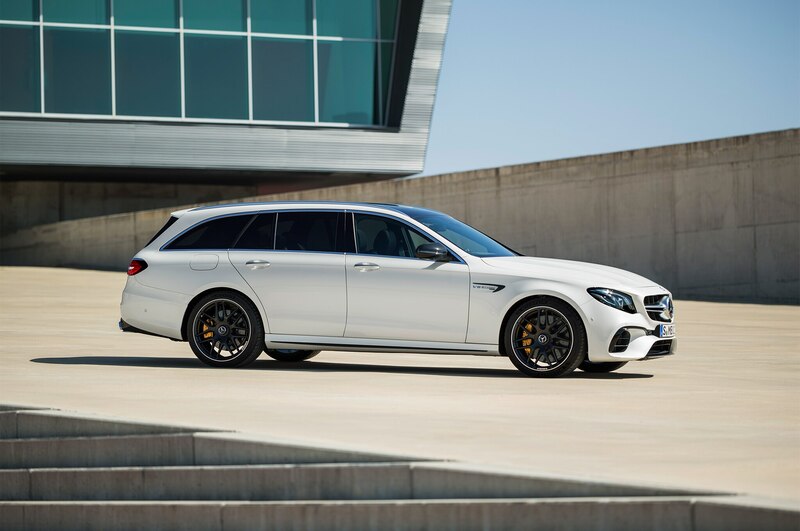 It was a blue station wagon complete with roof rack and seven seats, cream-colored leather interior, AARP-grade wood trim—and AMG’s wicked 6.2-liter 507-hp V-8 lurking under hood. 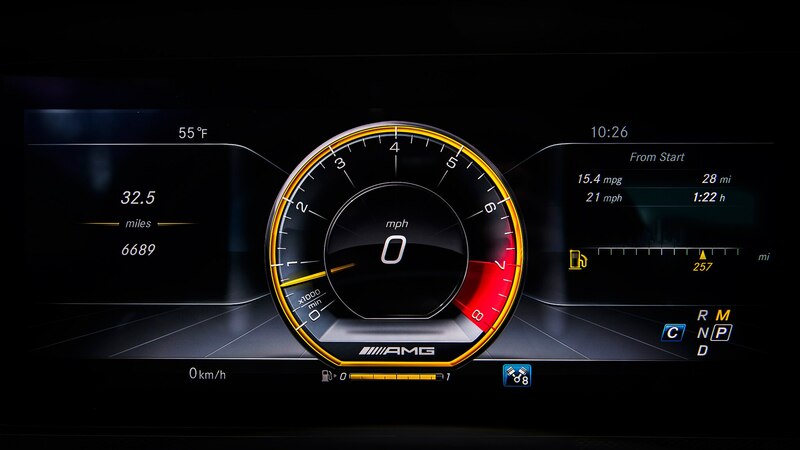 It was the ultimate sleeper, both visually and experientially, conducting itself with all the grace and poise of an E-Class until you floored the accelerator—at which time it would rocket forward, exhaust blaring loud enough to drown out a Manowar concert, while the cops in the vicinity gave themselves whiplash trying to find the Challenger, Camaro, or Mustang making all that noise. 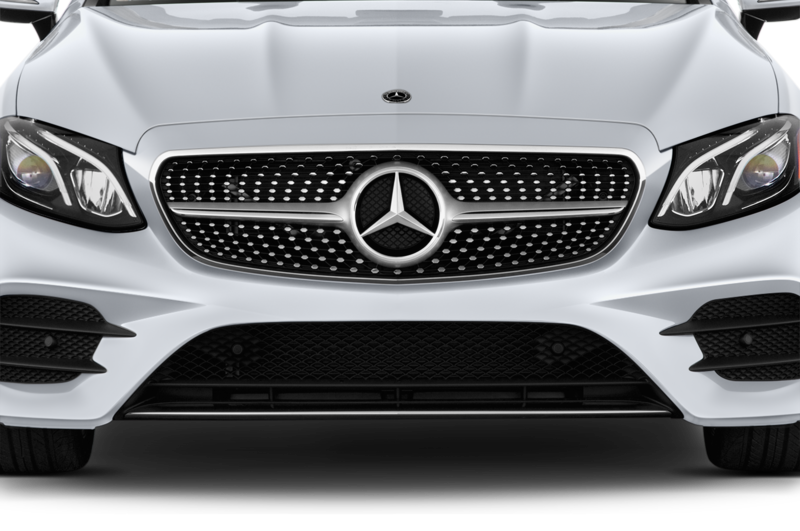 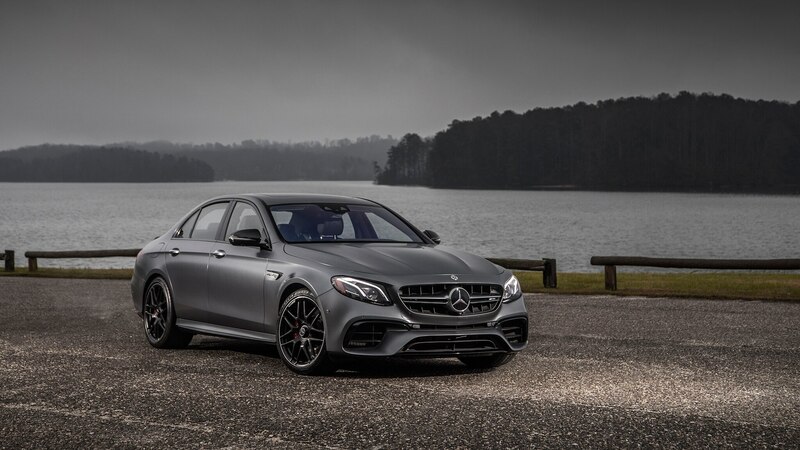 The 2018 Mercedes-AMG E63 S First Edition is nearly the exact opposite. 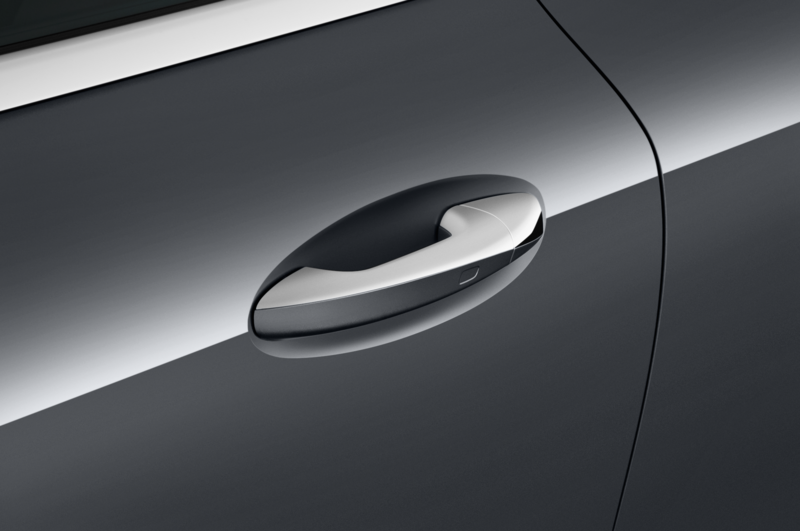 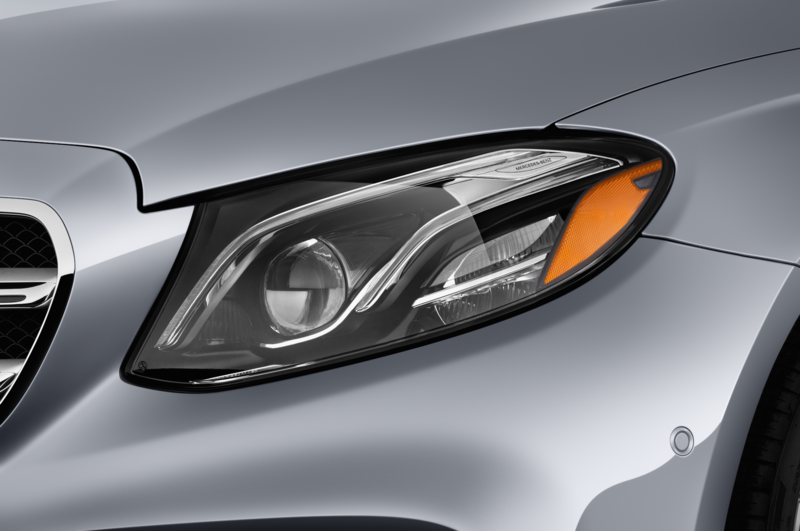 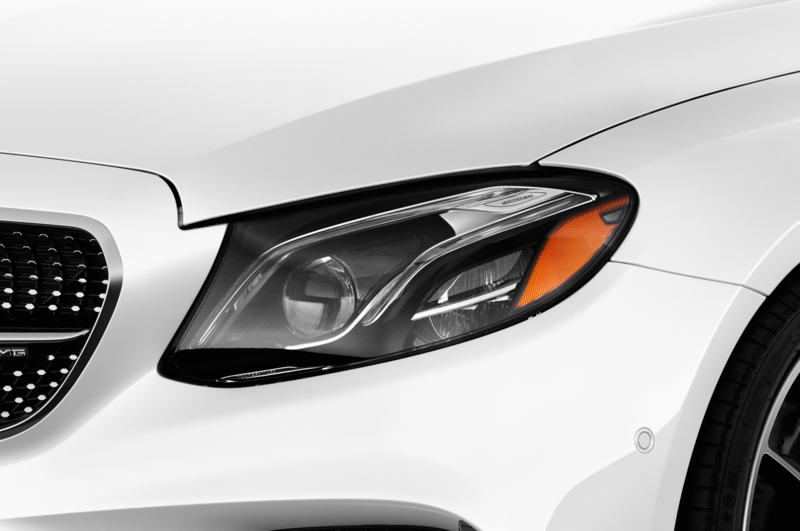 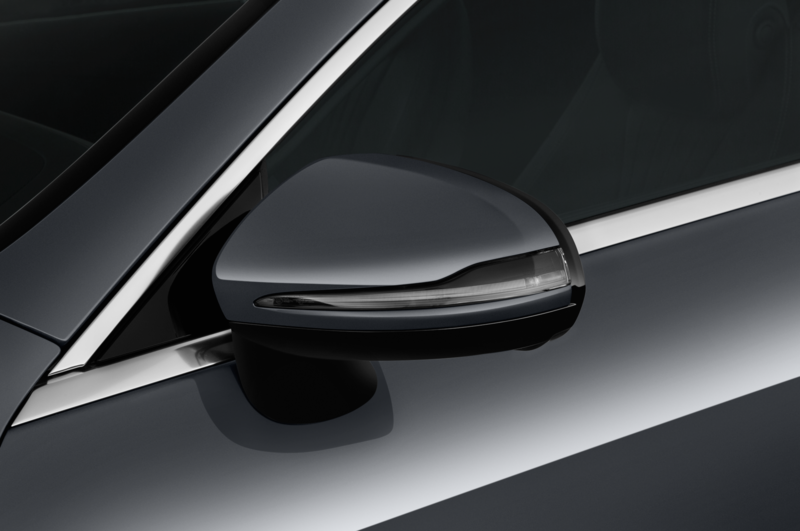 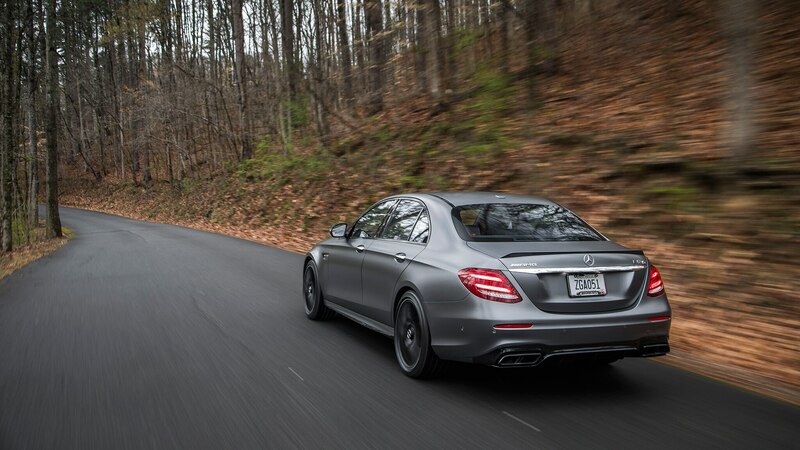 It’s a sedan, with bulging bodywork finished in matte-black paint. 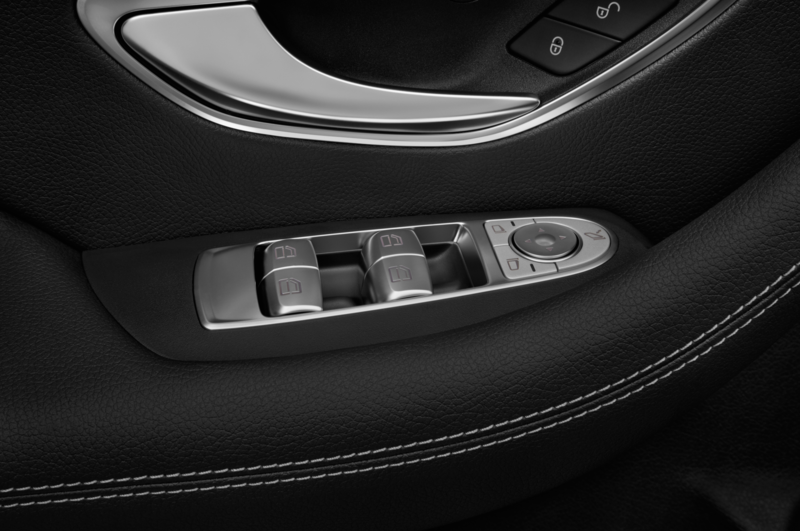 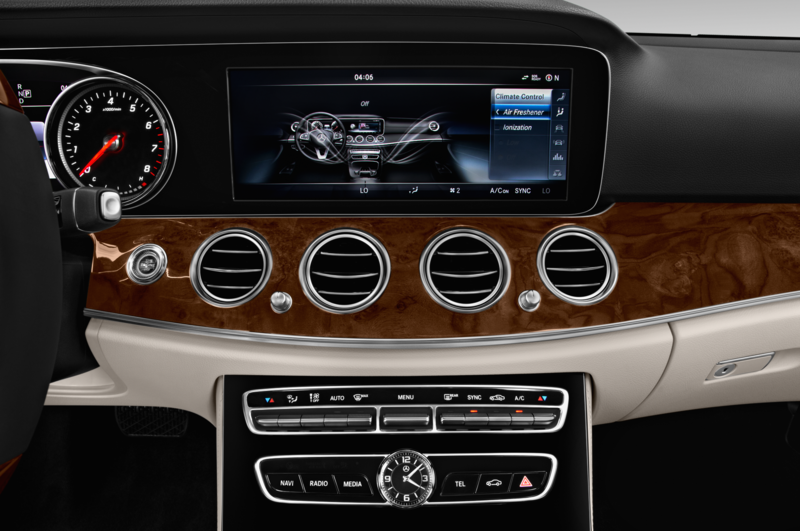 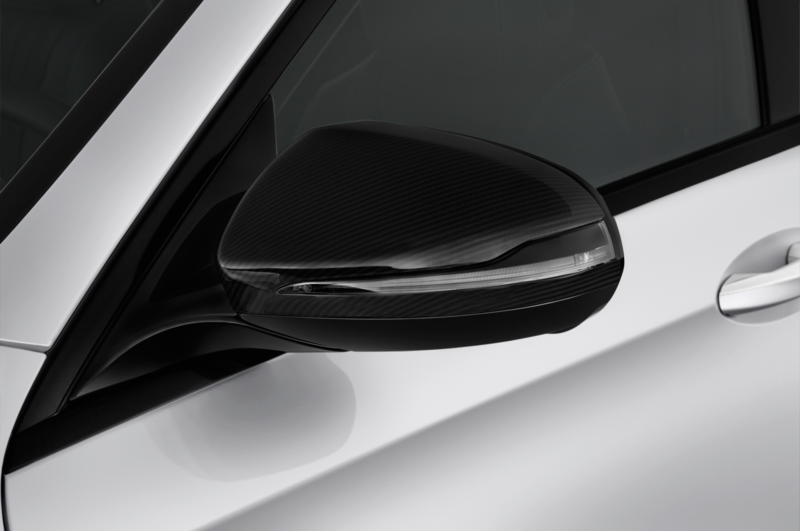 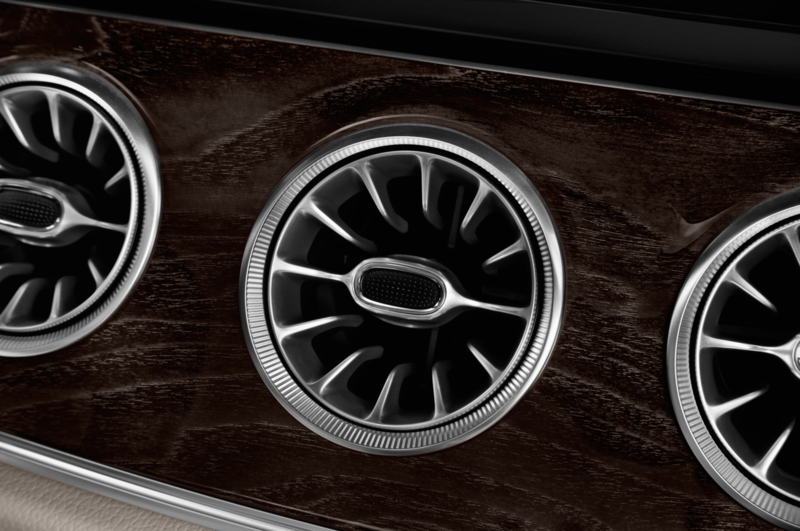 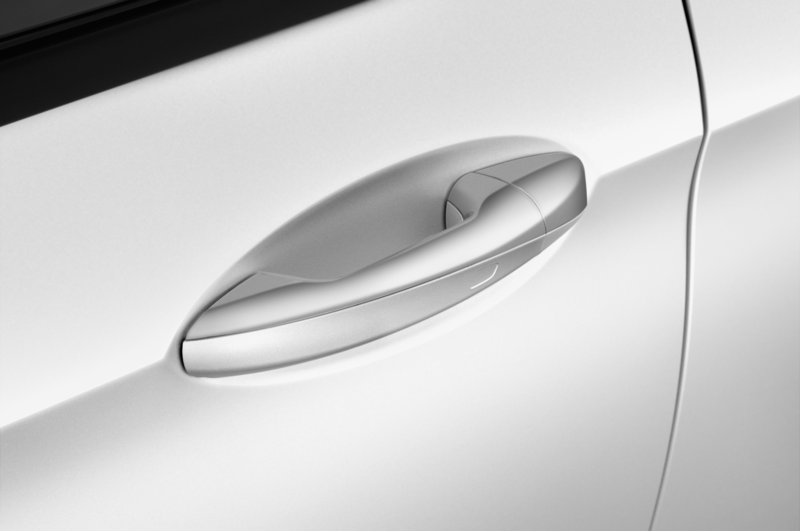 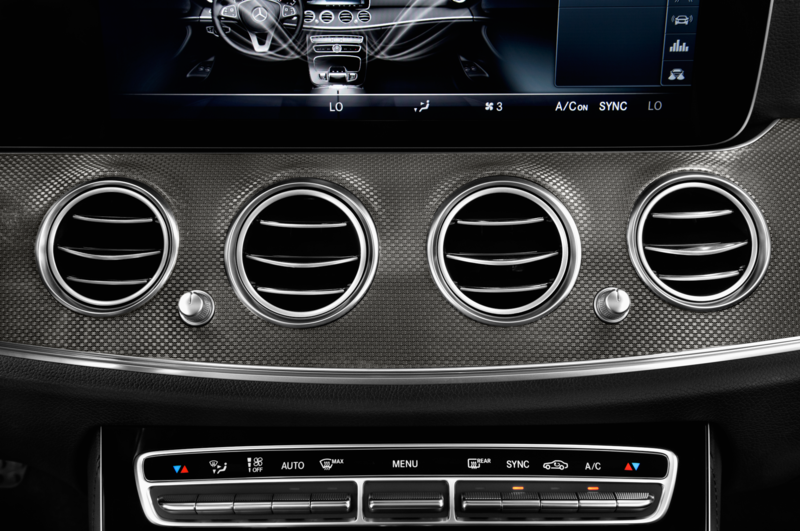 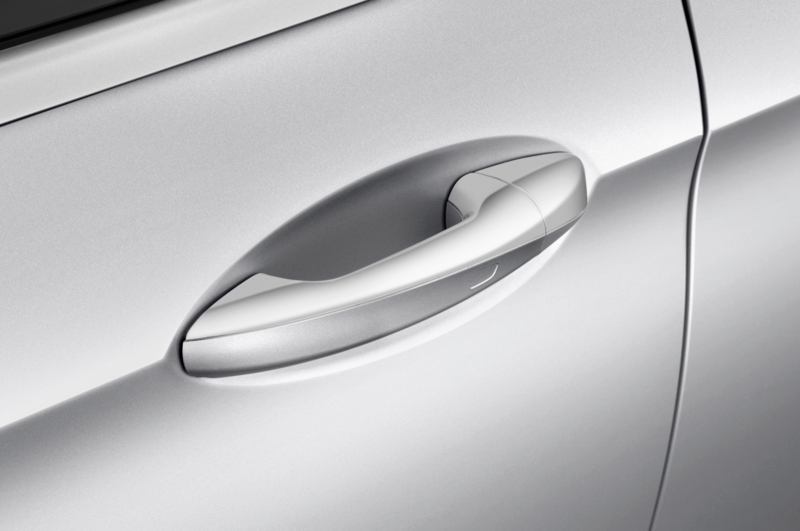 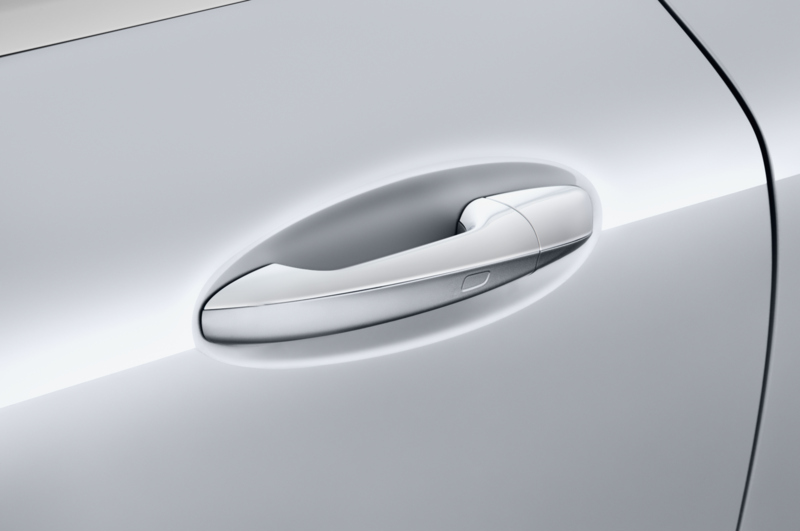 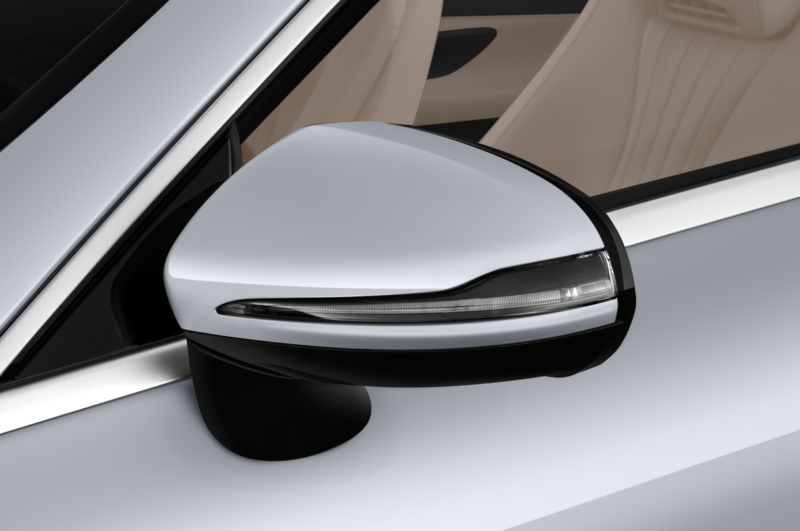 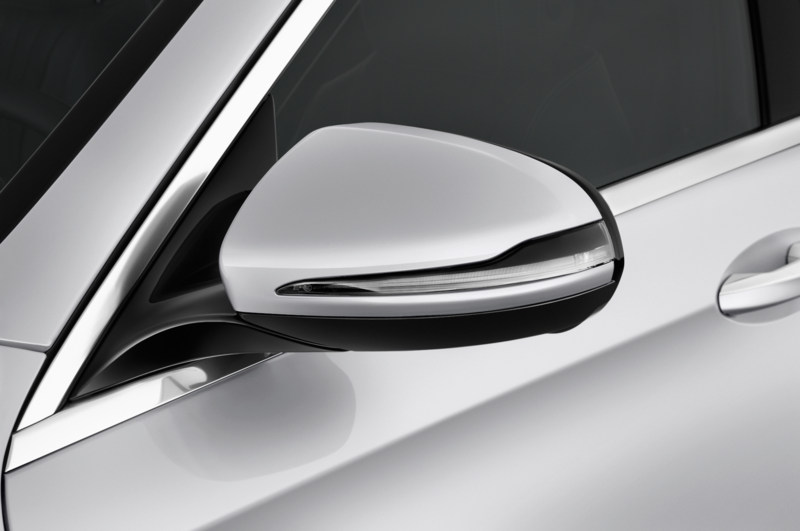 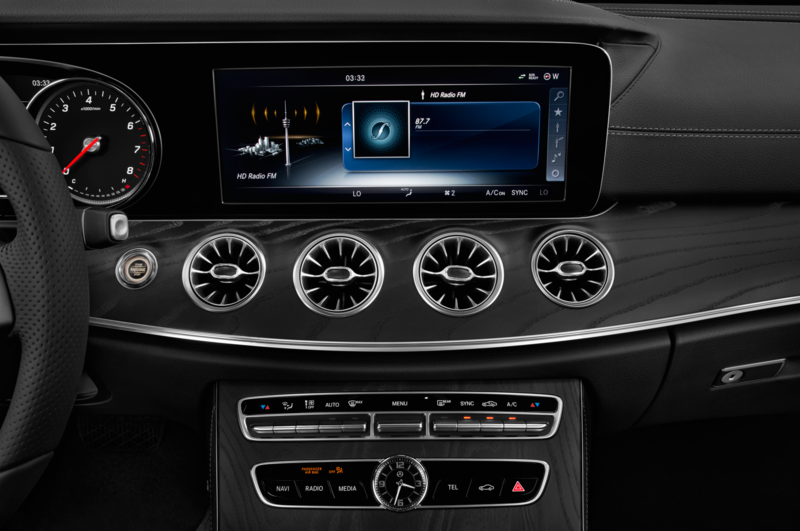 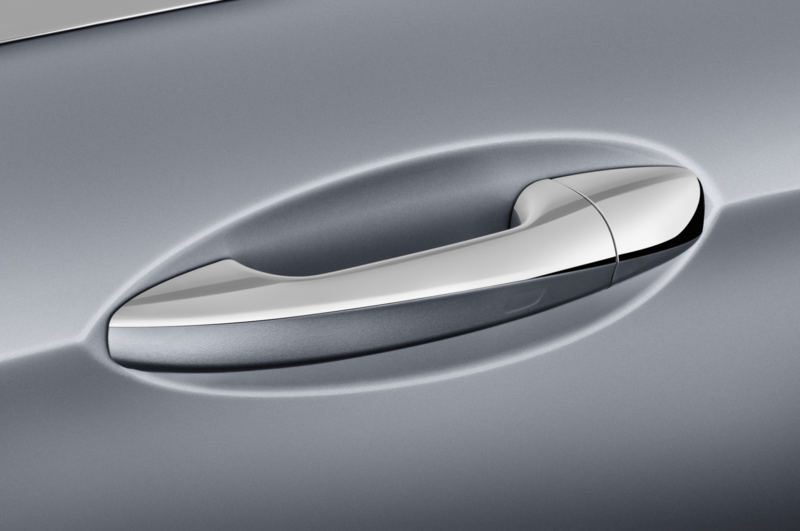 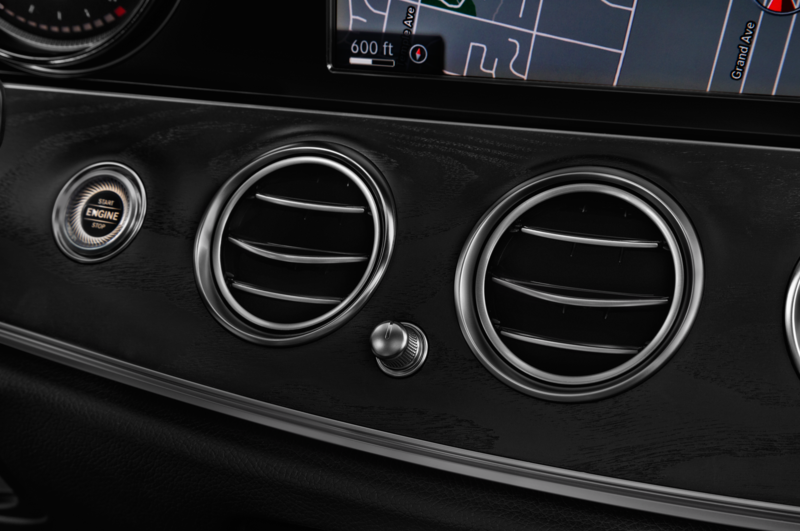 The dash and doors are slathered in carbon-fiber trim. 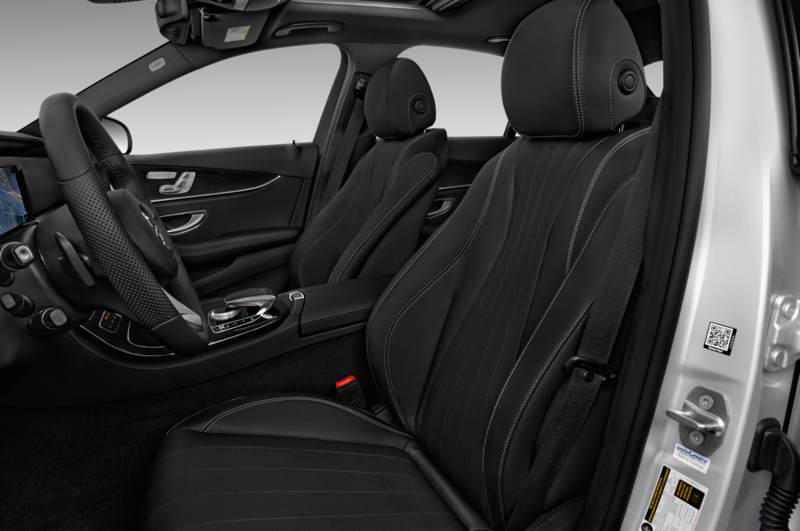 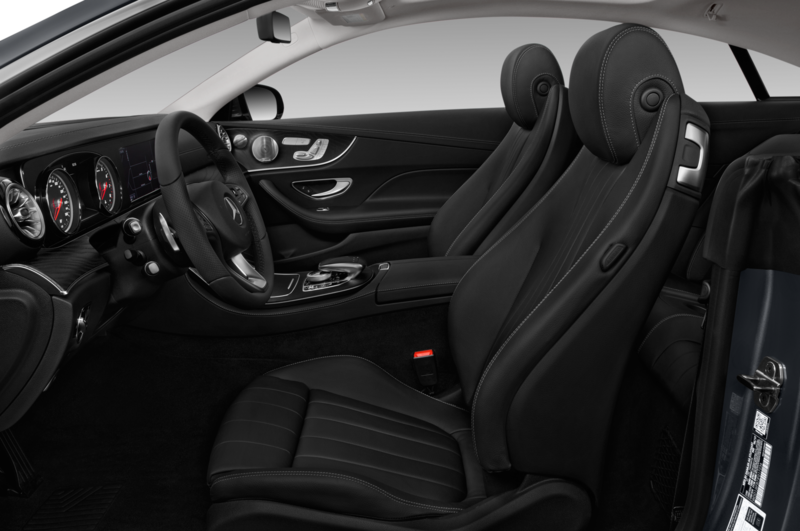 The rock-hard racing seats are wrapped in ebony leather, as is the bulk of the dash, all highlighted with miles of bright-yellow contrast stitching. 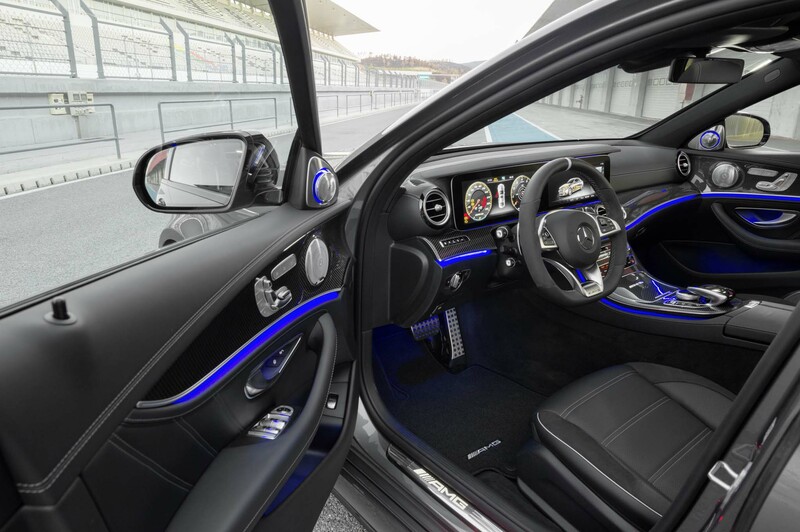 It’s the sort of interior a billionaire bumblebee might commission. 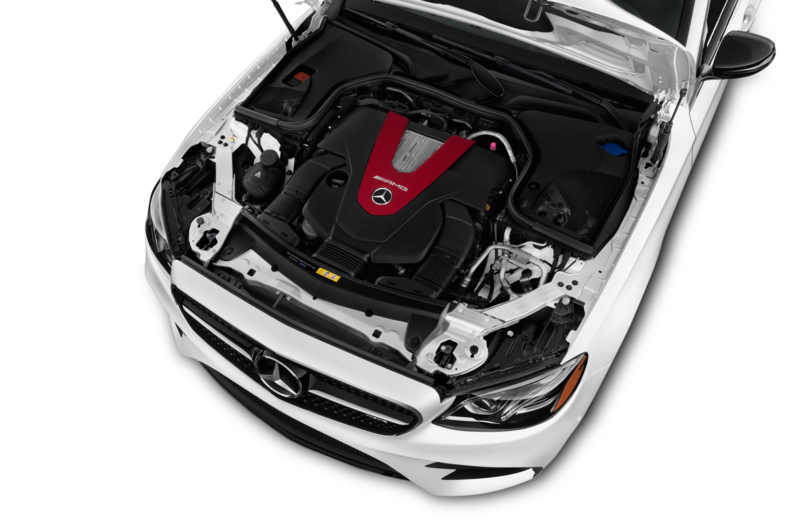 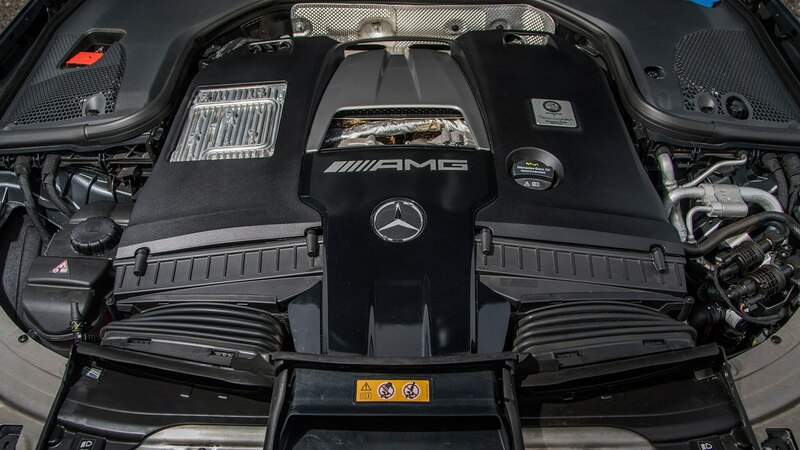 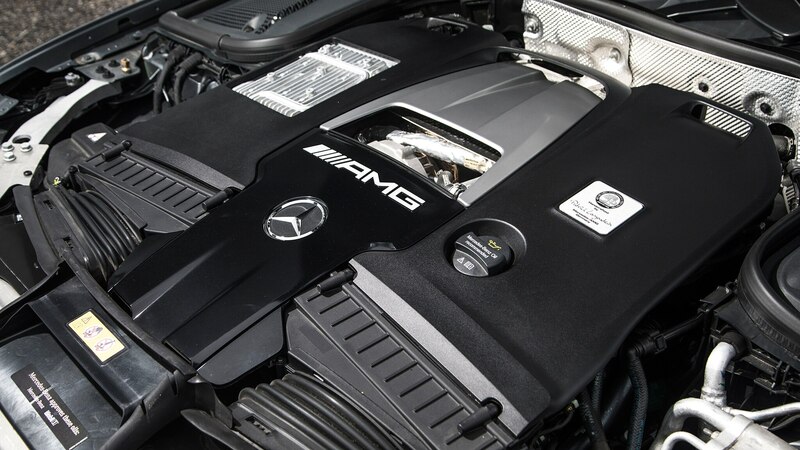 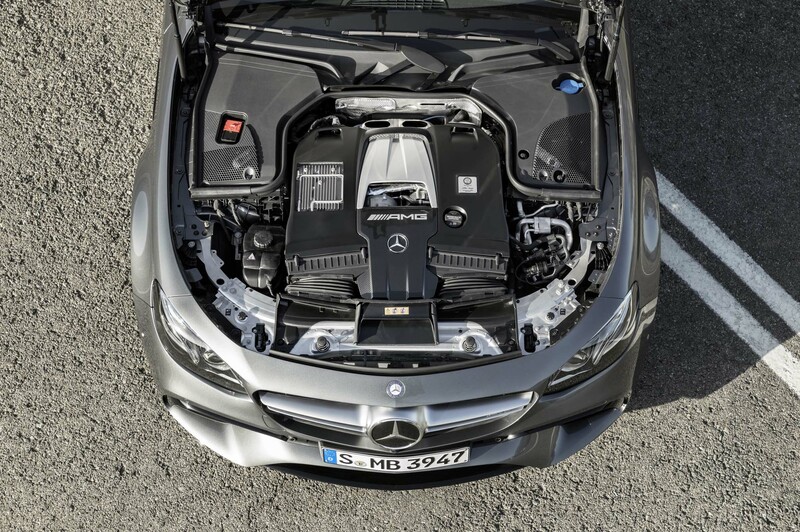 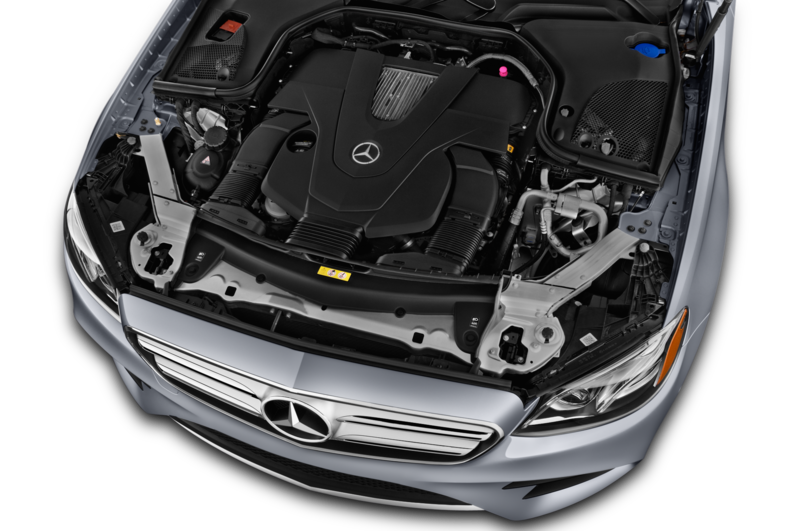 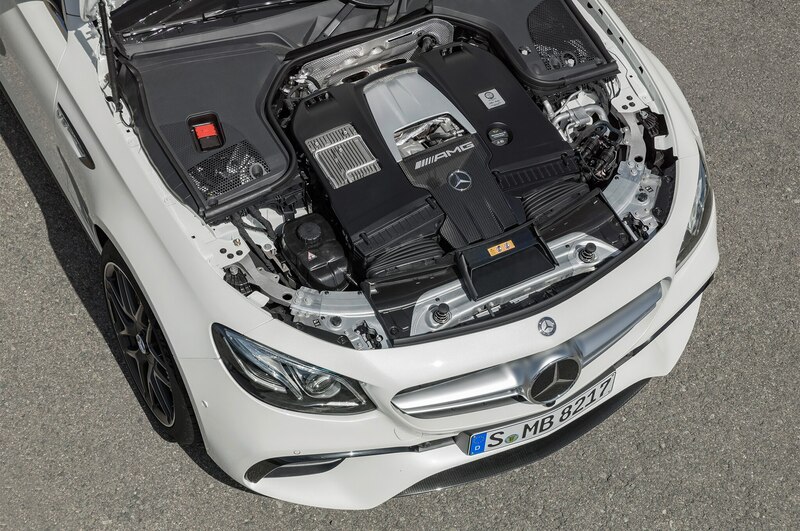 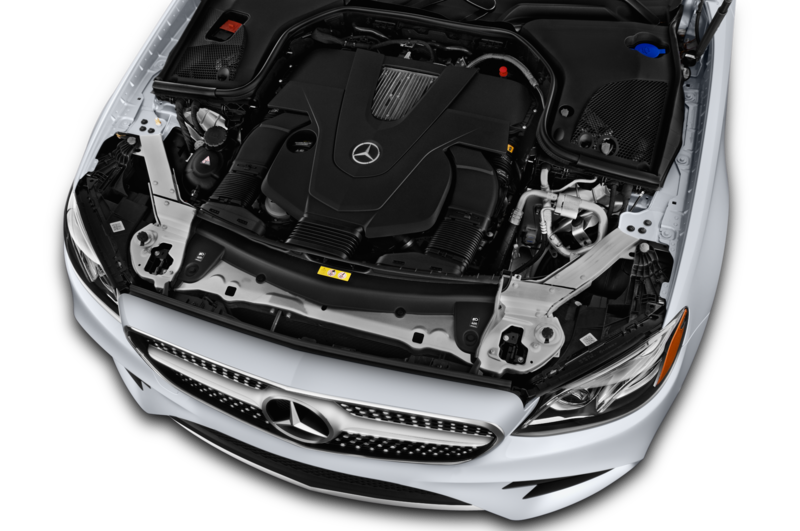 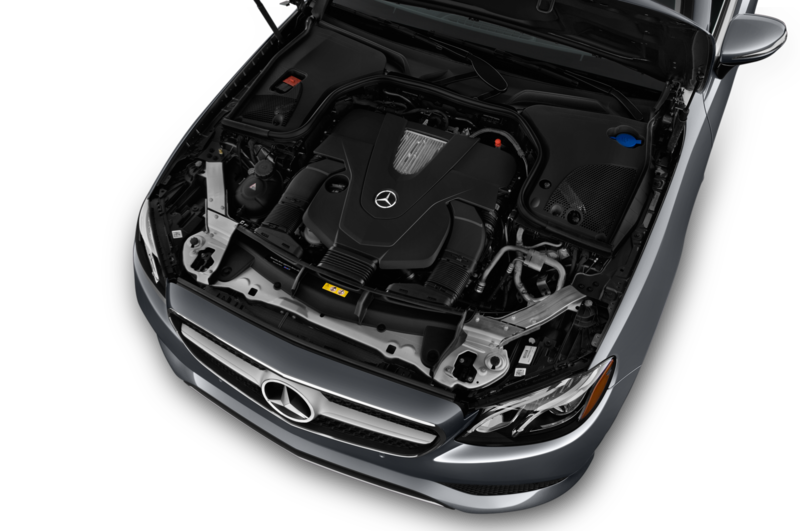 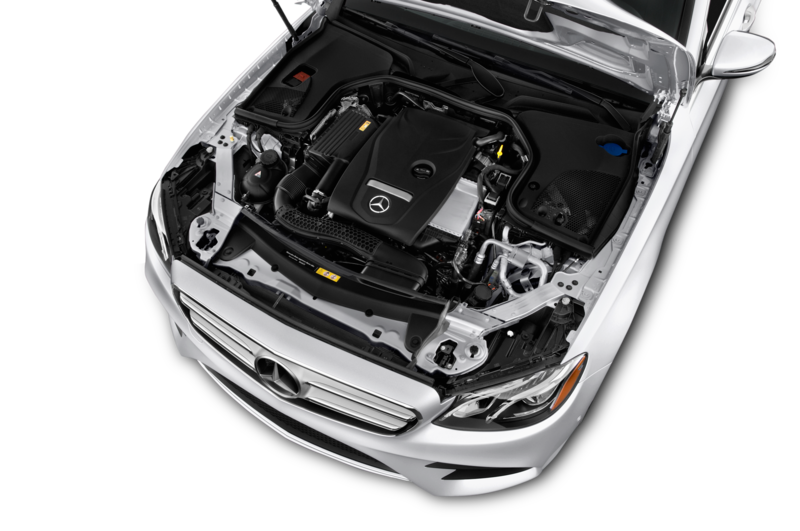 And the hardware under the hood is brilliant: A 4.0-liter V-8 with a pair of turbochargers that boost it up to 603 hp. 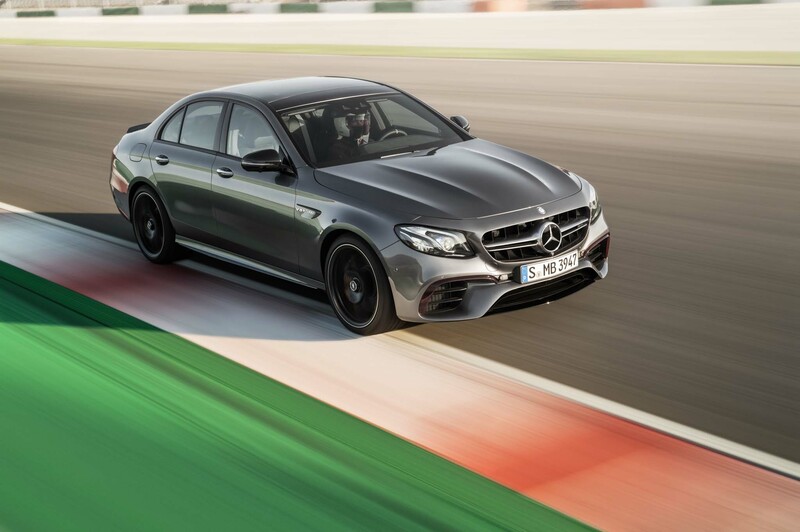 I thought I’d miss the big cubes of the old E63, but no, no, no—not only is this one faster (0-60 in 3.3 seconds, says Mercedes-AMG; our colleagues down the hall at Motor Trend timed it at 3.2), but it’s just as loud and every bit as brutal. 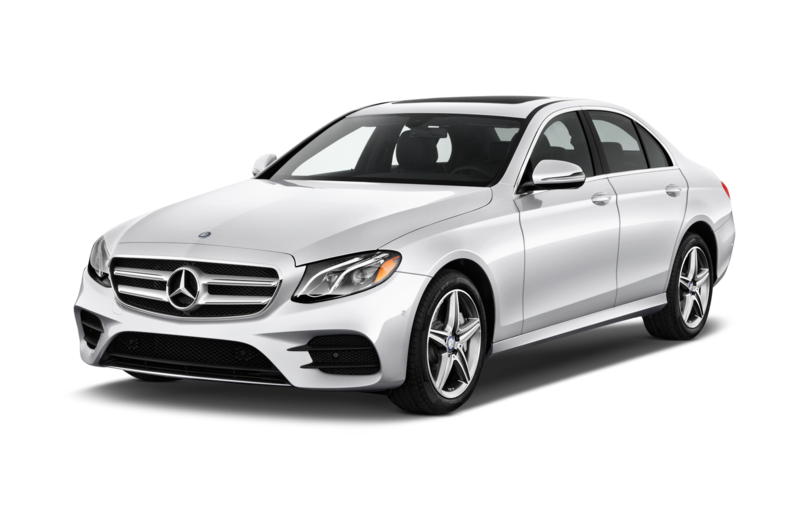 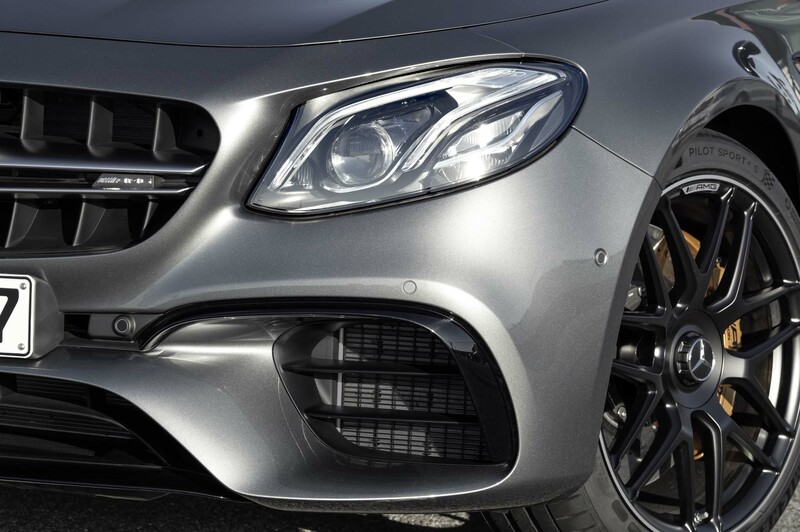 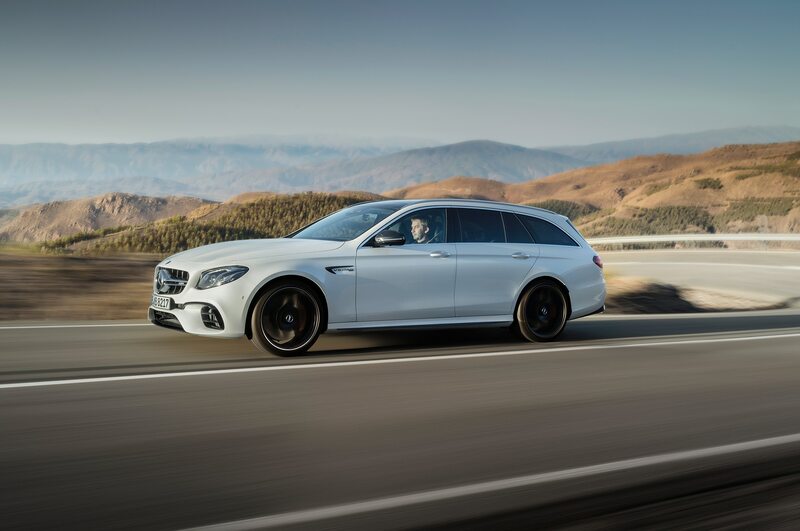 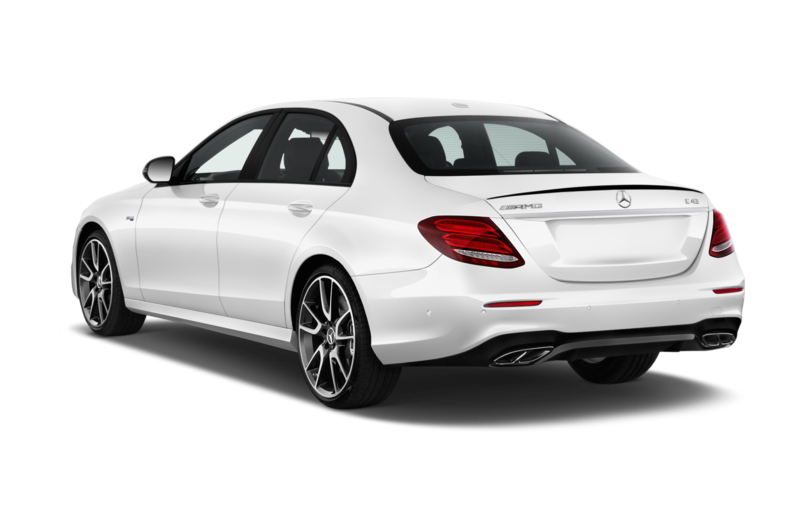 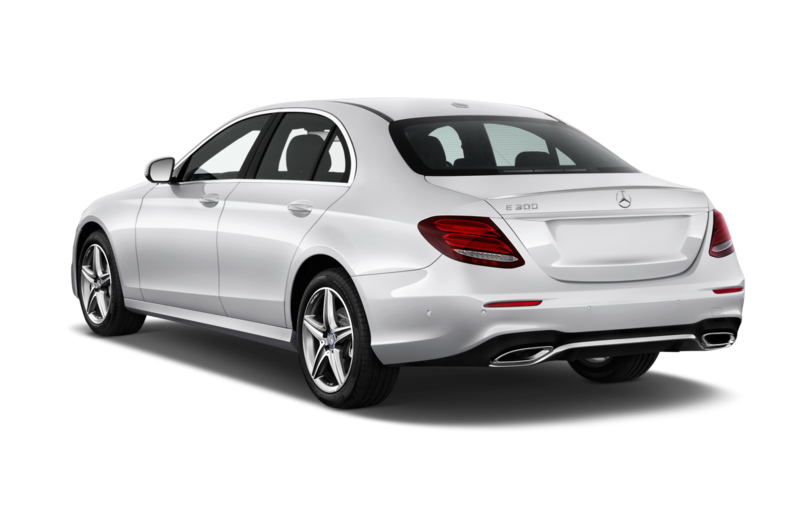 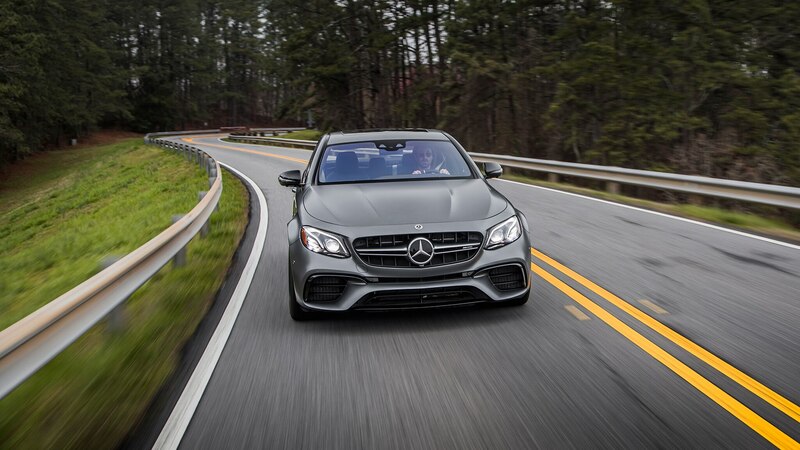 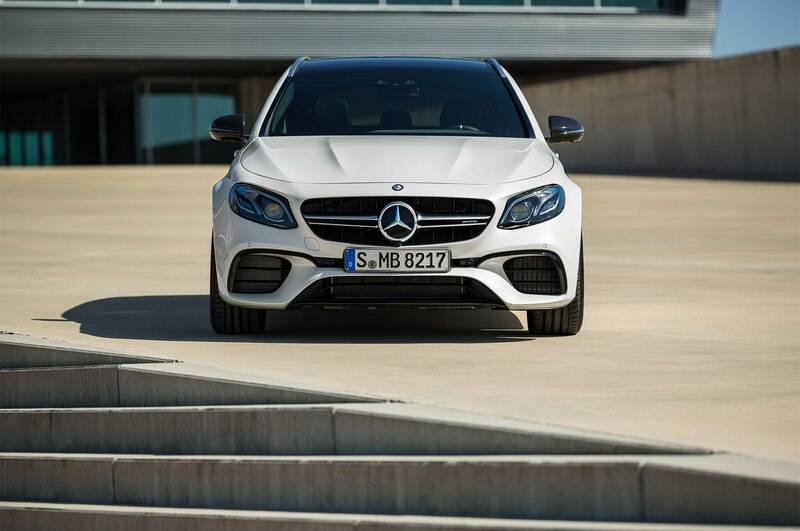 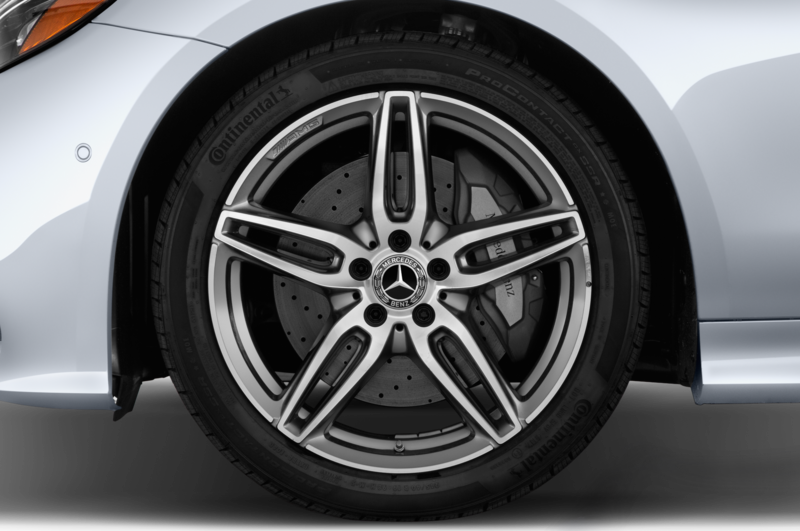 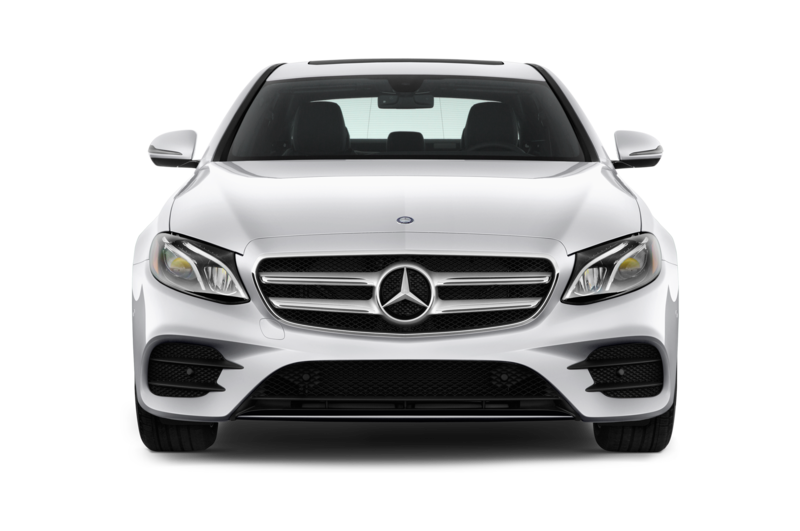 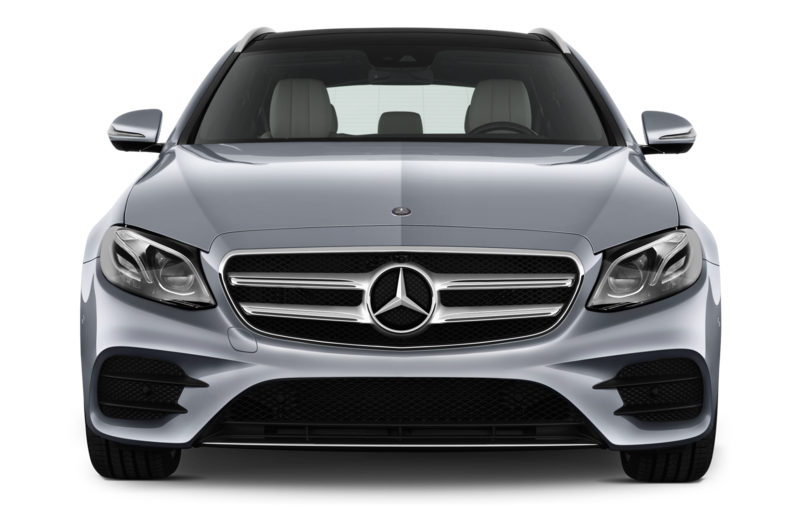 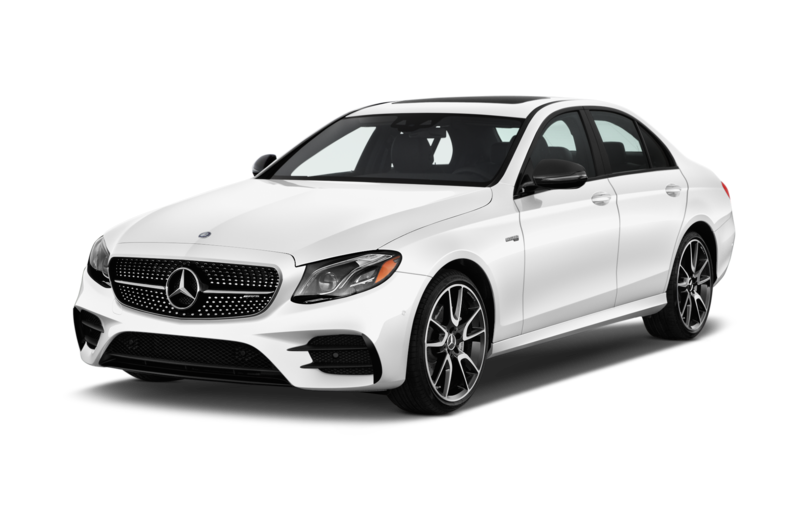 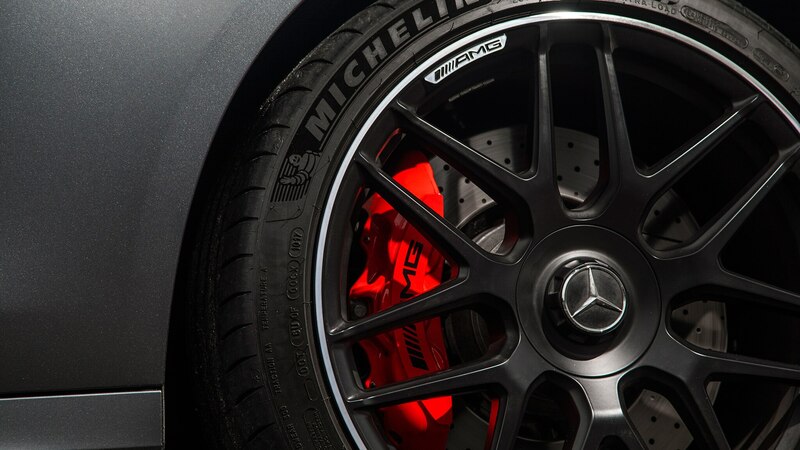 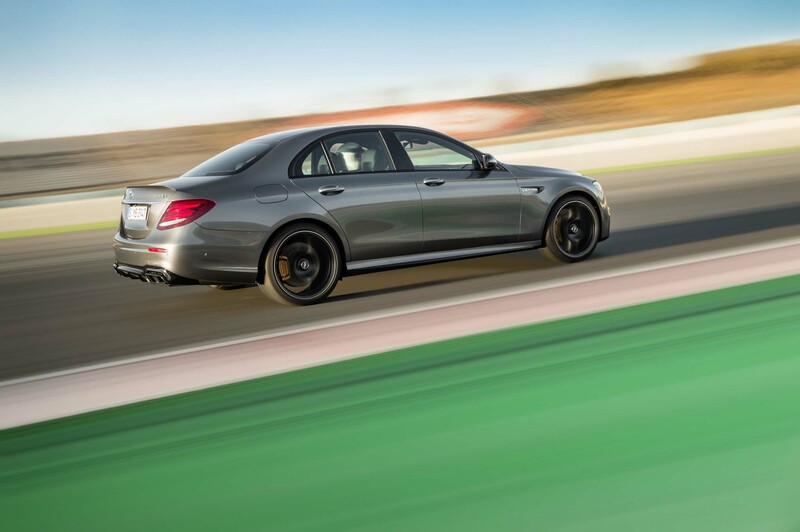 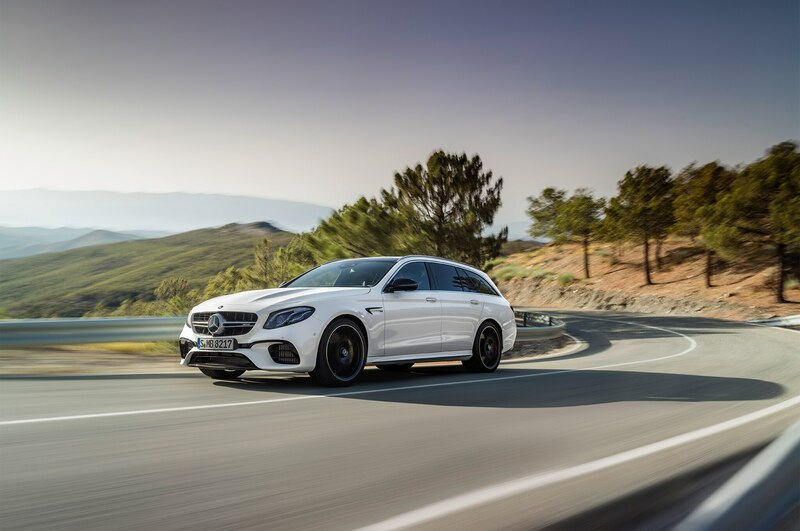 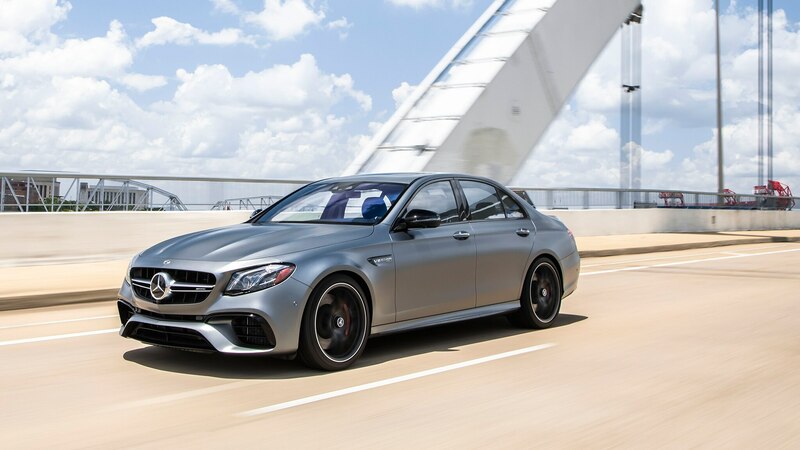 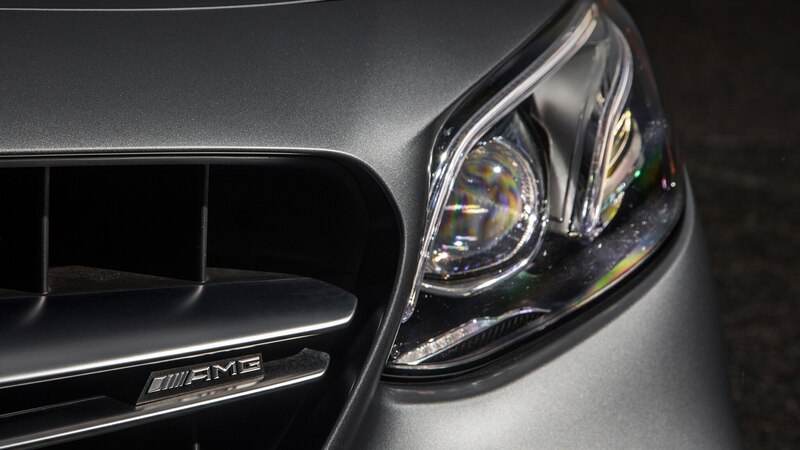 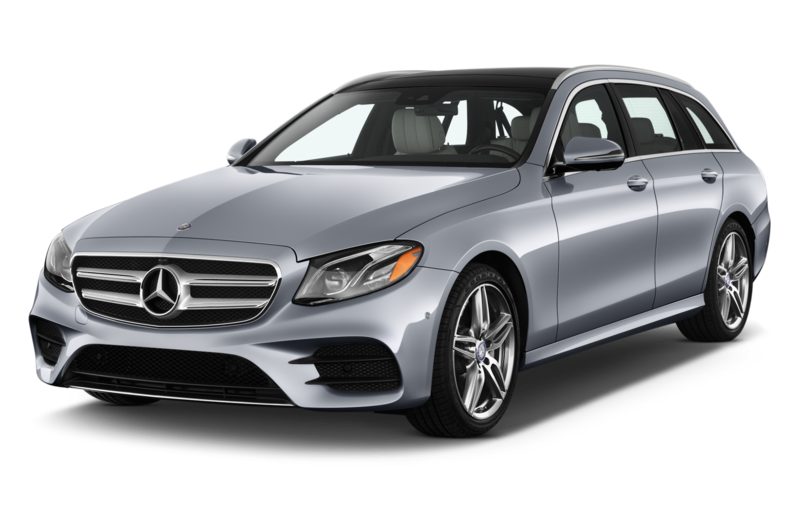 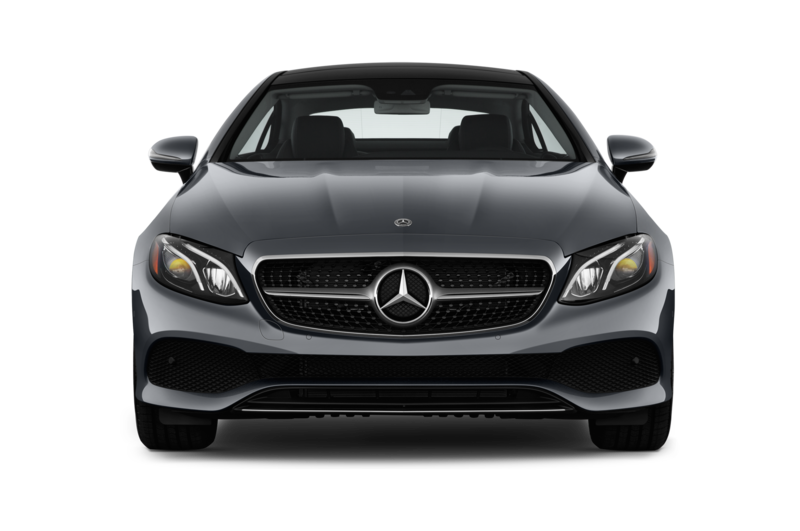 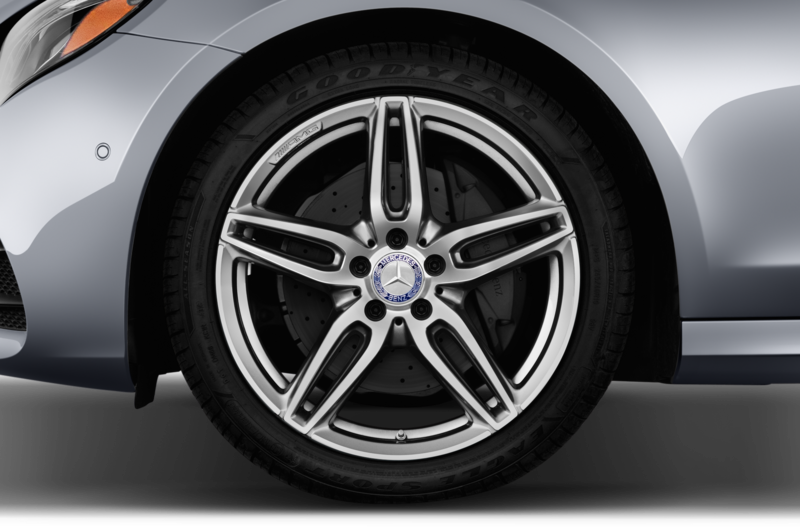 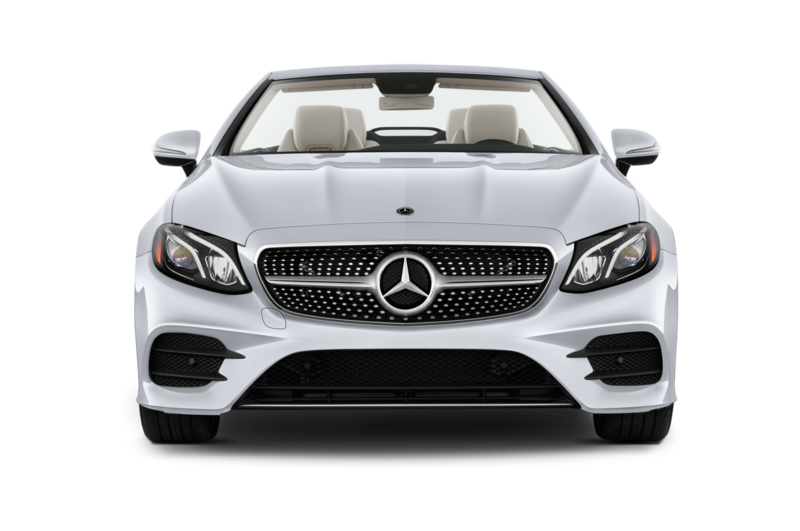 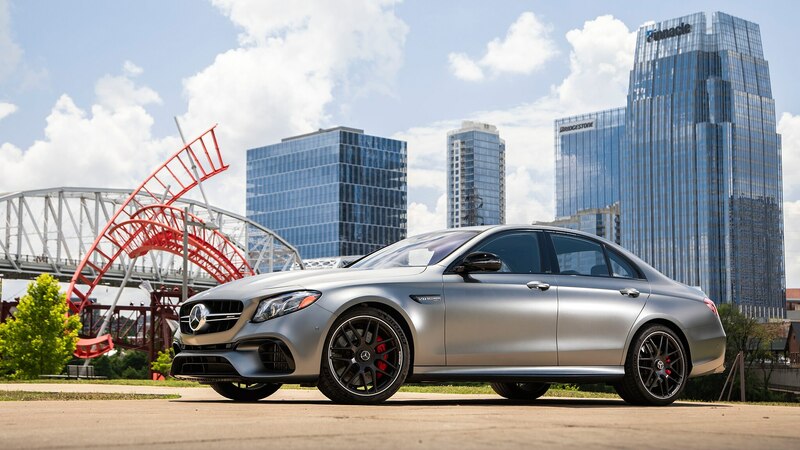 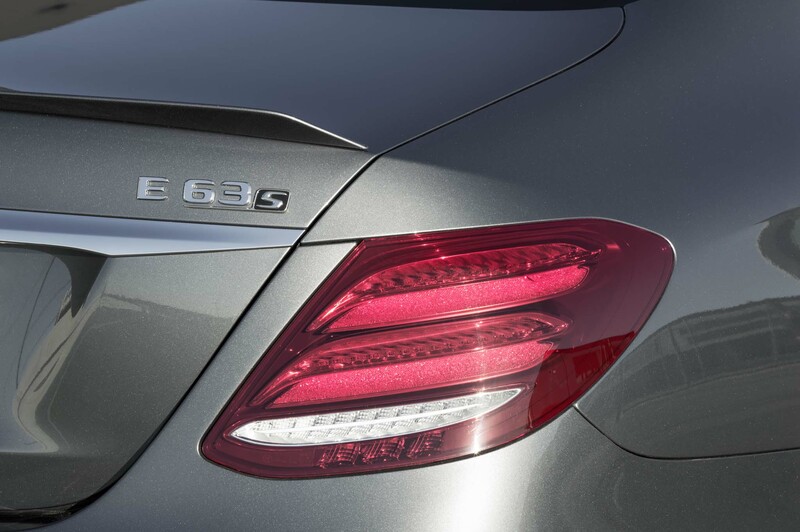 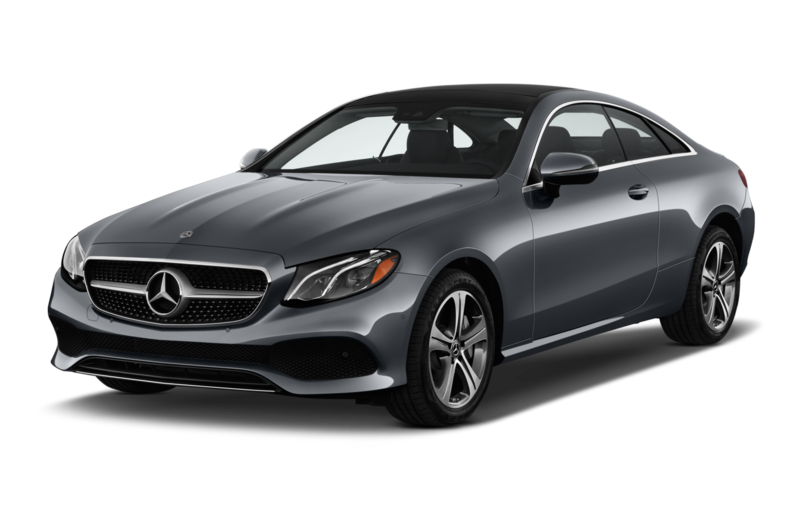 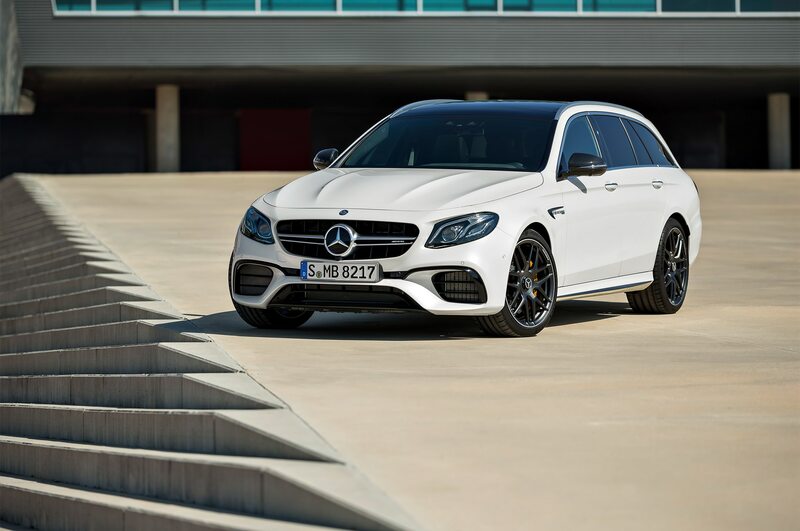 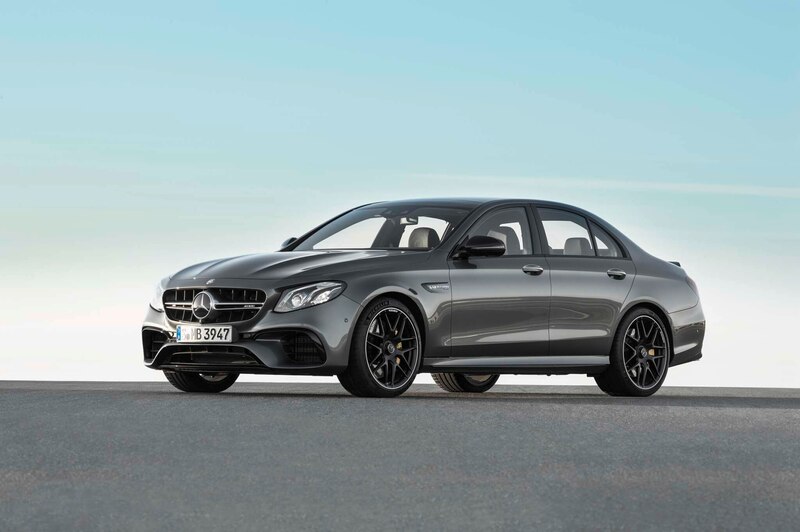 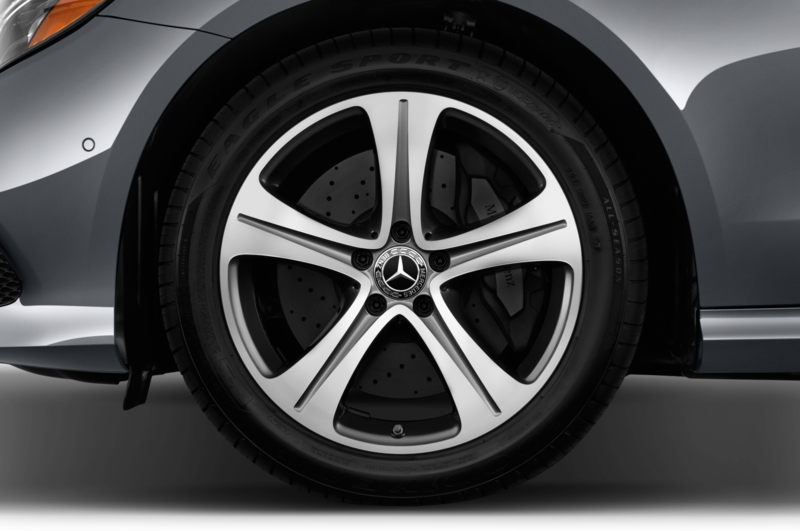 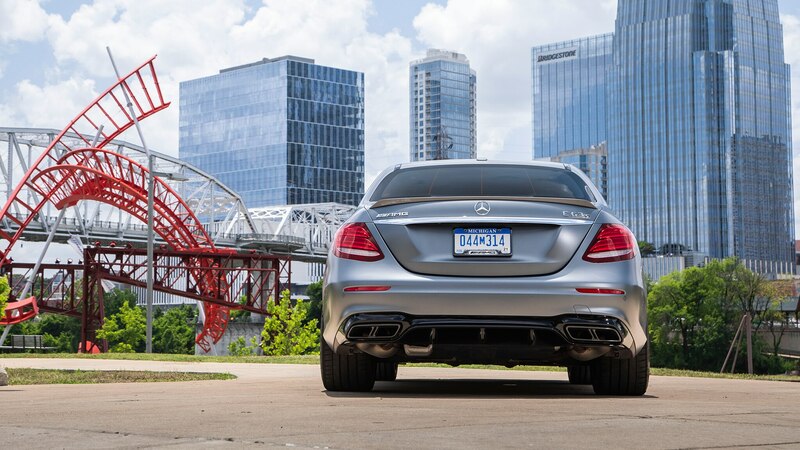 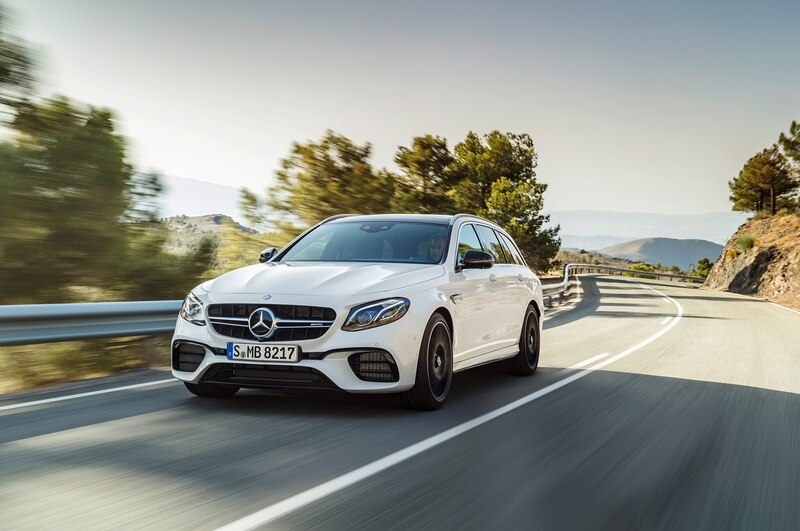 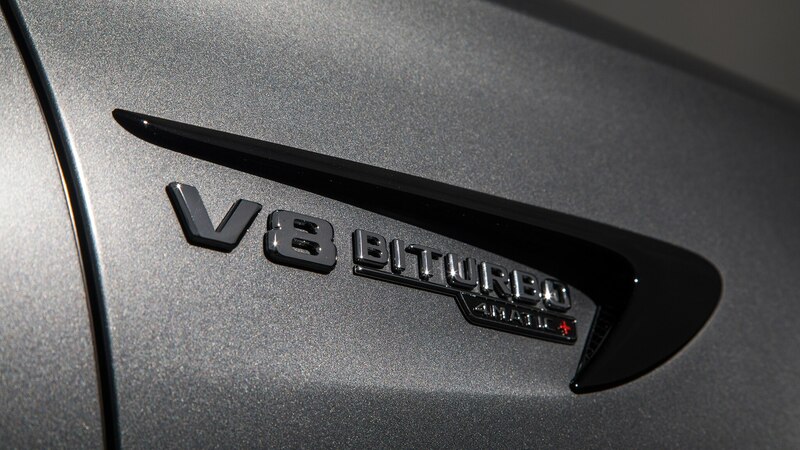 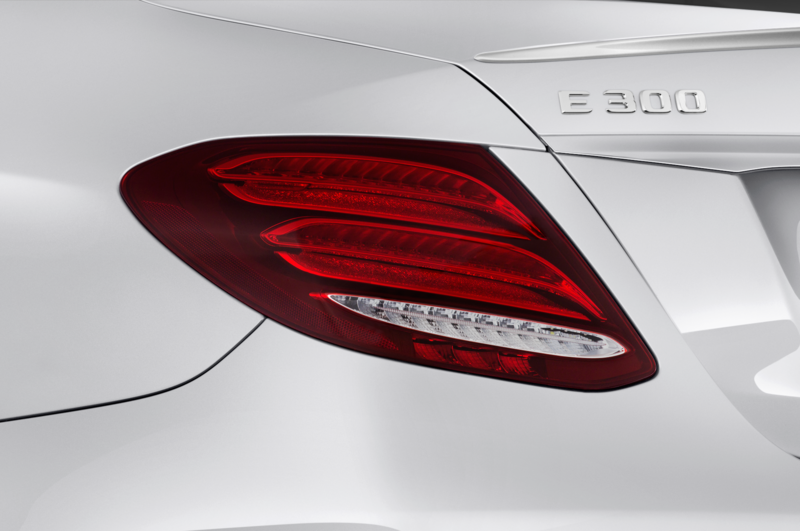 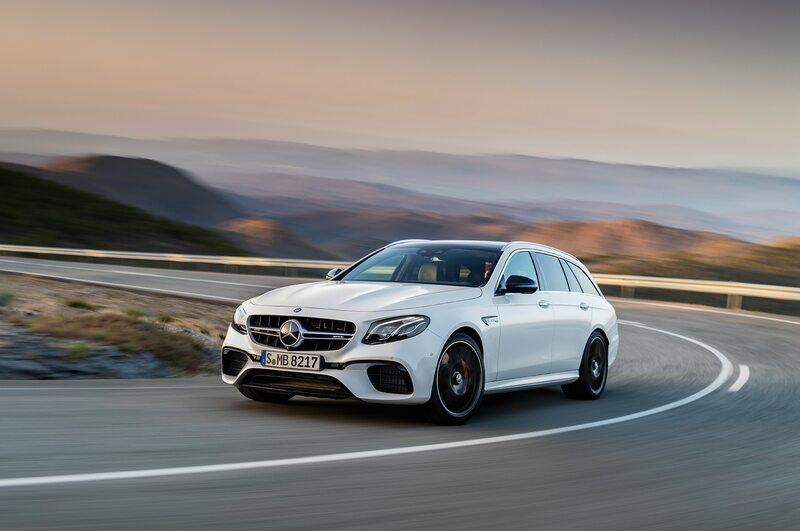 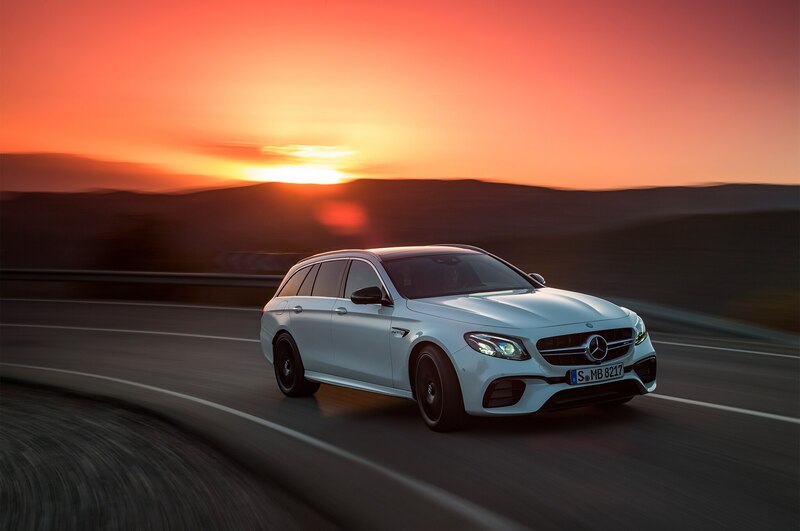 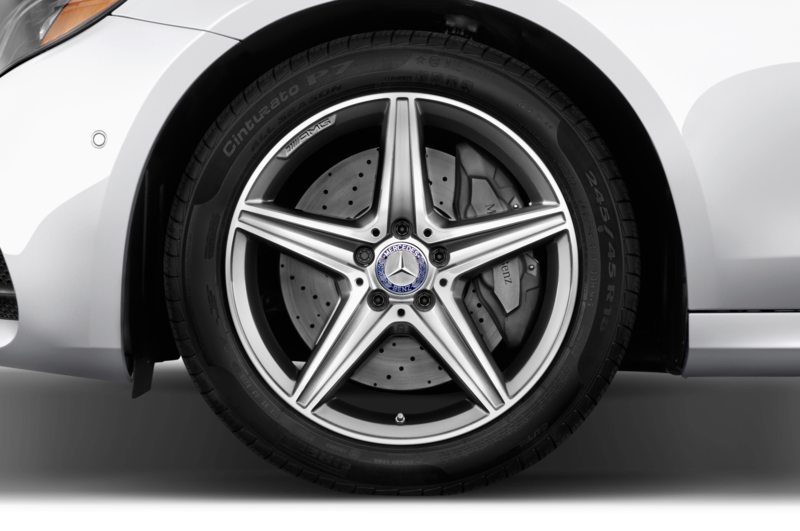 The all-wheel-drive E63 S’s nine-speed automatic uses an automated clutch in place of a torque converter in order to maximize the engine’s face-flattening potential. 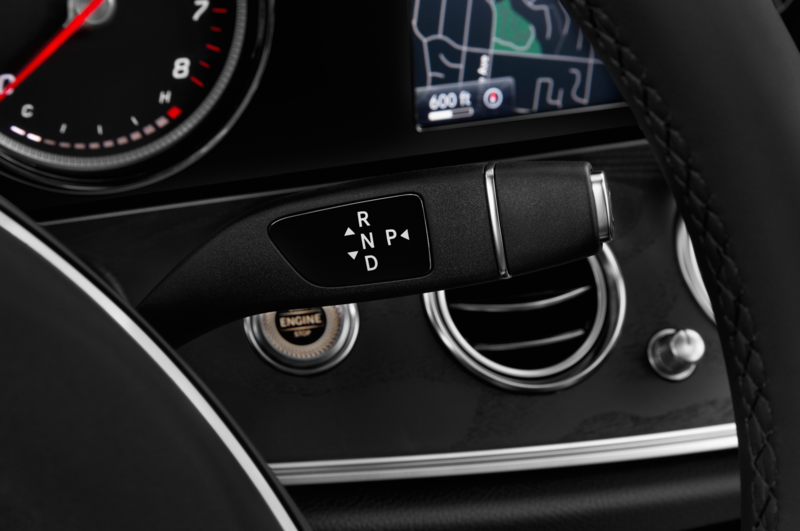 One of the most significant improvements to this all-new version is the easy-to-use launch mode. 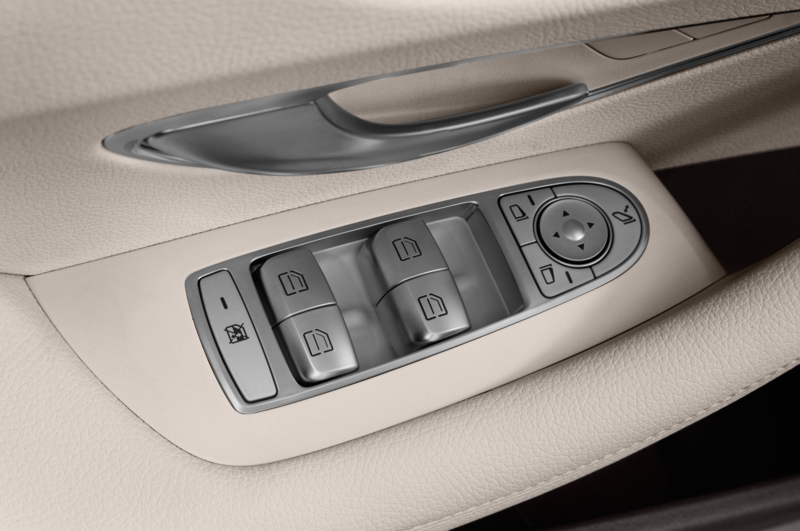 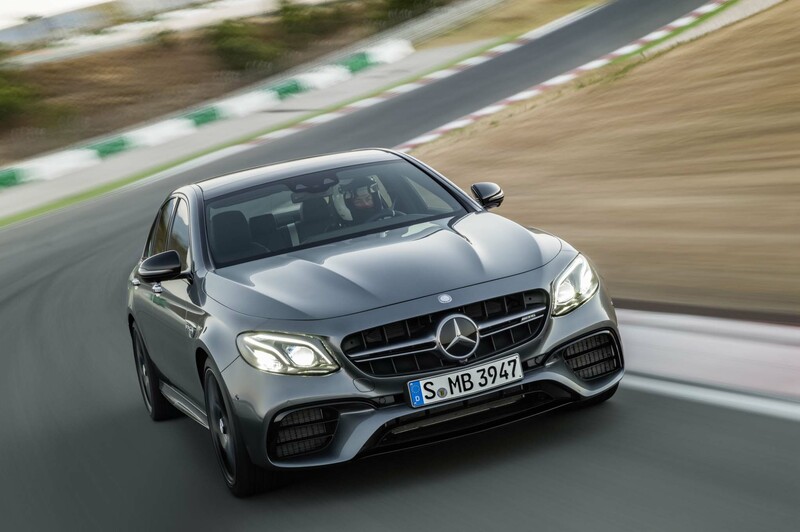 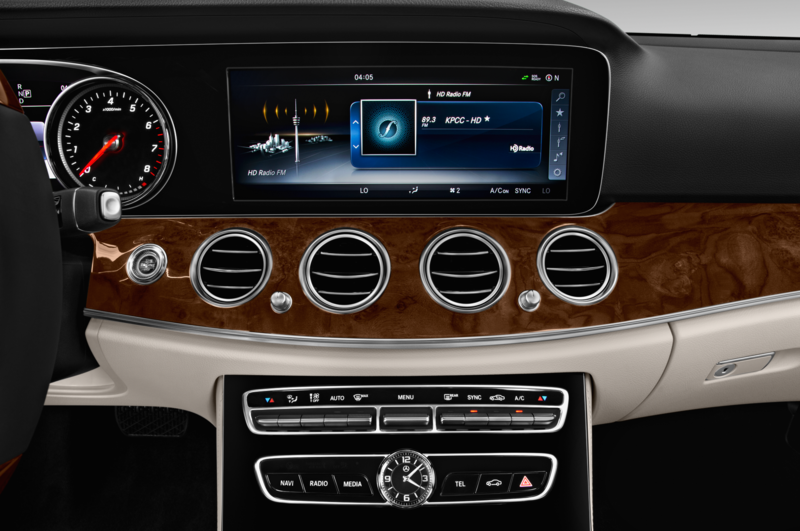 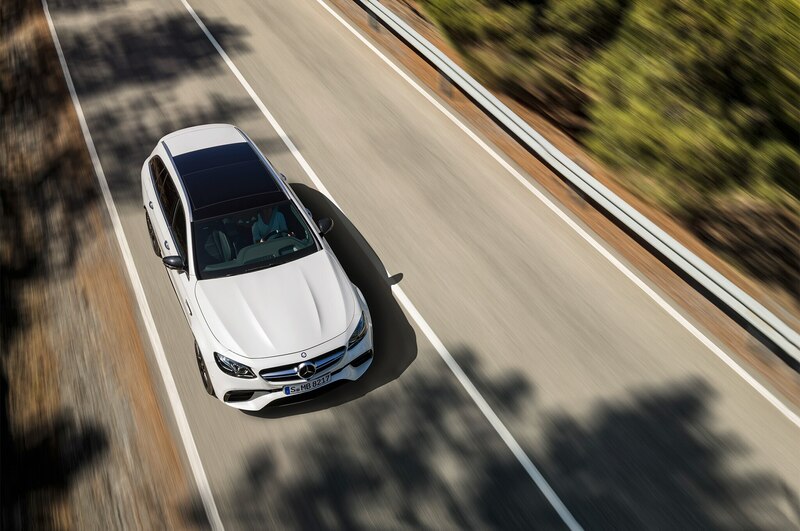 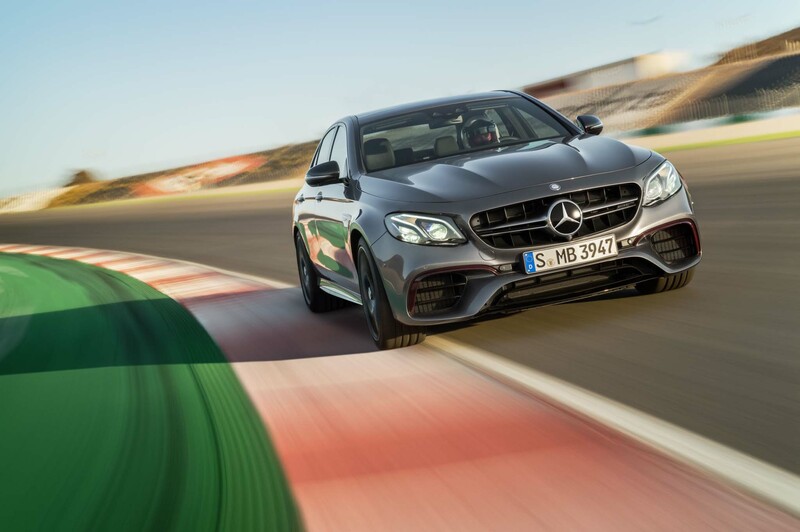 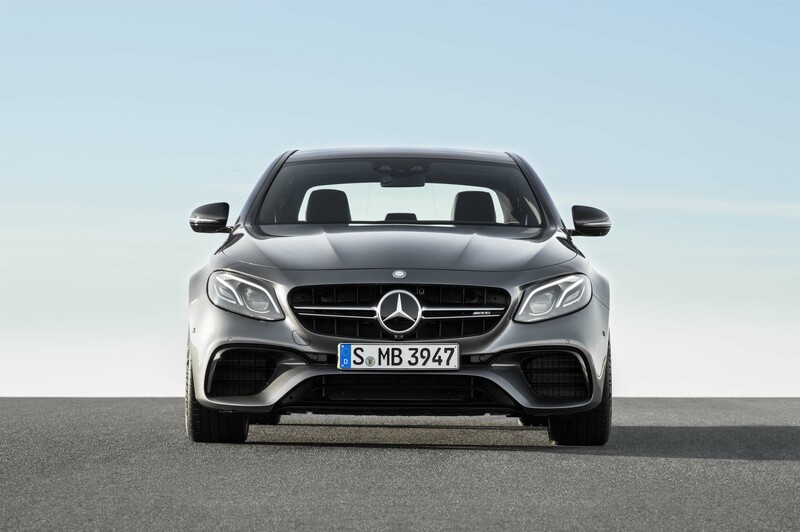 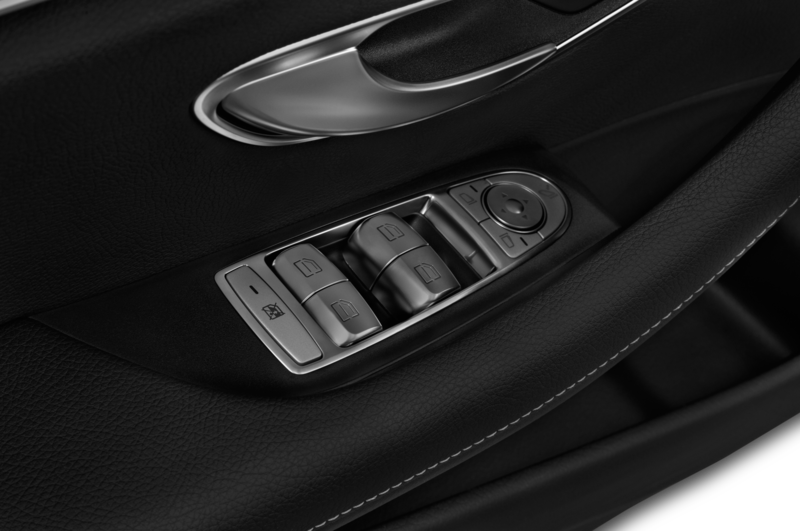 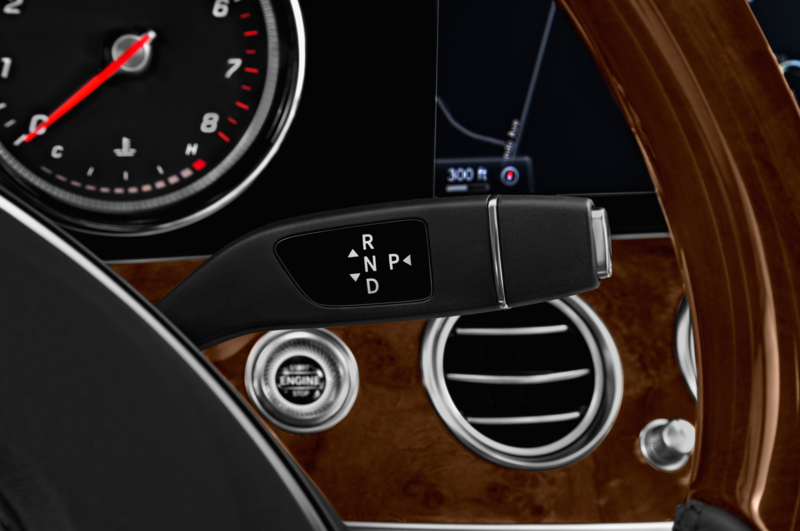 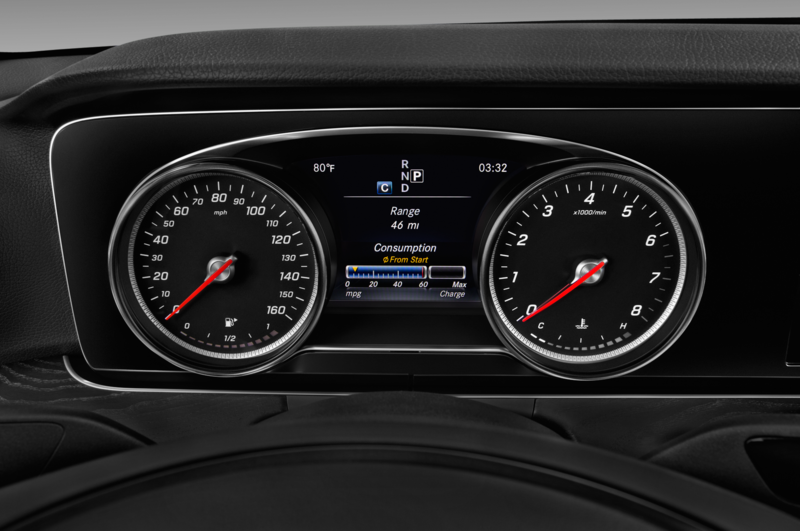 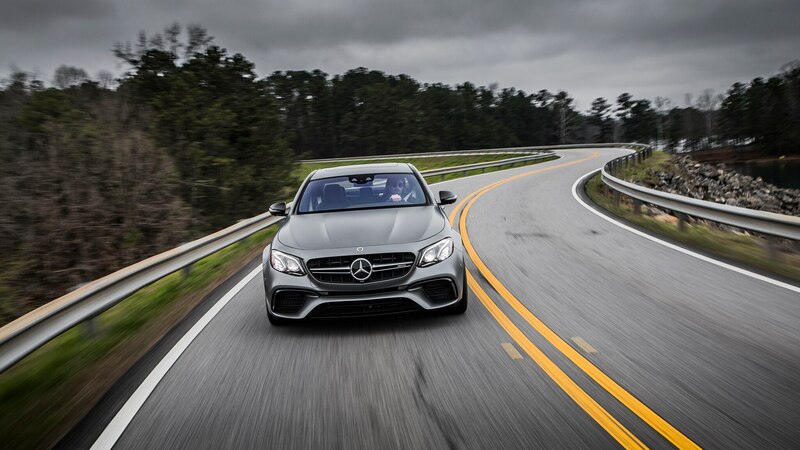 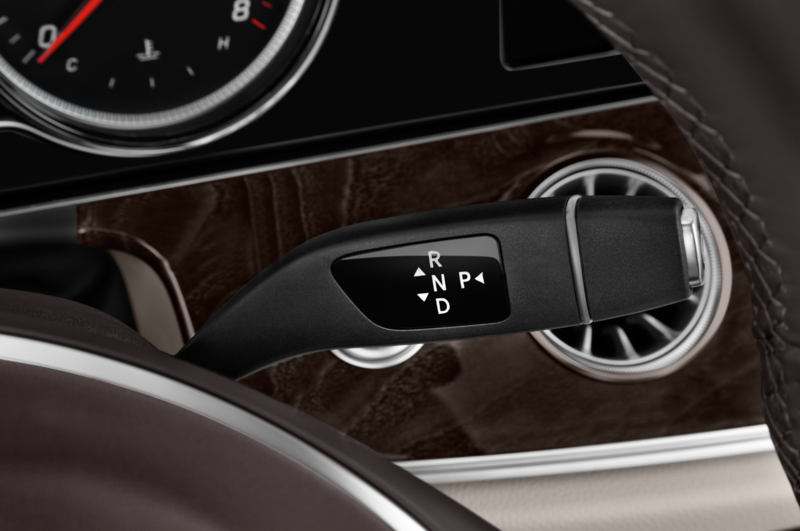 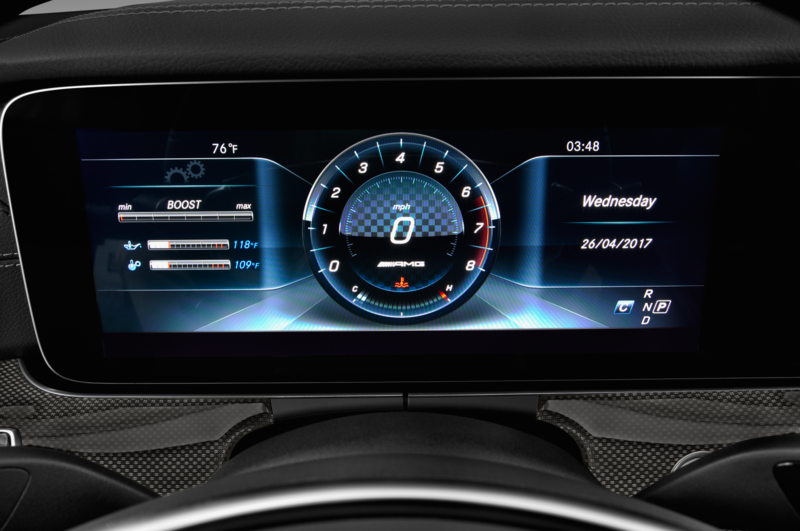 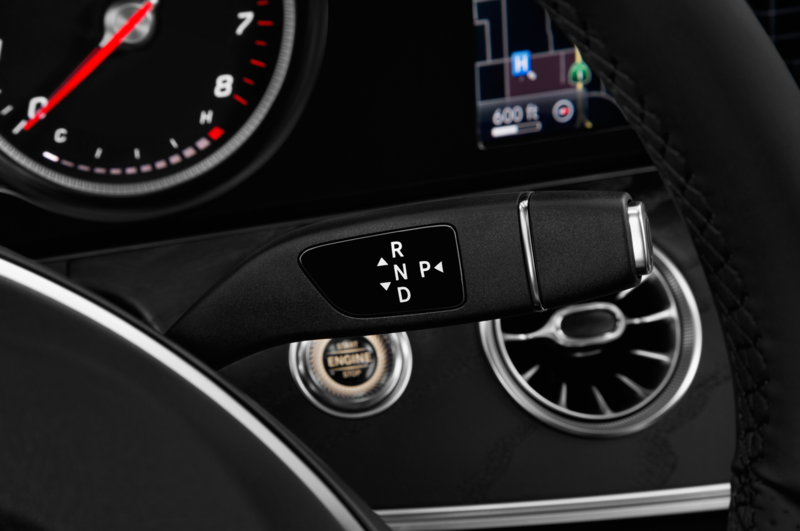 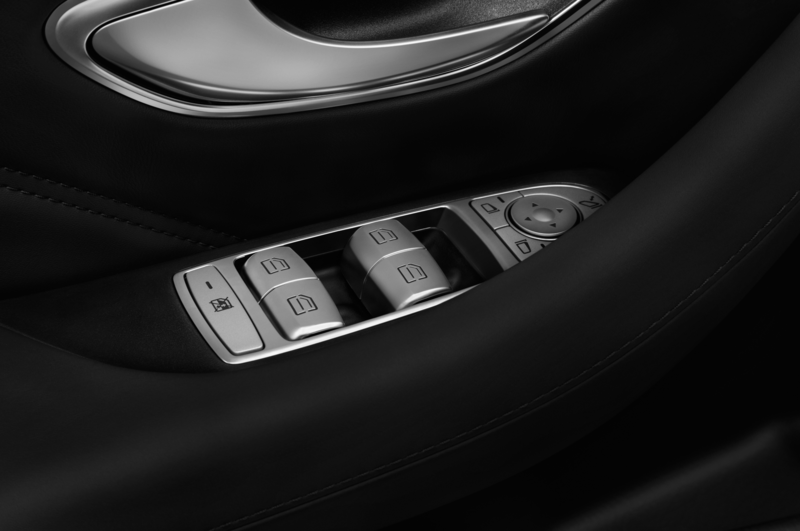 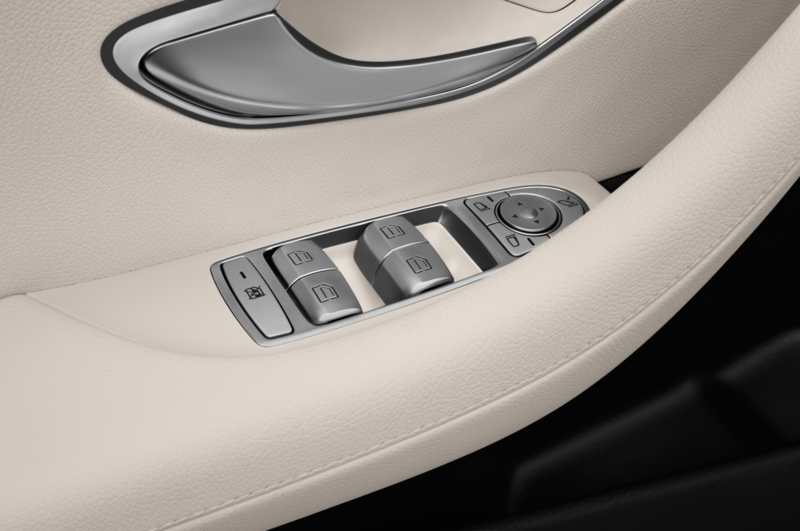 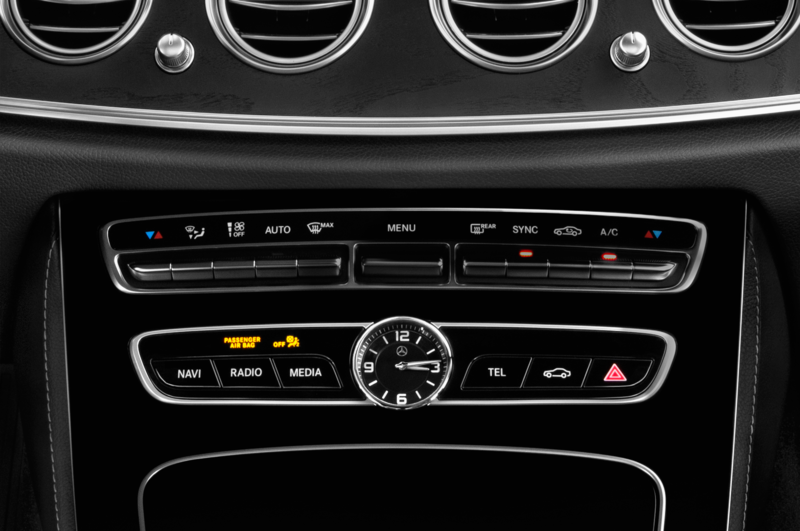 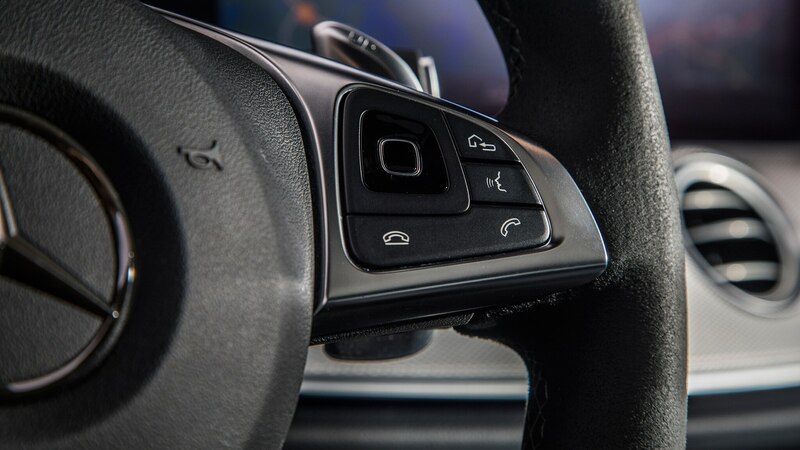 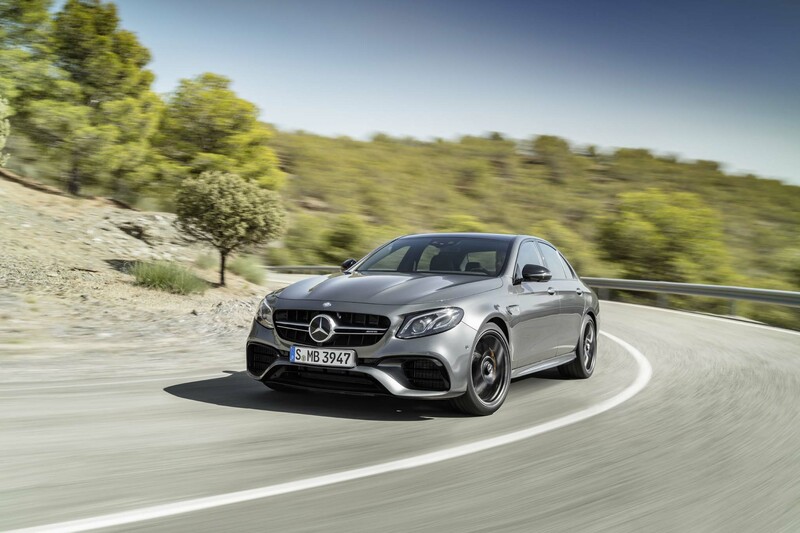 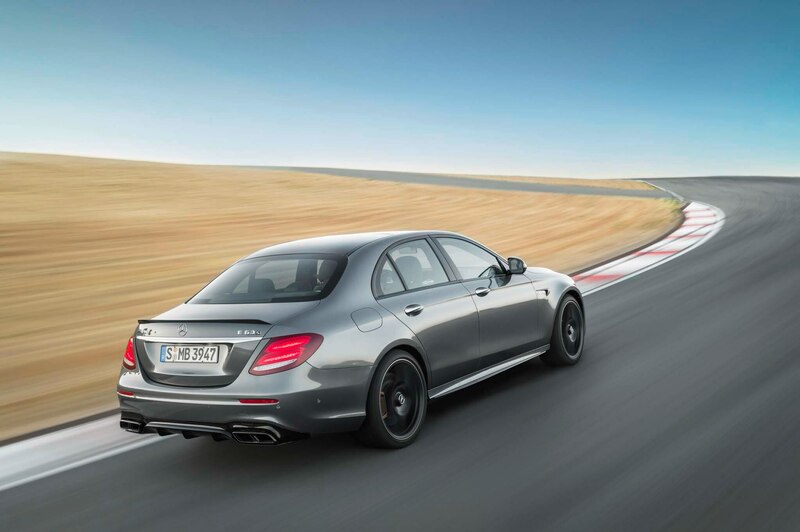 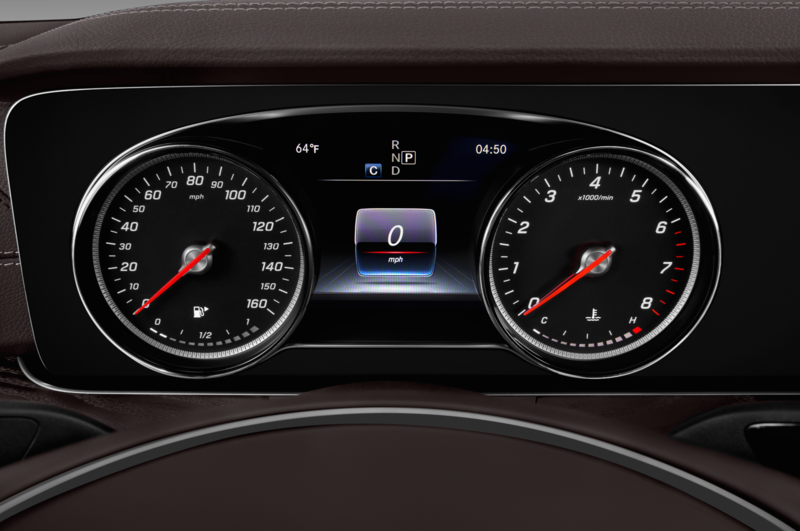 The outgoing E63 required an incomprehensible sequence of button-pushing and paddle-pulling, but the new car makes it simple: Turn the drive-mode controller to Race, push the brake pedal to the floor, and mat the accelerator. 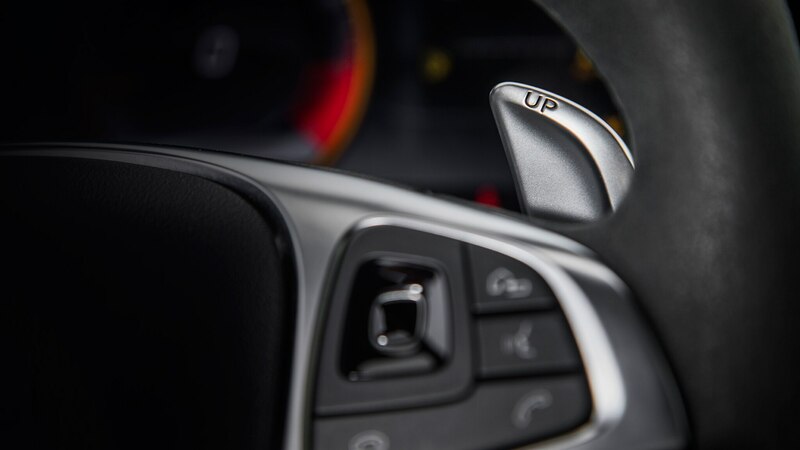 Release the brake, hang on tight, and start thinking up excuses to give the police. 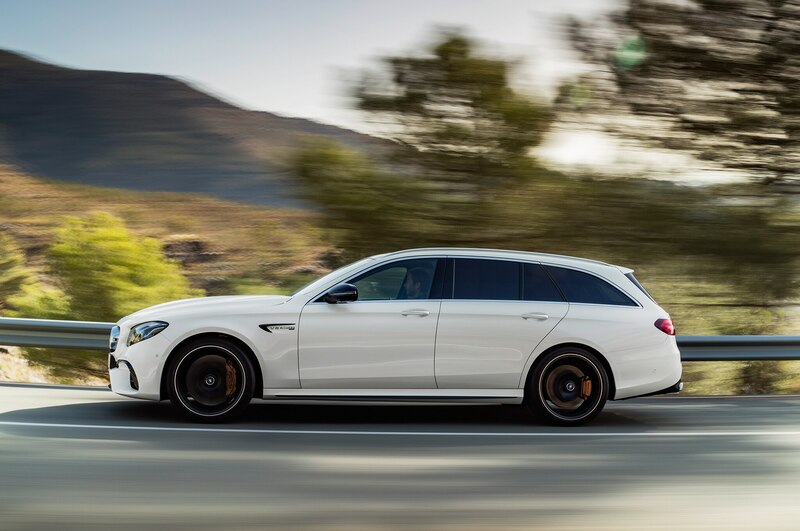 What I’d been told about new the E63 S was that, unlike the older iteration I drove, it wasn’t just a straight-line muscle car. 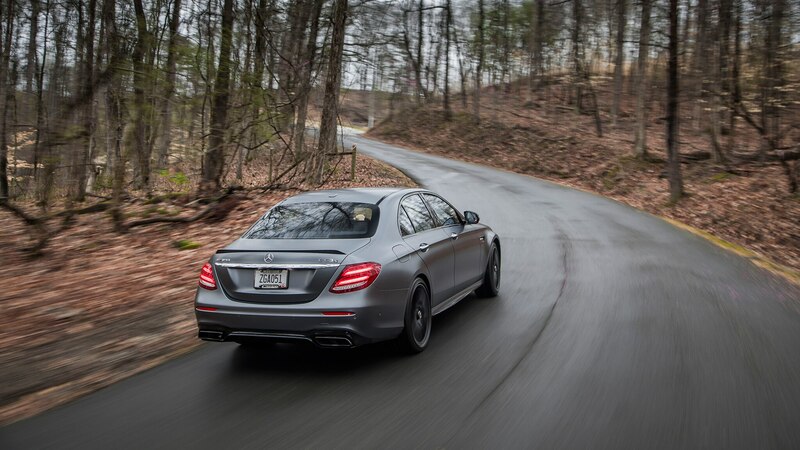 So I made a beeline for my favorite twisty canyon roads, and while the ride out there was miserable—more on that shortly—the drive in the curves was exhilarating. 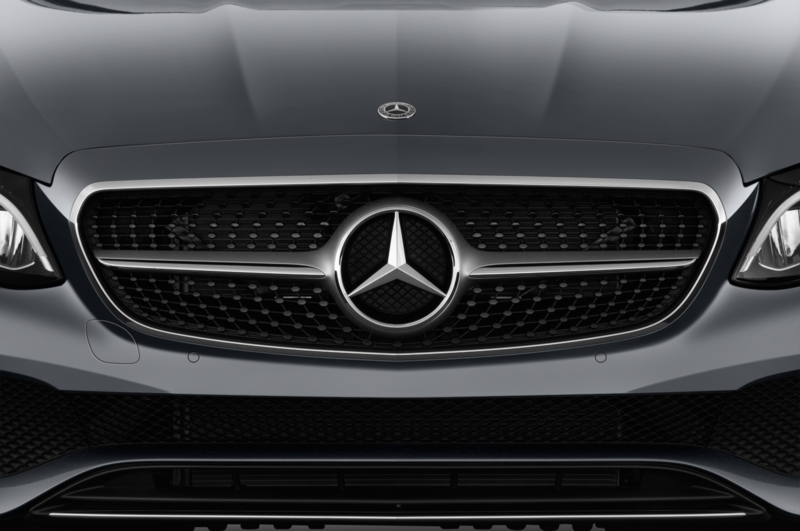 I wish I could give you an Andy Pilgrim-like report of which corners are underdamped and which tires were showing signs of heating up first, but the bald-faced truth is that I pushed the hot-rod Mercedes as fast as I dared on the roads I know best, and the most I could eke out was a wee bit of understeer and a sympathetic screeching from the tires (and I’m pretty sure they were only doing that to make me feel better). 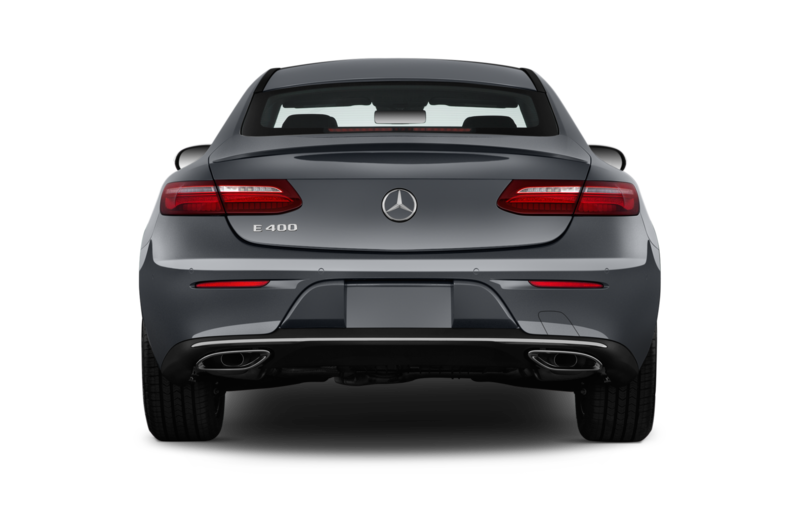 I did get the rear end to step out once, and this required a particularly sharp turn, glass-smooth pavement, and the willingness to soil a perfectly good pair of trousers. 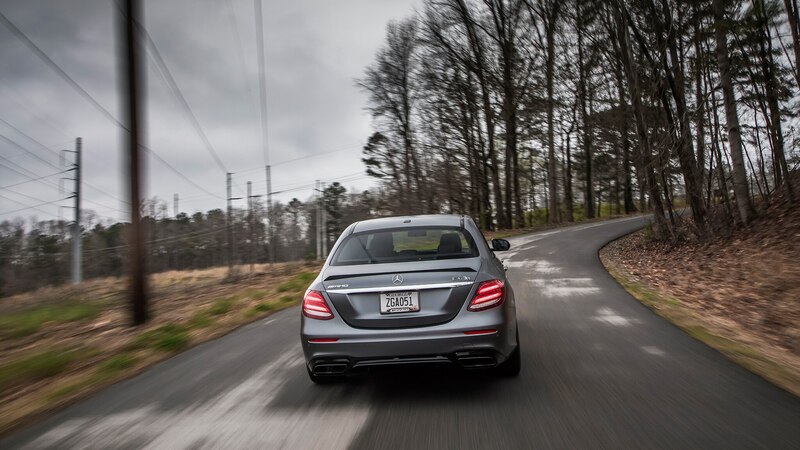 It was obvious that however fast I wanted to go, the Mercedes was happy to go faster. 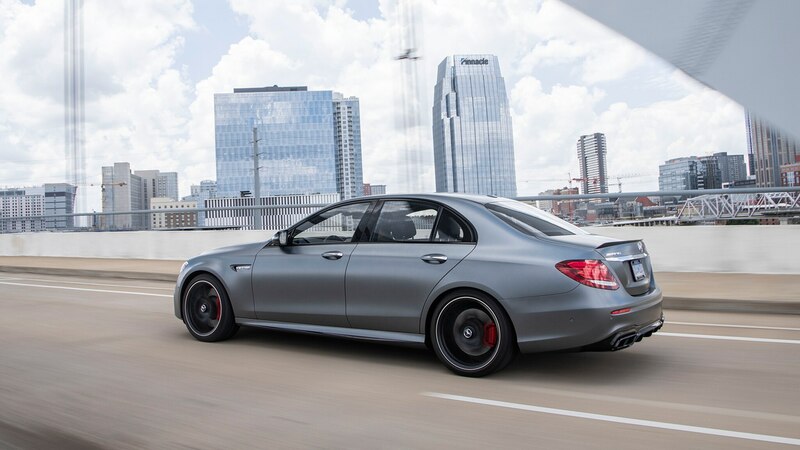 With the fear factor approaching a level I’ve not experienced since my high school girlfriend told me a certain recurring biological event had not shown up on its anticipated schedule, I eased back my speed a bit, opened the windows, and enjoyed the lovely burbling and backfiring of the exhaust as it echoed off the canyon walls. 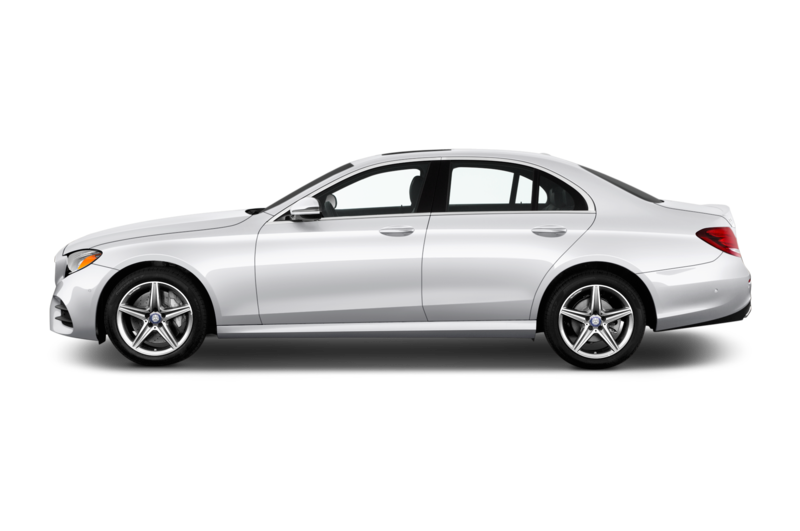 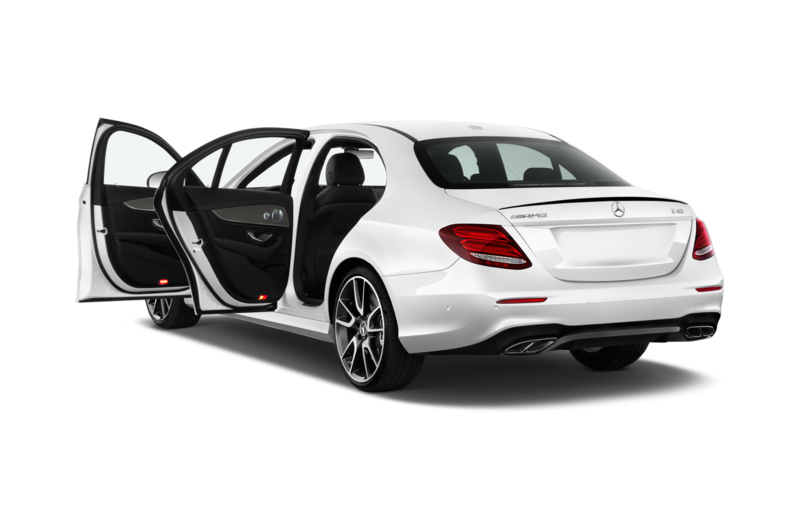 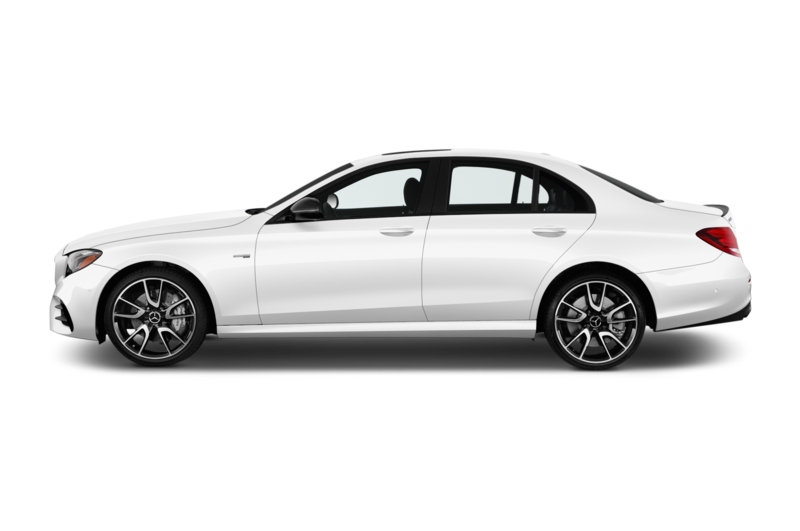 I came away with two key takeaways about the E63 S (I dare not label them as problems, as a better driver might disagree). 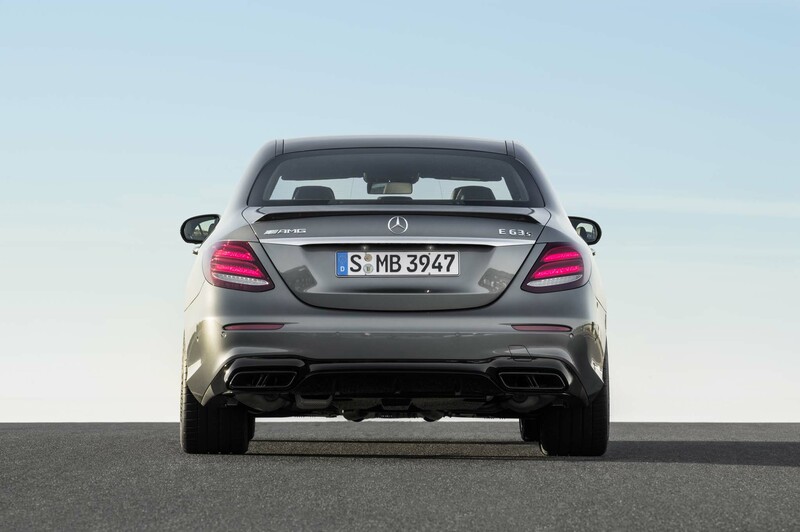 First was a tendency for the stability control system to trip a little early. 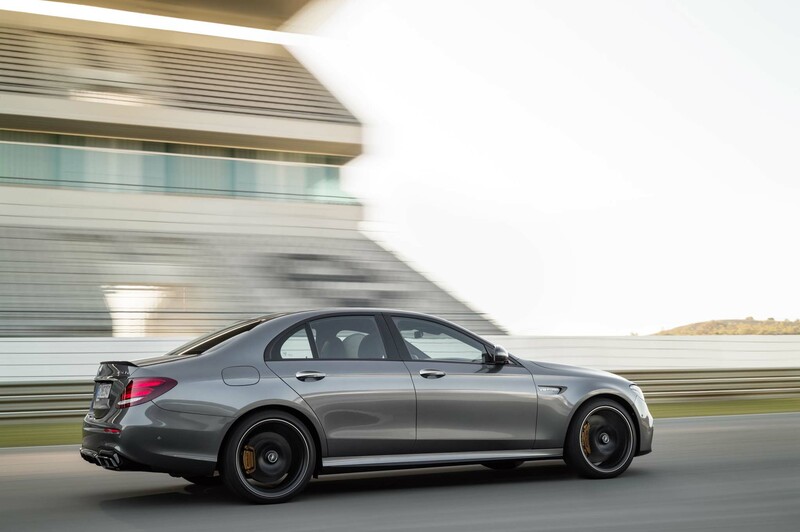 Of the three performance driving modes—Sport, Sport Plus, and Race—only the latter uses the stability control’s performance program. 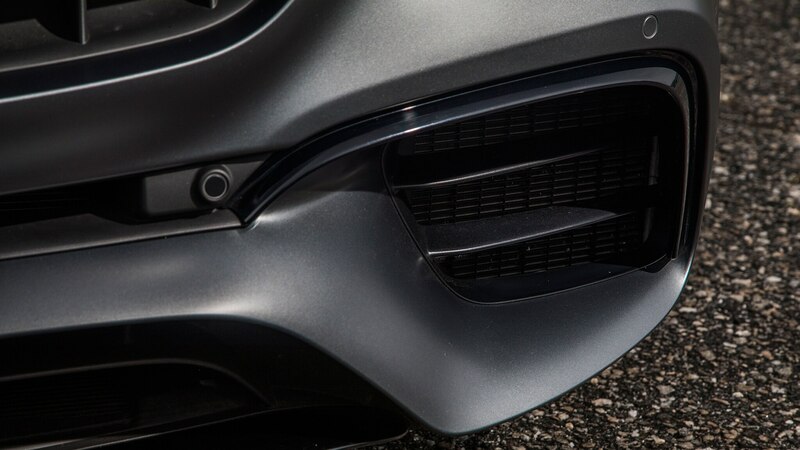 Fire into a corner too fast (a bad habit of mine) and it’s easy to trigger just a smidge of understeer, but that smidge is enough to cause the ESC system to dial back the power. 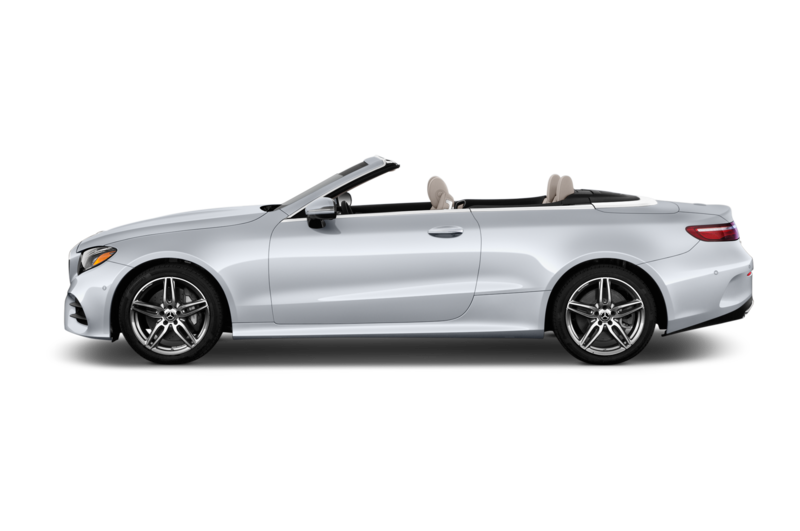 Selecting Race mode solved the problem, and those smidges never developed into anything bigger; still, what with the cliff walls on one side and drop-offs on the other, I’d prefer something in the middle between full-on nanny and a liberally-minded track program. 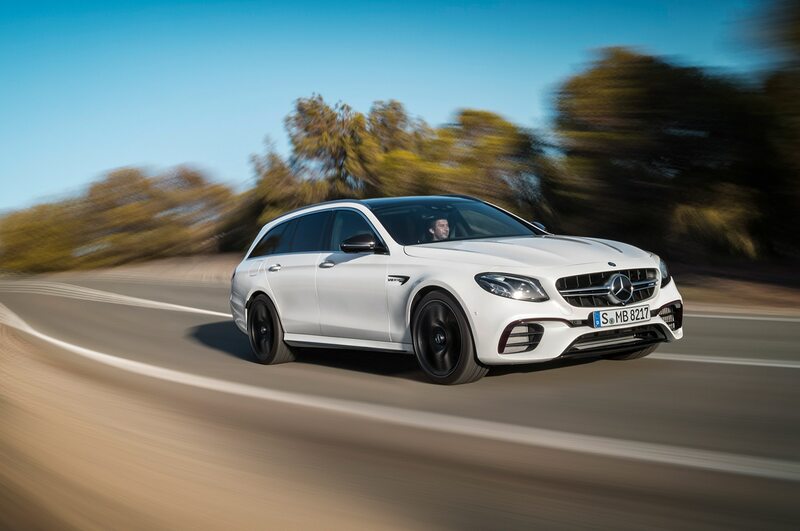 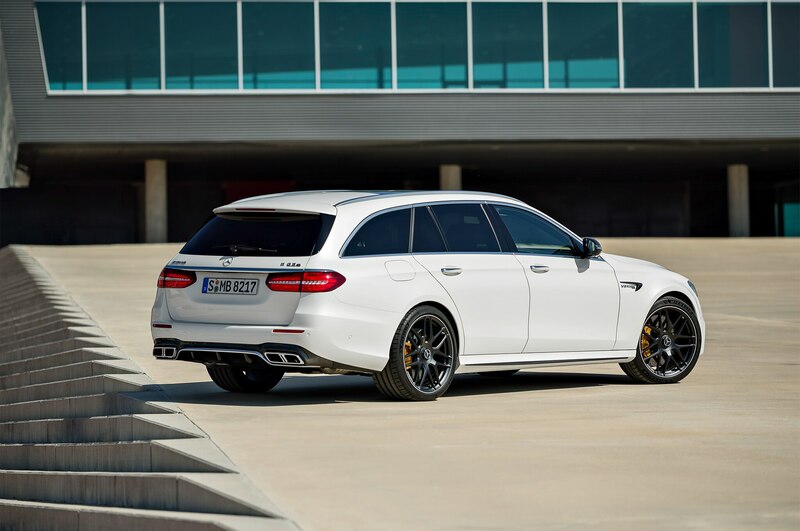 This is as good a place as any to note that the E63 S also has a Drift mode, which sends 100 percent of the engine’s power to the rear wheels and requires stability control to be switched fully off. 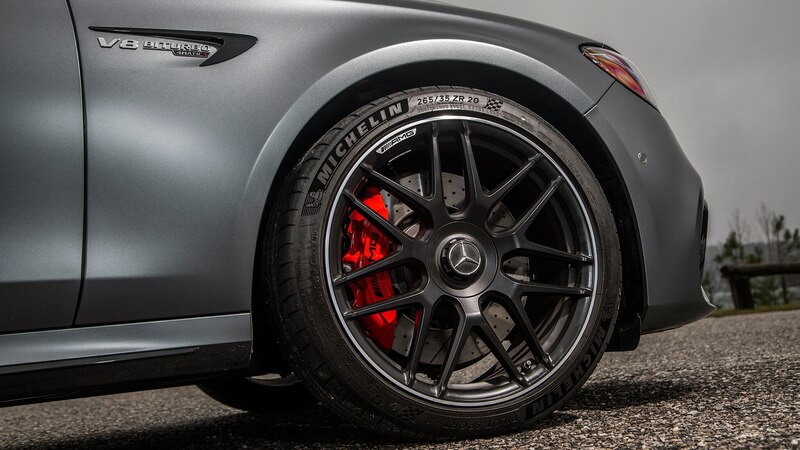 I didn’t dare. 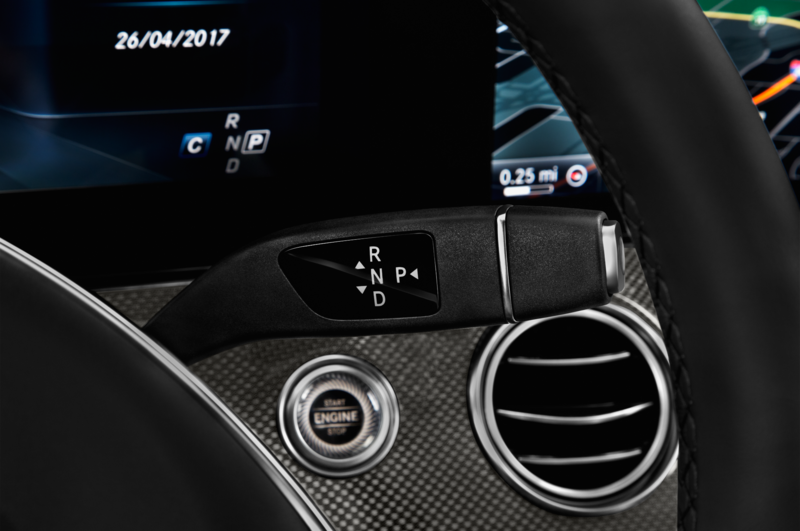 Issue No. 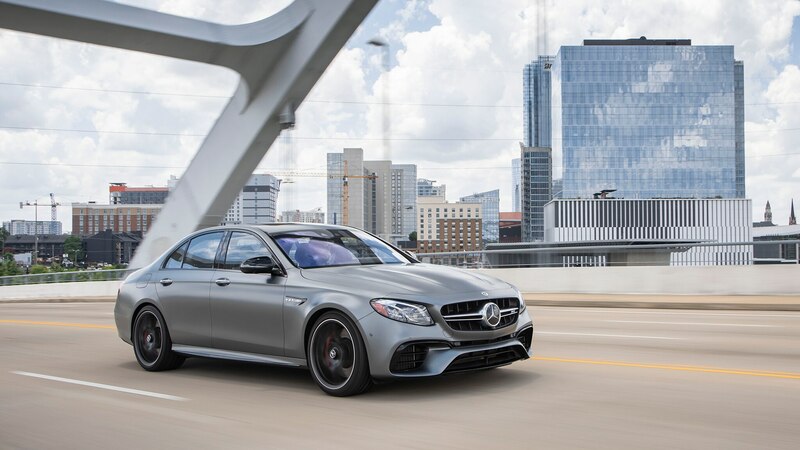 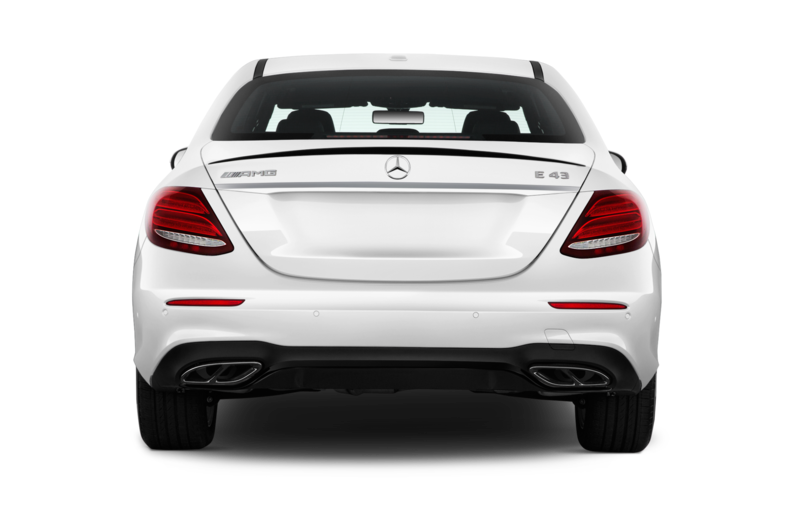 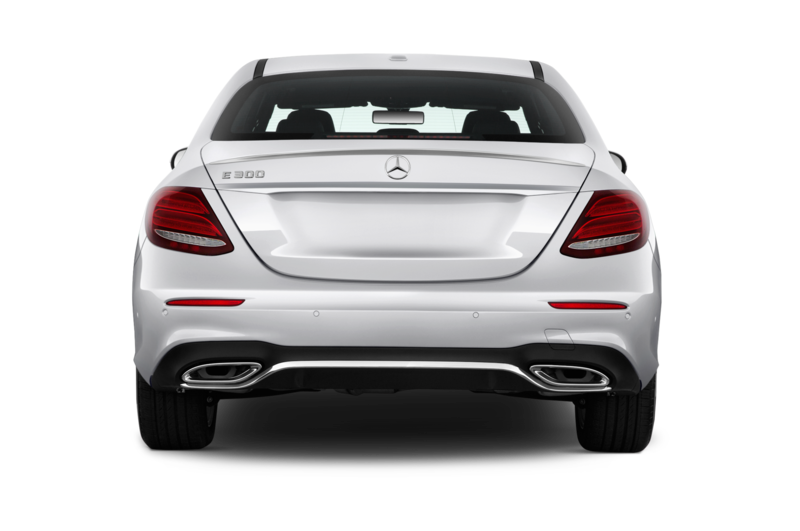 2 is the E63 S is hyper-responsive, as a racing-inspired street car should be, but unless you’re super-smooth on the controls, it’s easy to feed in a bit too much steering, gas, or brake. 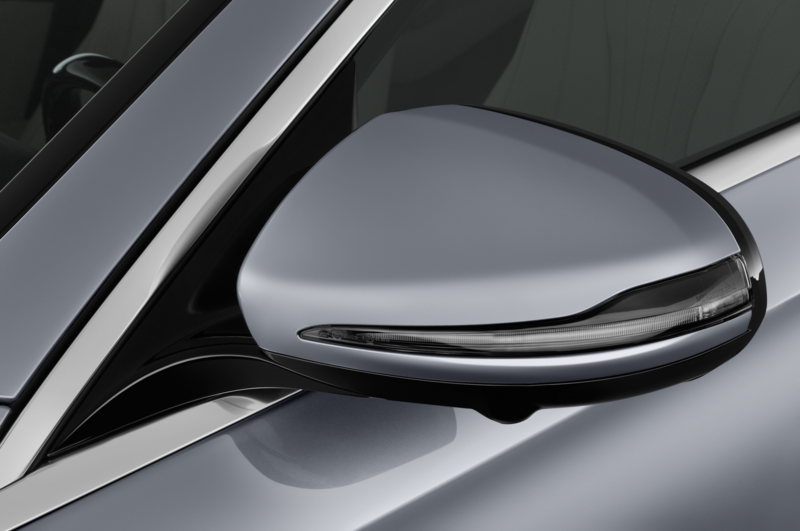 This has always been a challenge for me, and my early progress up some of the twistier bits was far jerkier than I would care to admit. 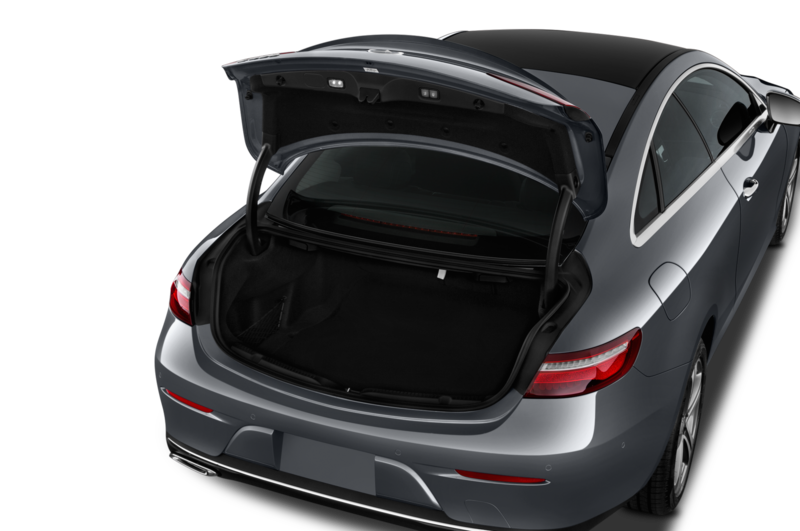 Good thing I was well within the car’s prodigious handling envelope; goodness knows what my less-than-ideal technique was doing for weight transfer. 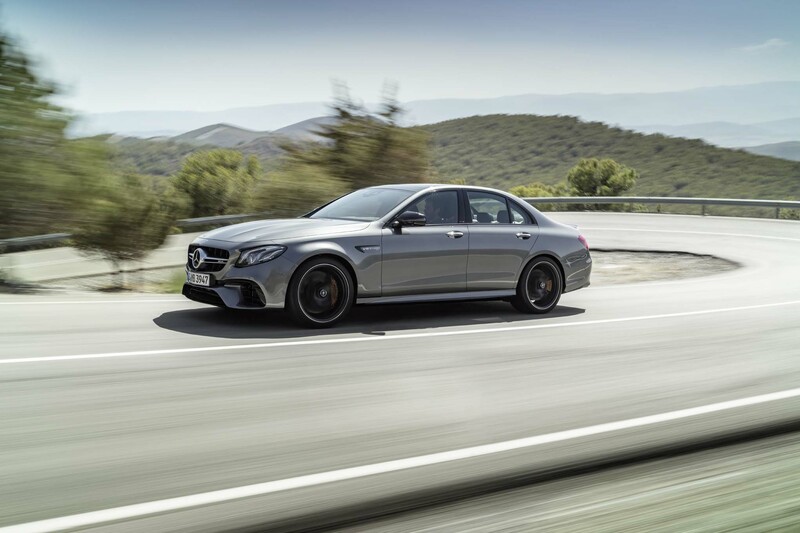 Still, despite the fact that it highlighted some of my poorer driving habits, I found the E63 S to be a grin-generating thrill ride. 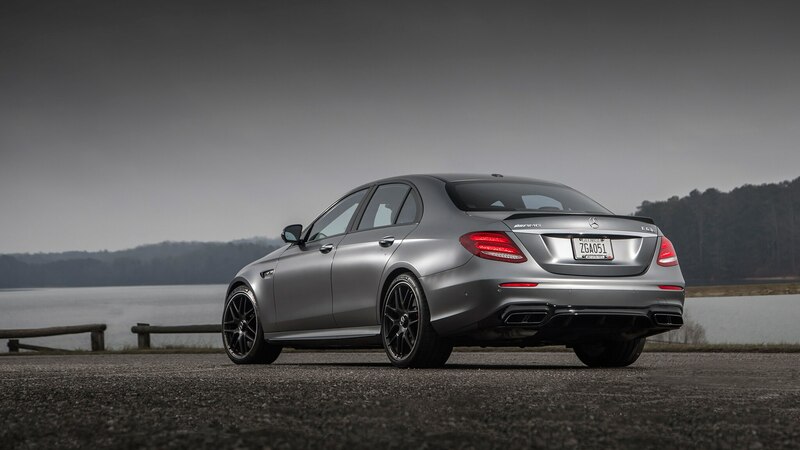 My takeaway from a day of challenging the laws of both traffic and physics is that the E63 S really is a supercar masquerading as a sedan—which makes the $105,000 price tag seem like tremendous value for money. 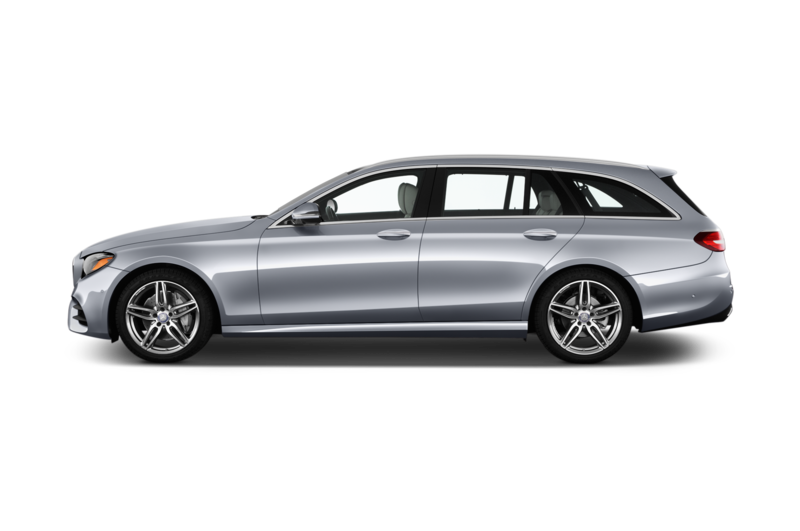 But as a daily commuter, it’s pretty rough. 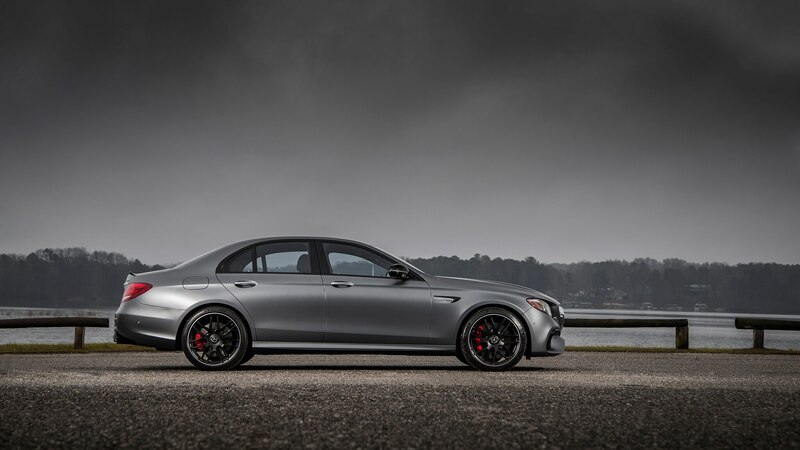 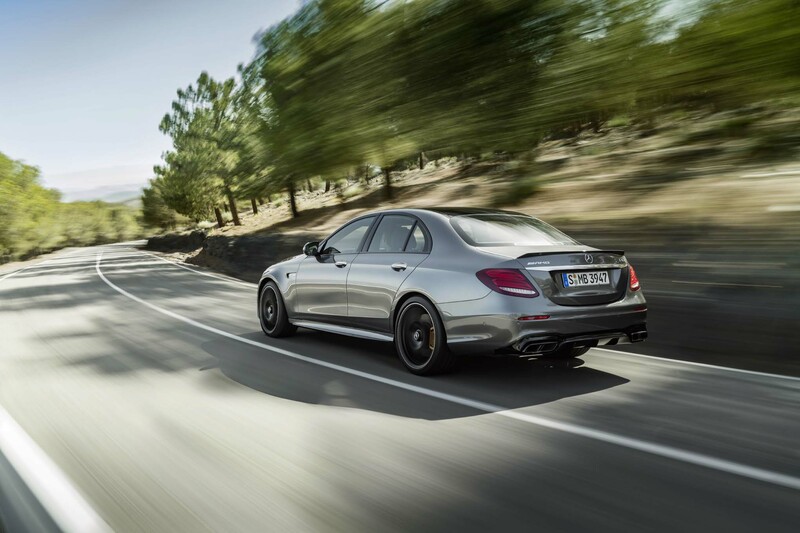 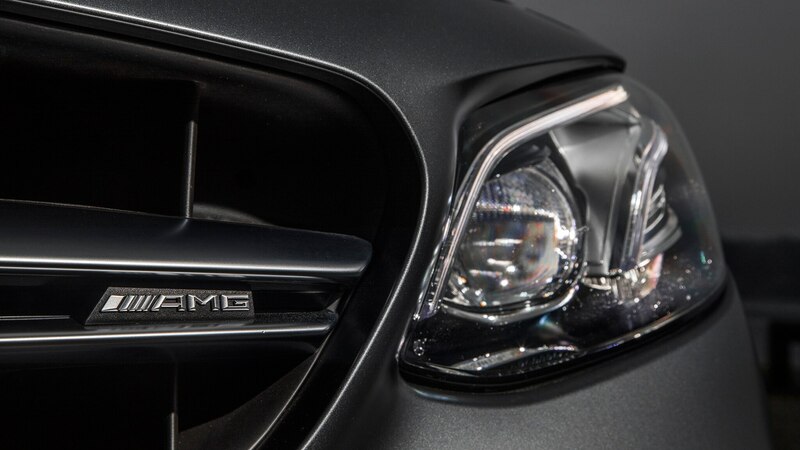 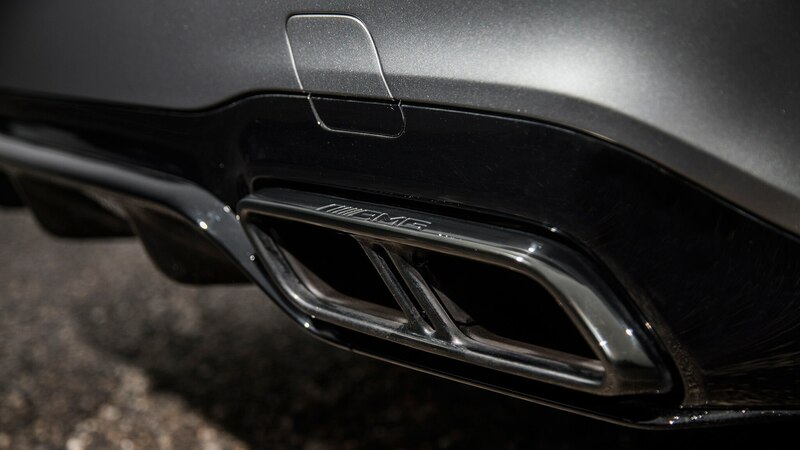 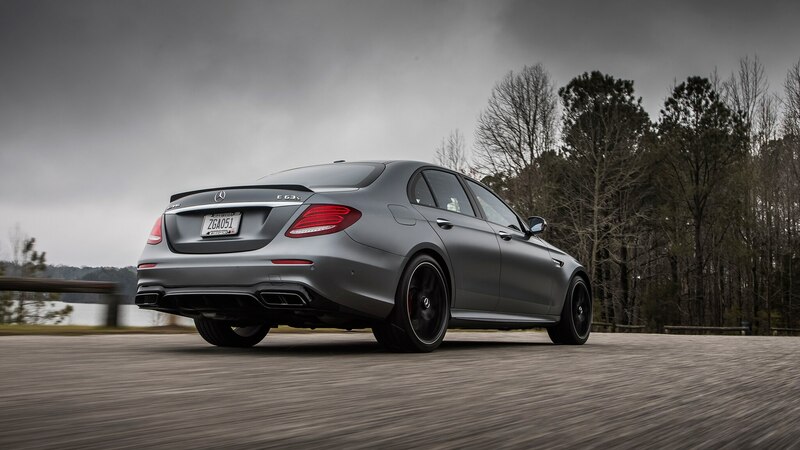 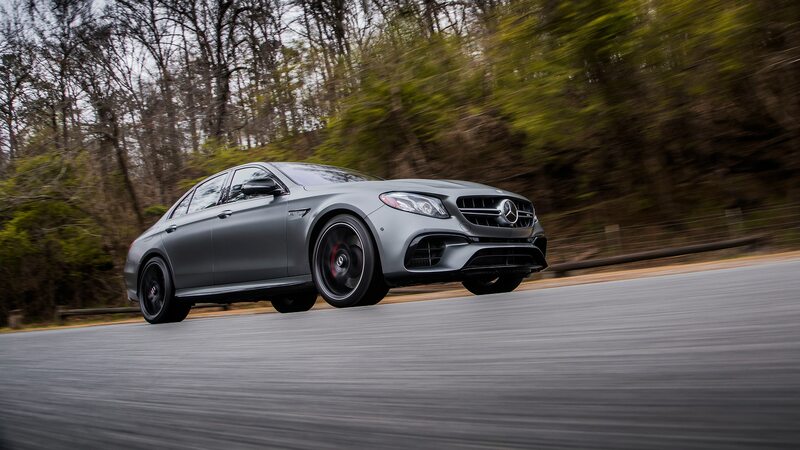 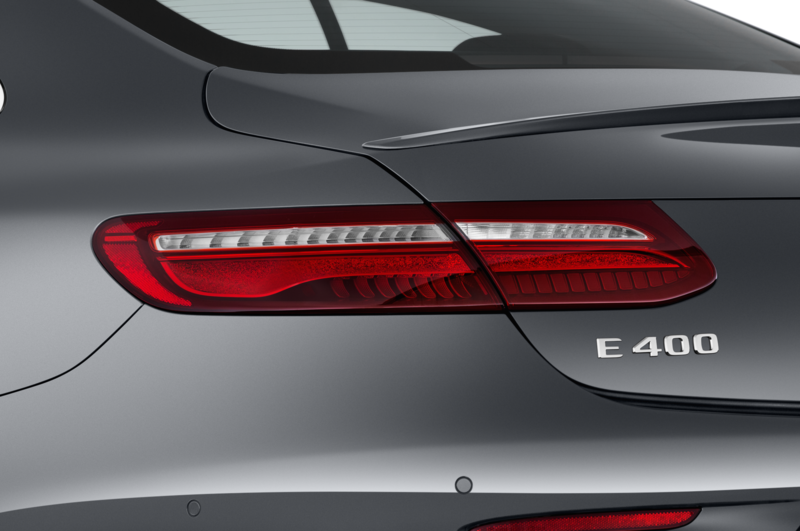 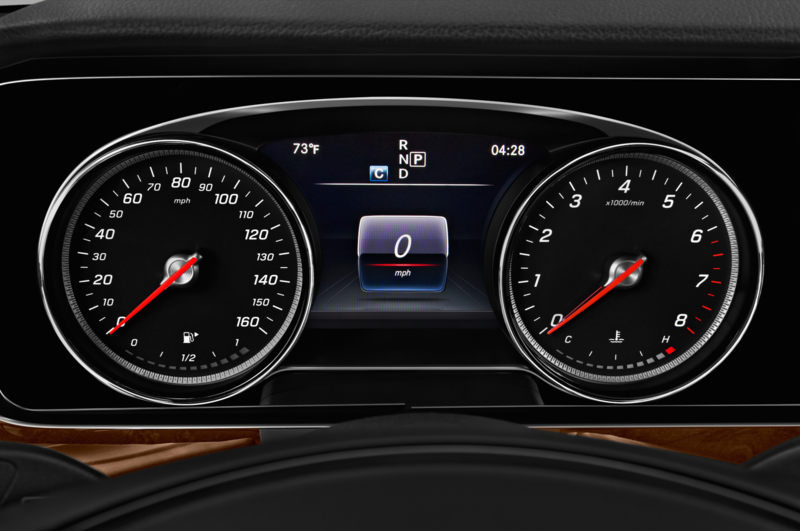 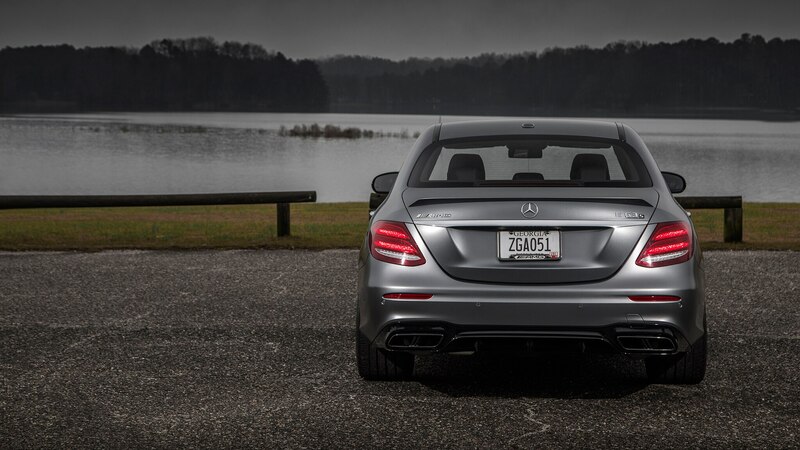 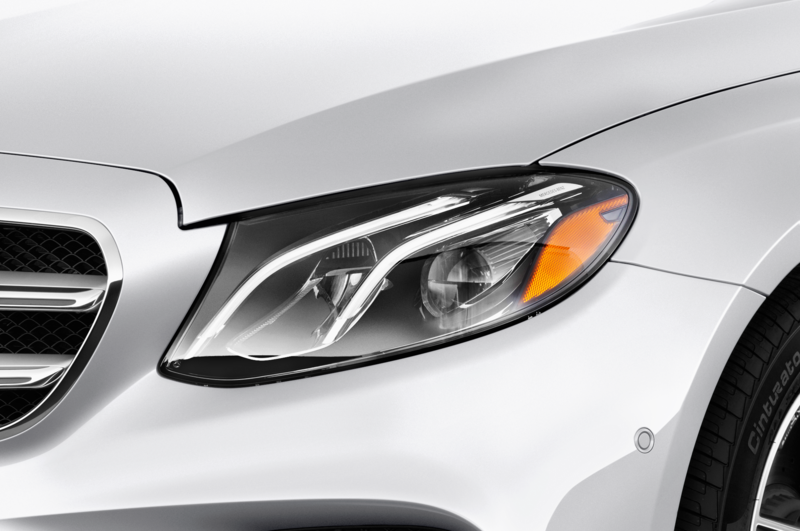 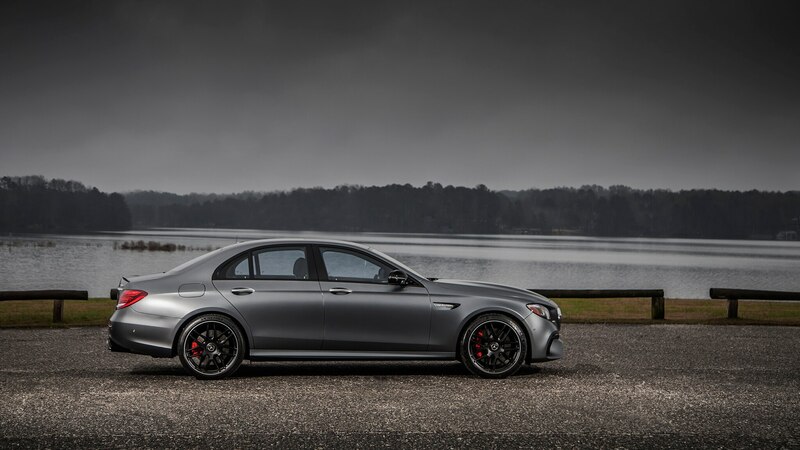 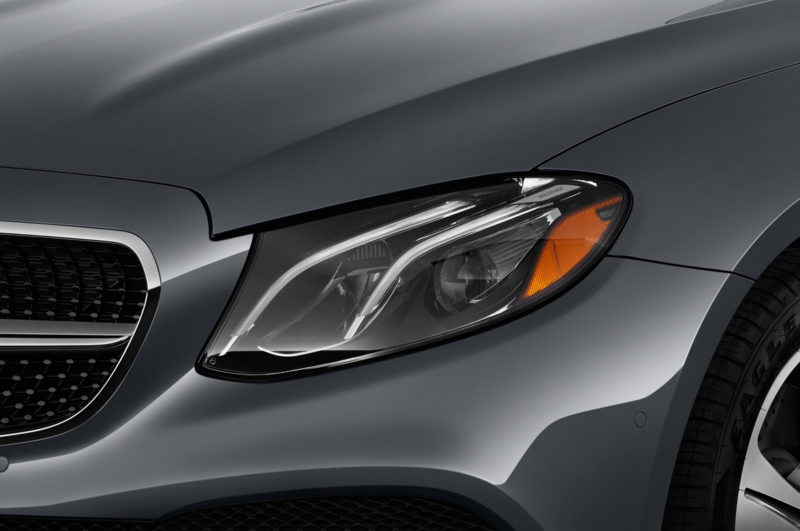 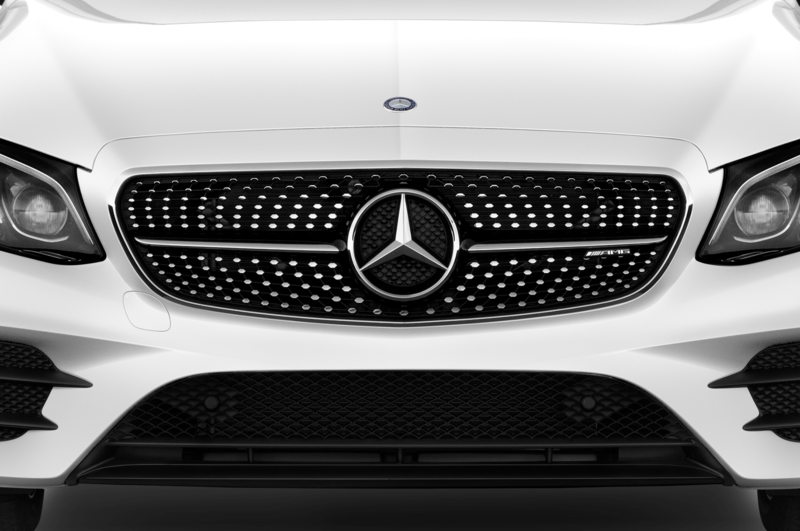 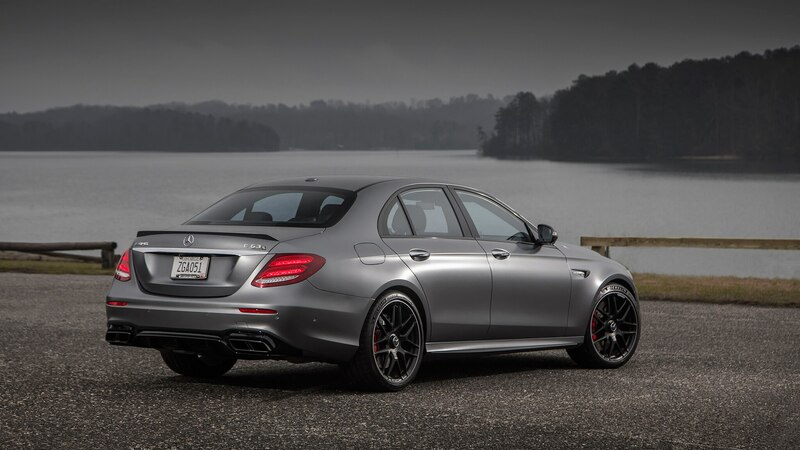 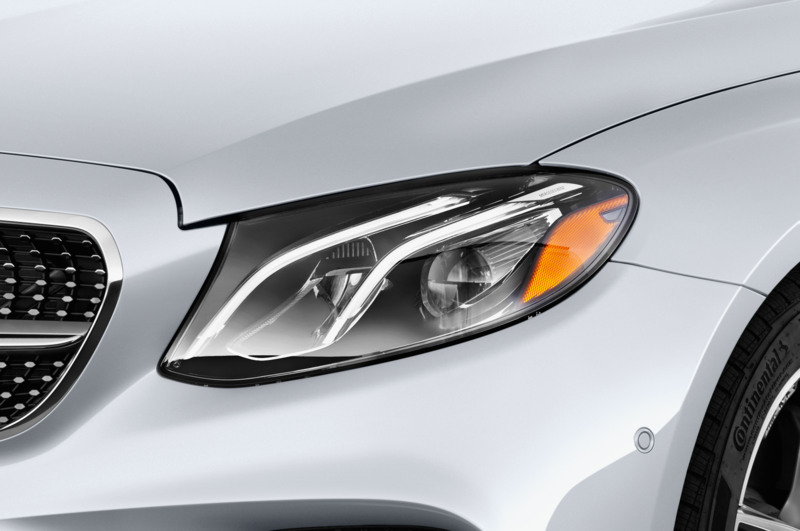 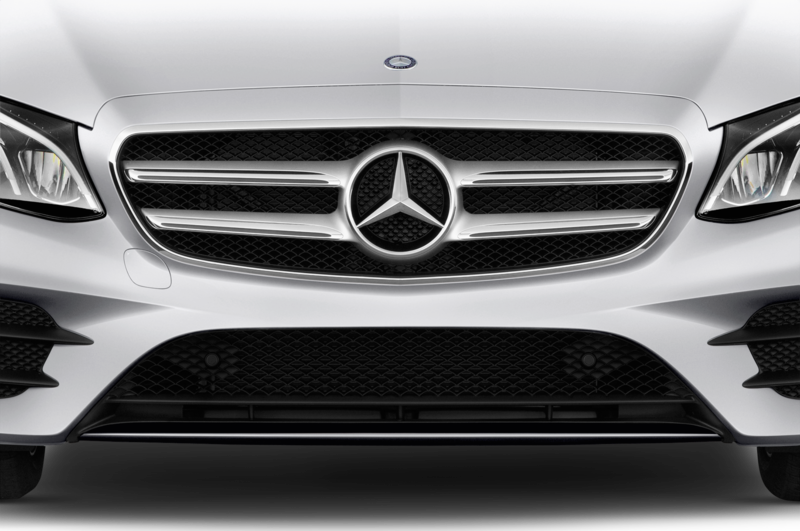 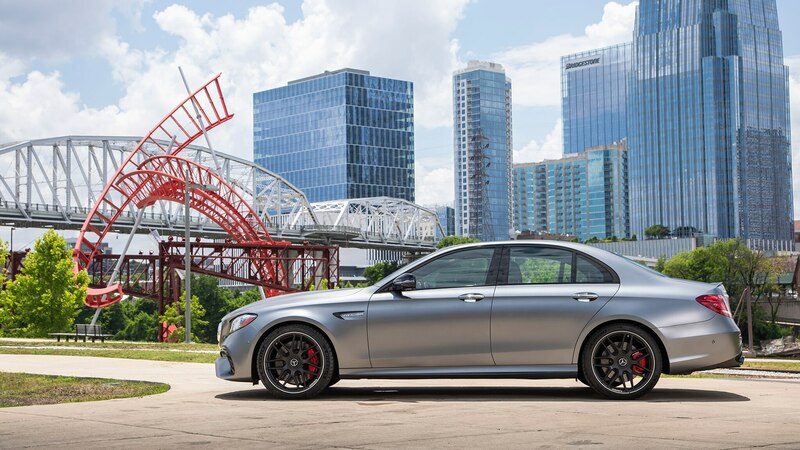 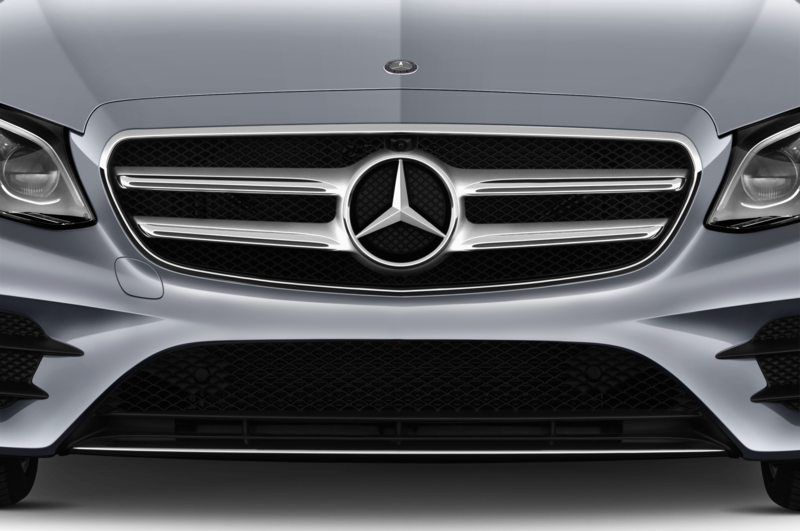 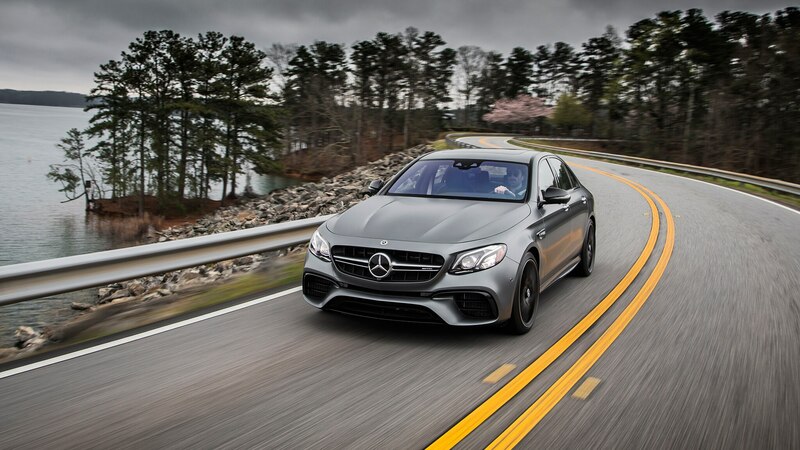 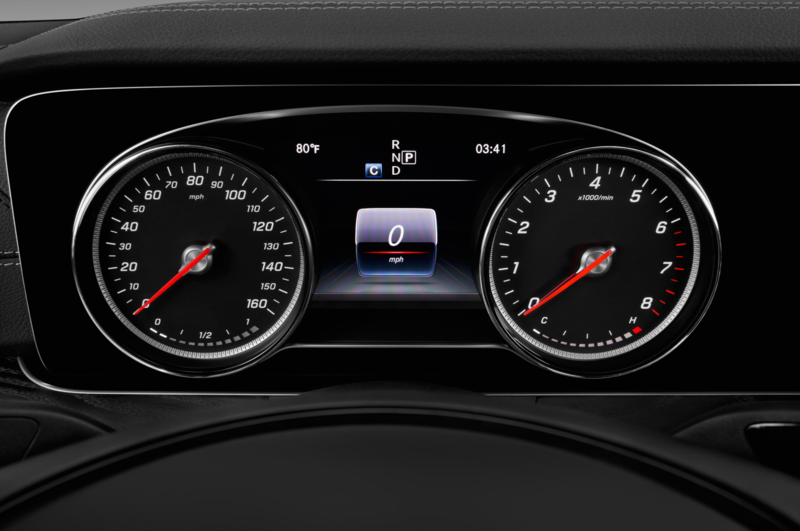 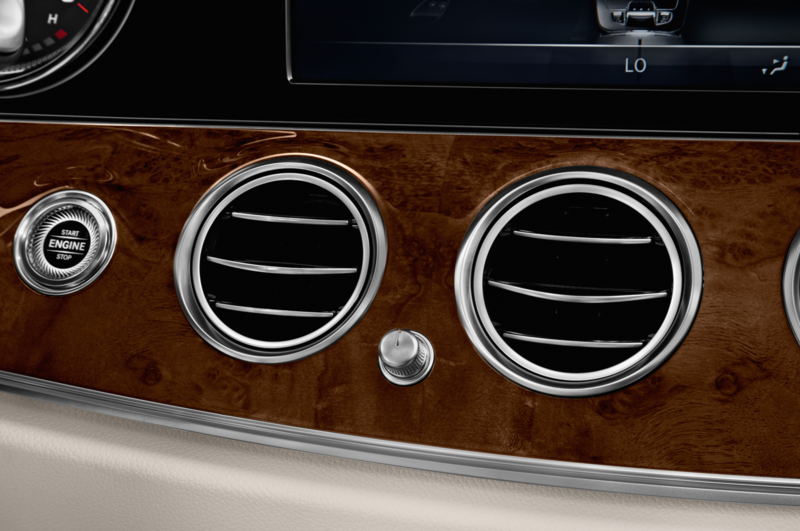 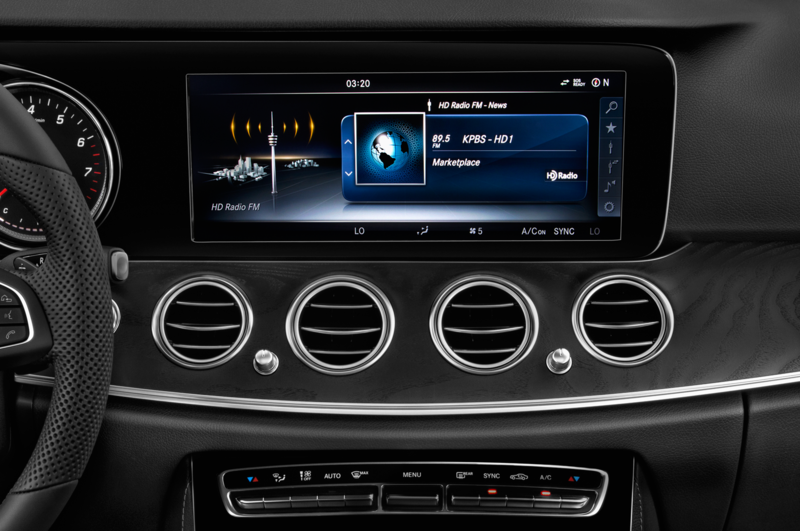 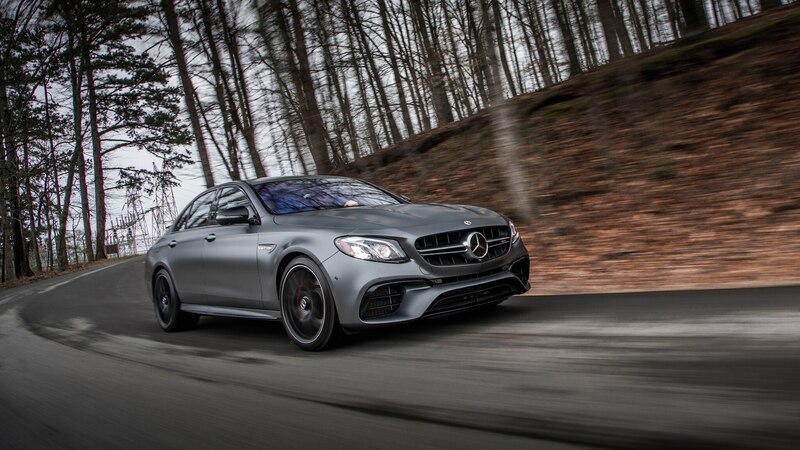 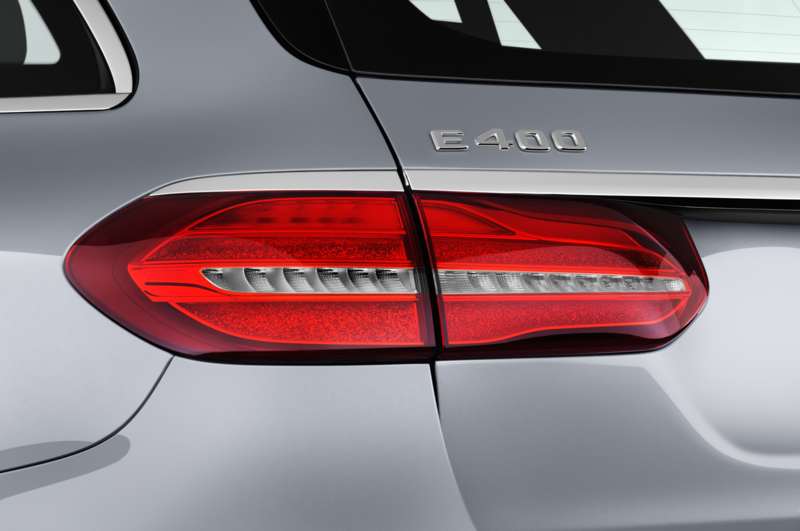 The problem with the E63 S is that it drives in tuned-up mode all the time. 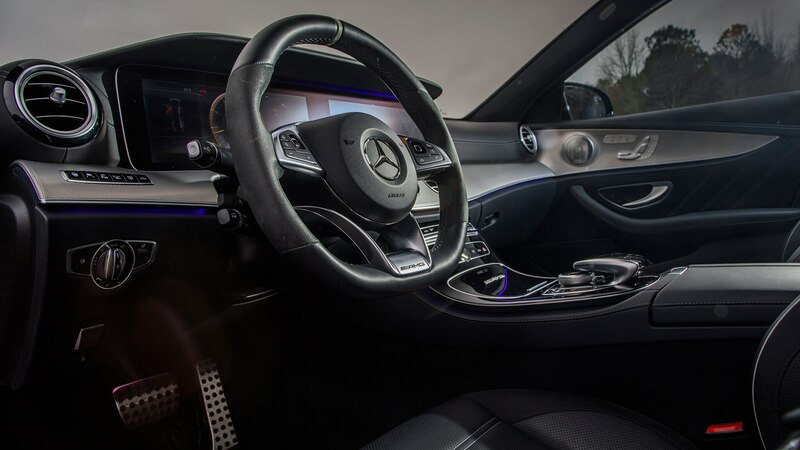 The steering is heavy enough to fatigue your arms. 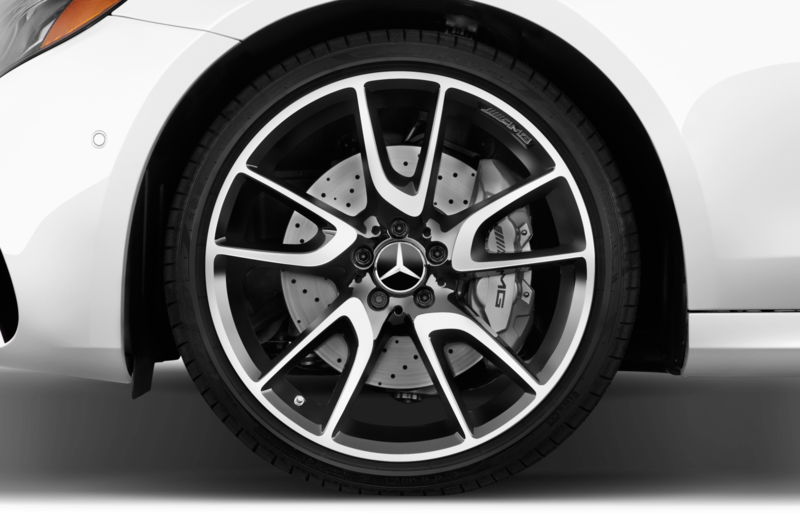 The suspension merely takes the edge off of sharper bumps, as if it was fulfilling the minimum standards of care required by law but refusing to do anything else. 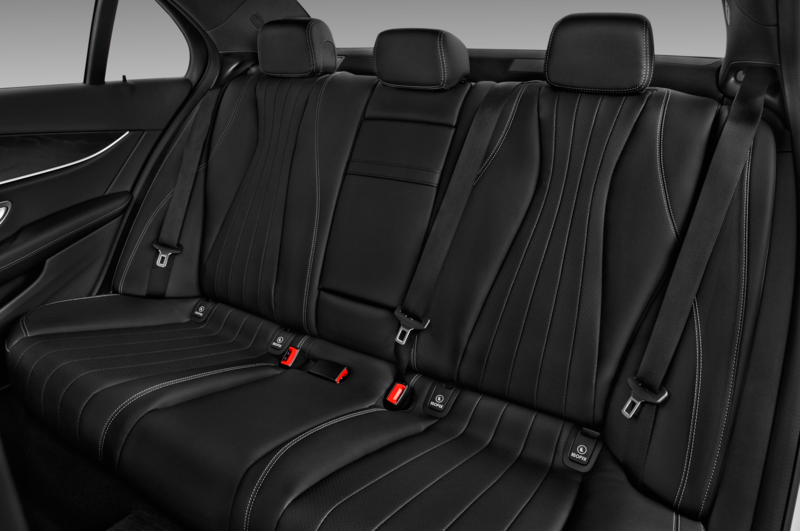 And the seats—don’t even get me started. 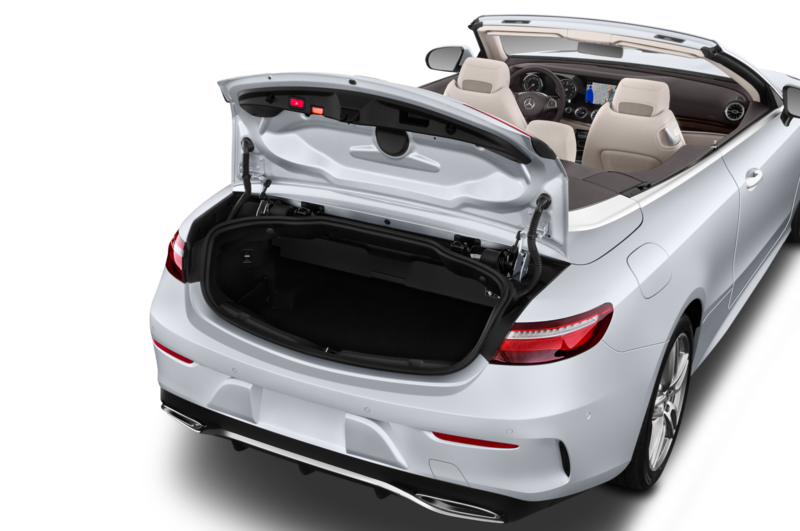 The front buckets are meanly padded and rock hard, and I spent the better part of my day trying, and failing, to find a comfortable adjustment. 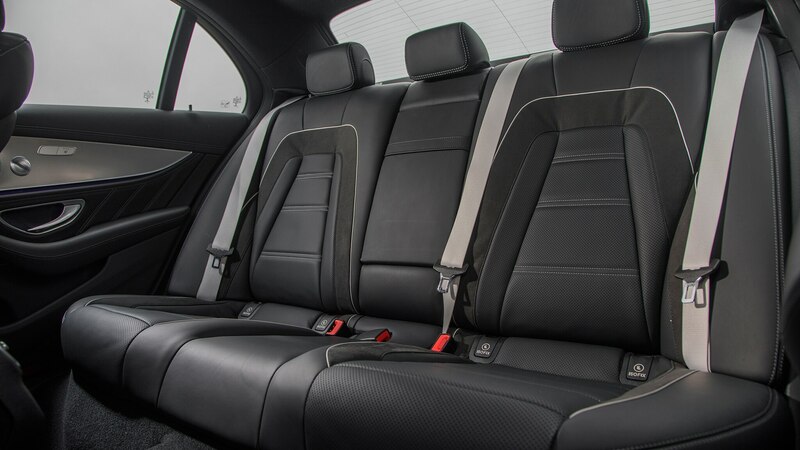 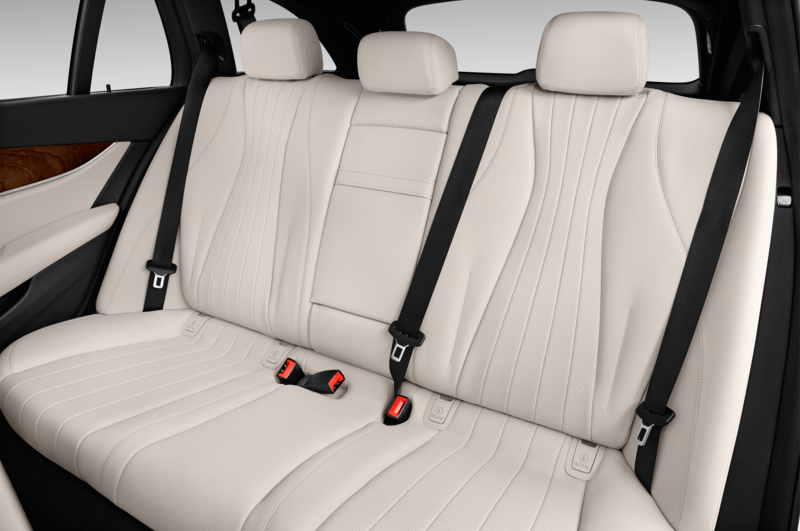 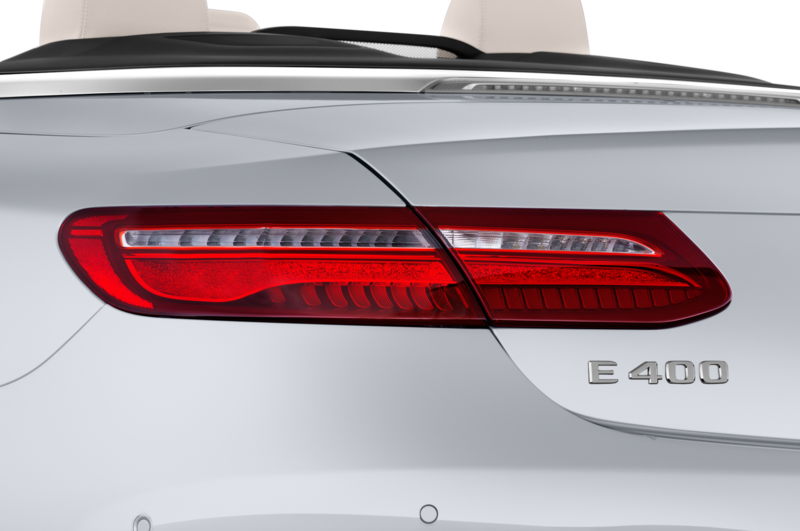 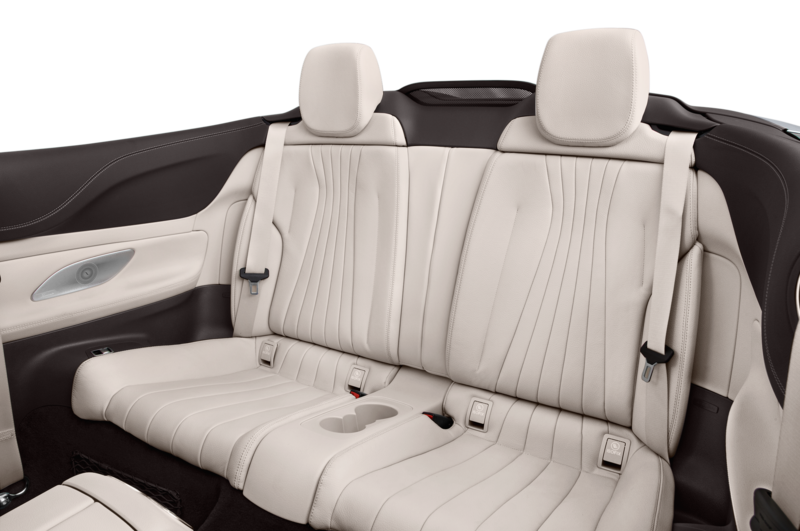 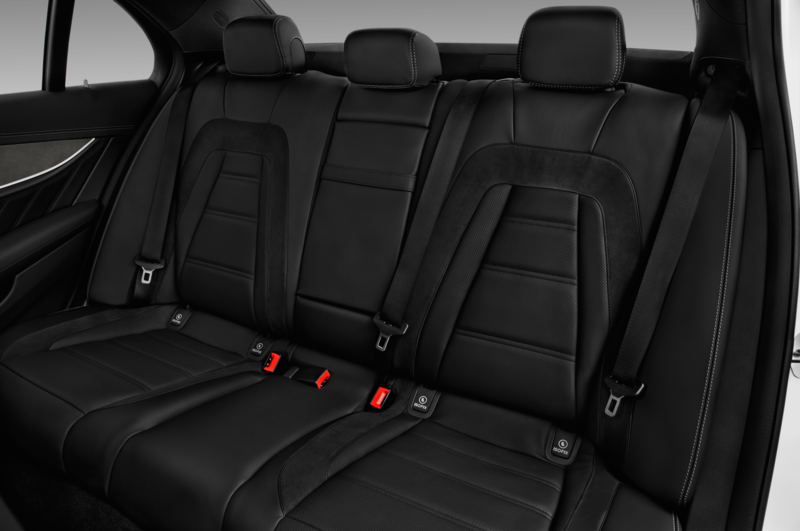 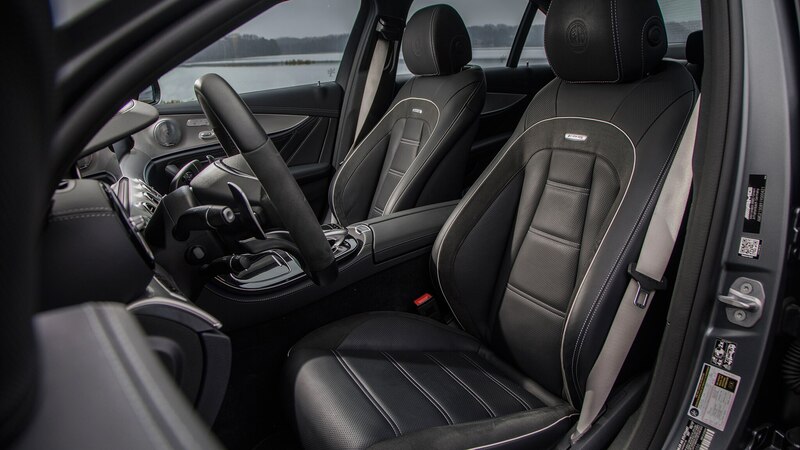 In all fairness, seat comfort was less of an issue after my hot-rod curvy-road drive, but that may have been afterglow—or perhaps the forces of acceleration had temporarily remolded my spine to the seat’s unforgiving contours. 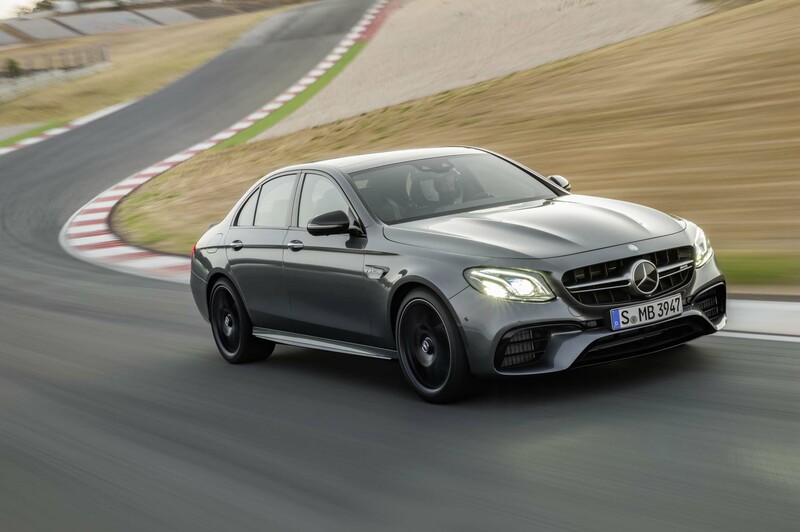 Were I reading this review instead of writing it, I suspect I’d be screaming at the screen right about now: “If it drives like a supercar, of course it rides like crap!” Fair point—but this is a German supercar, and furthermore it’s got an air suspension and electric power steering. 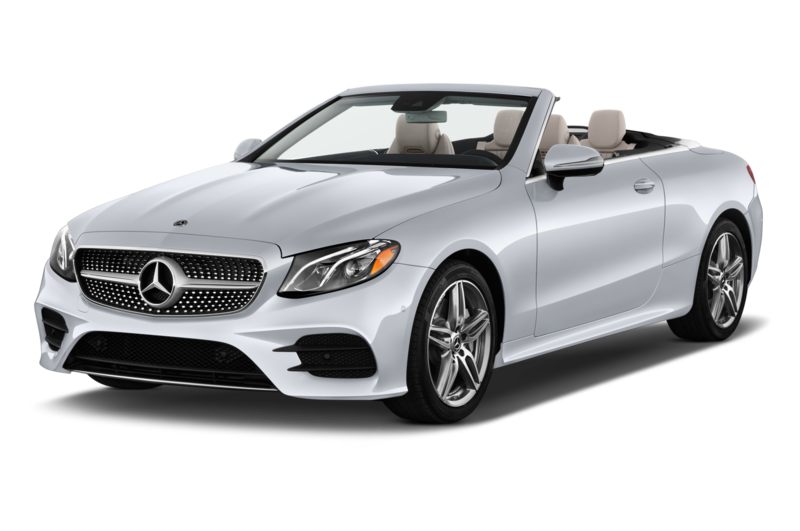 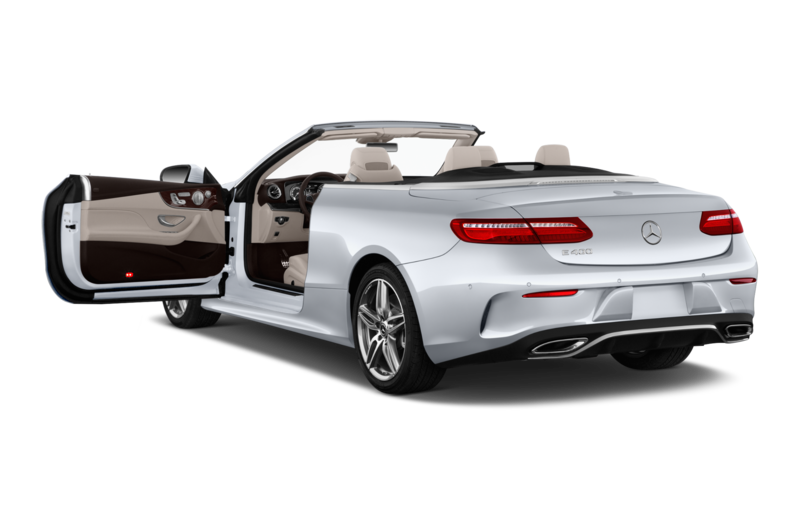 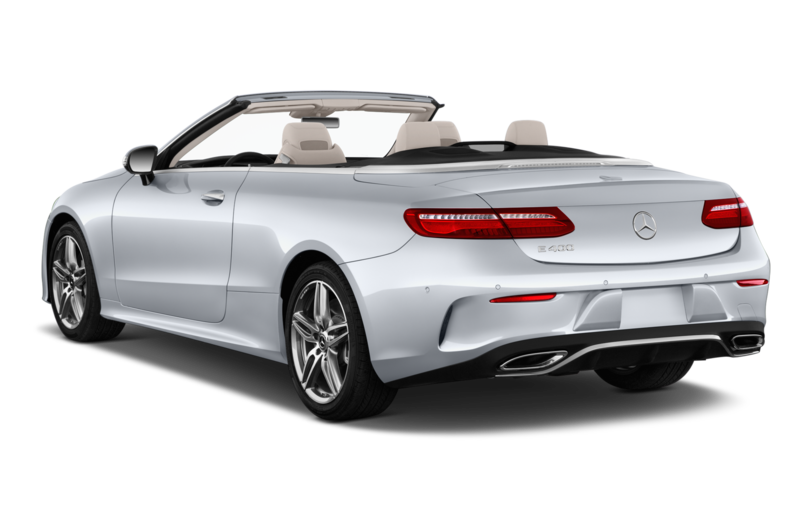 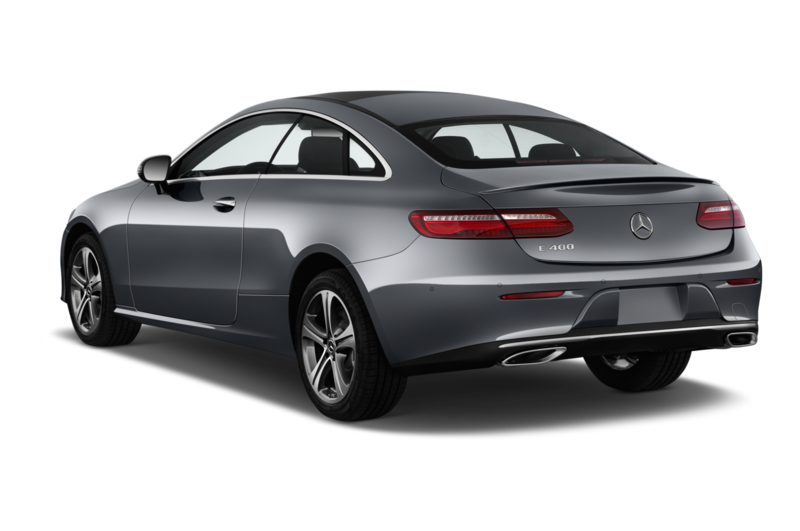 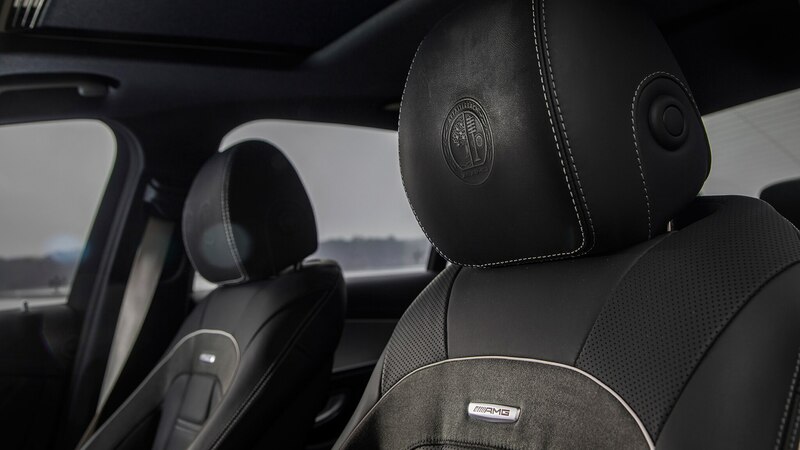 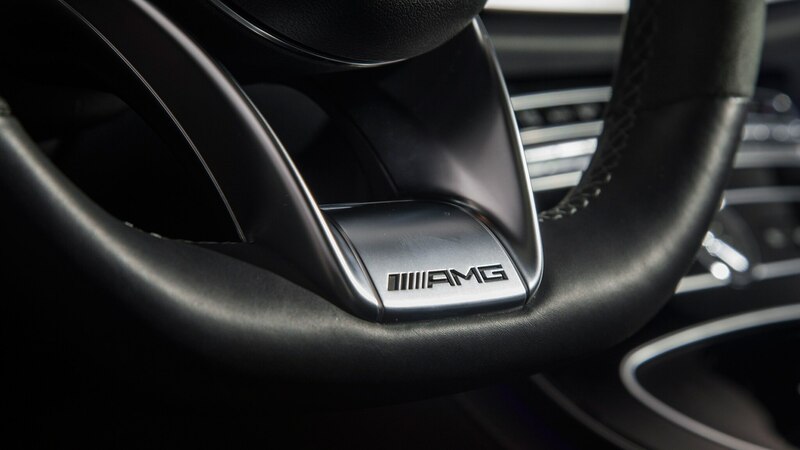 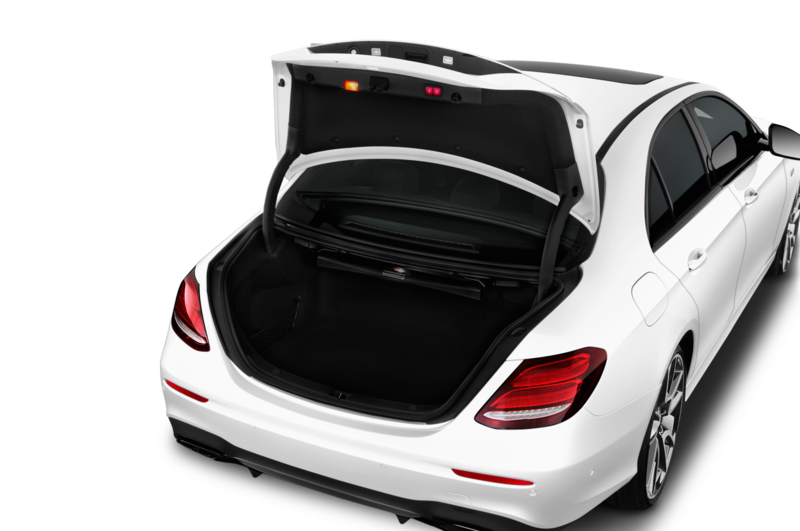 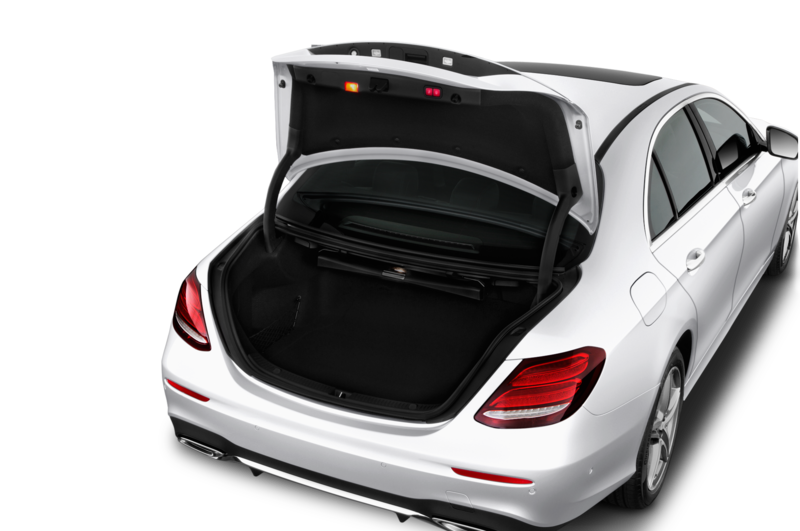 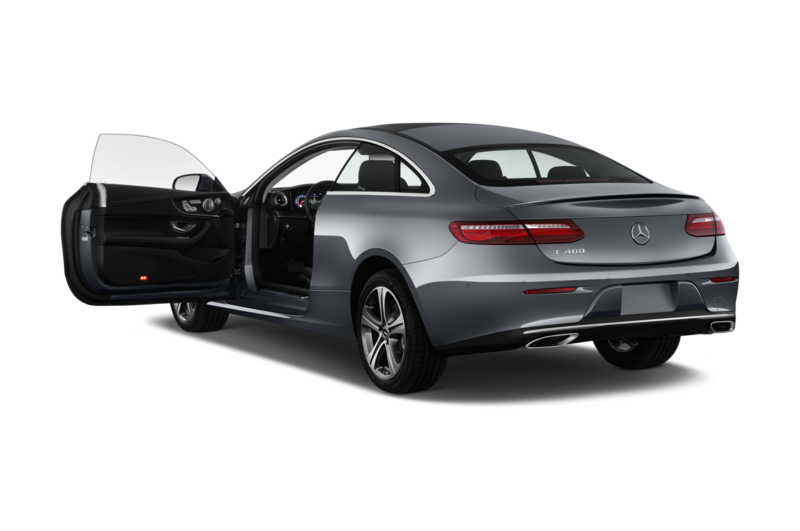 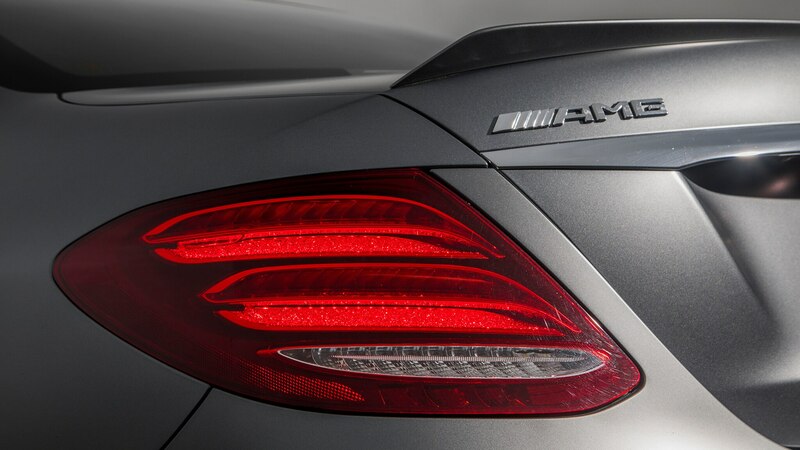 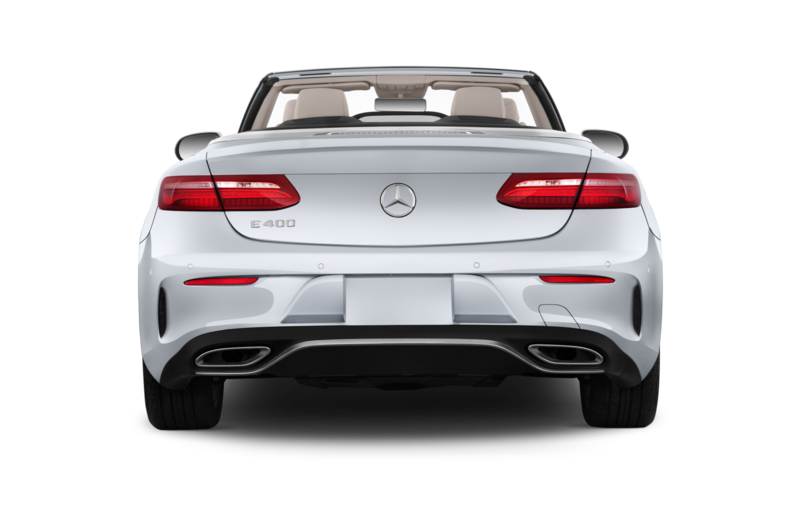 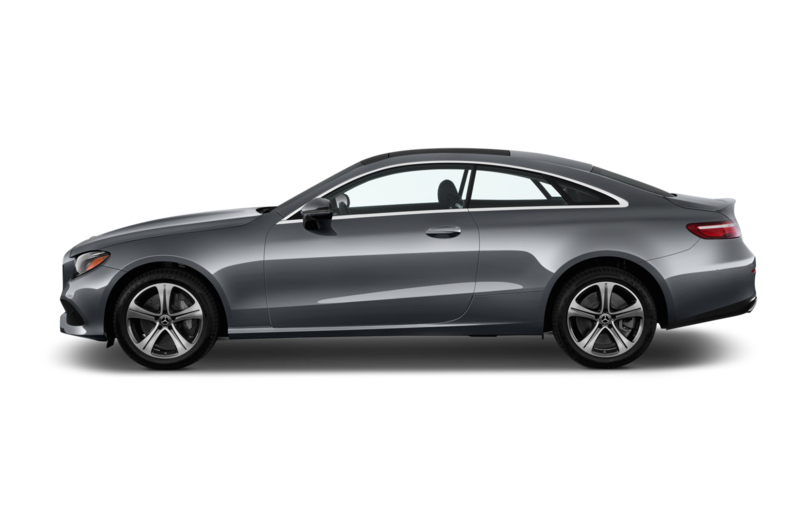 I submit that AMG’s engineers could have made the car just as talented in Sport and Race modes while providing a “Comfort” mode that was actually comfortable. 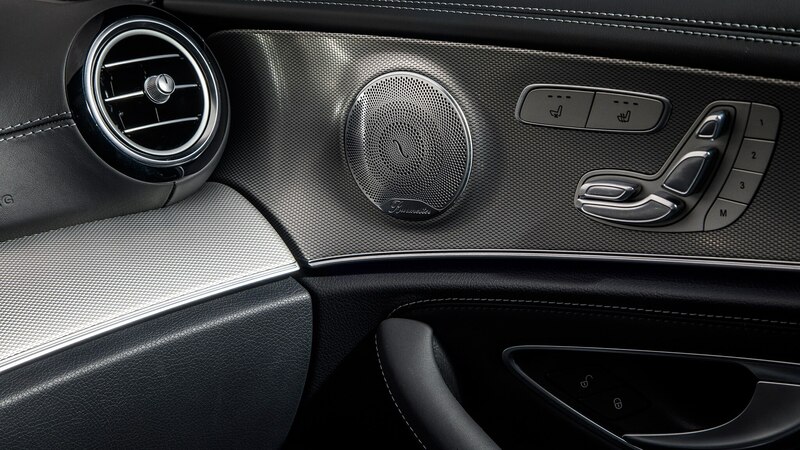 They could have turned up the power-steering boost. 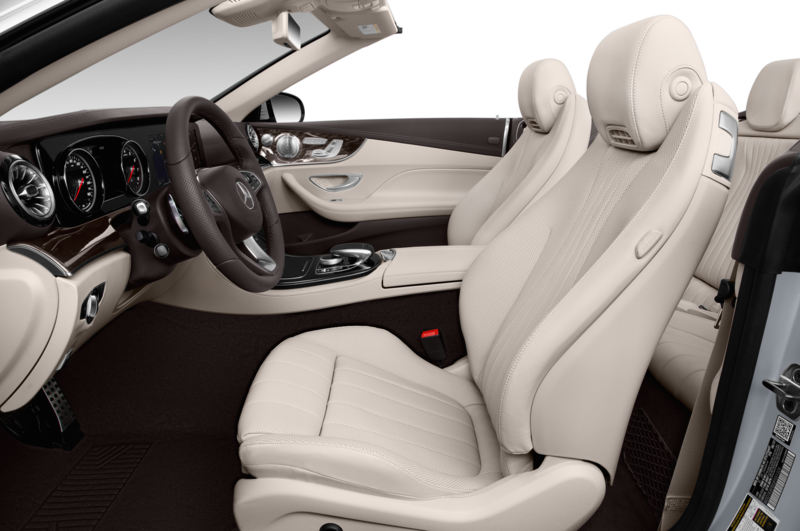 They could have softened the ride. 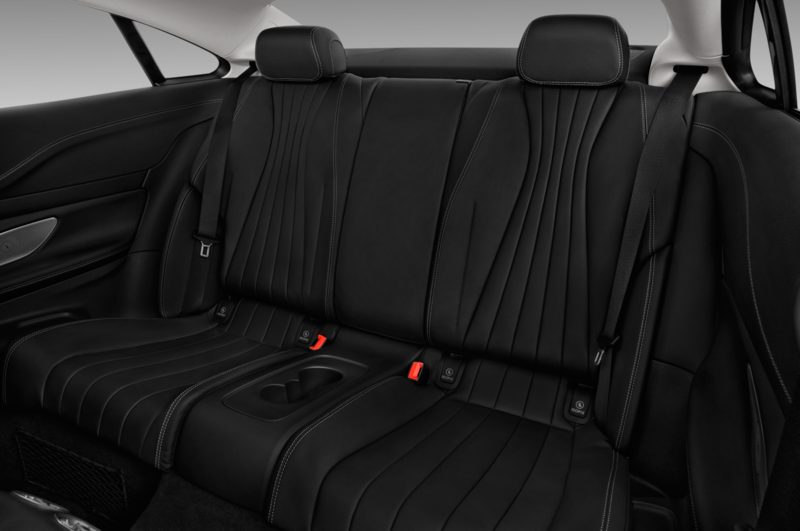 They could have put just a wee bit more padding in the seats. 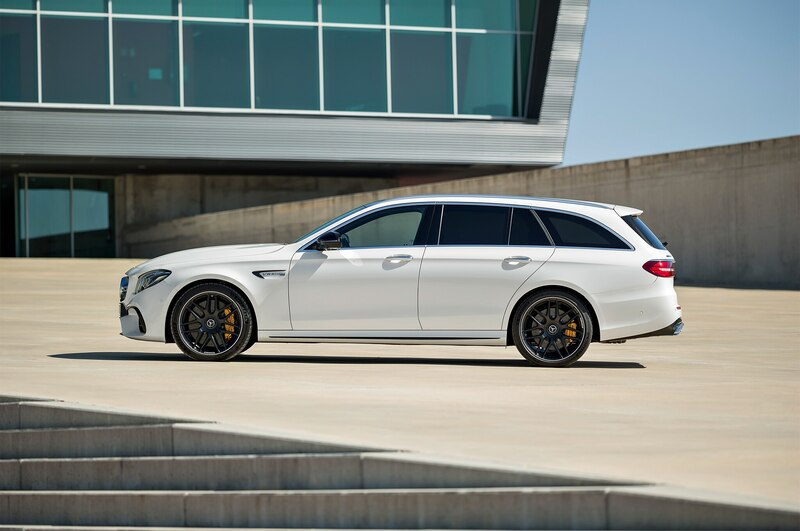 The E63 S is harsher than it needs to be in its tamest setting, a little less comfortable, a little more tedious to drive to the office. It’s as if the engineers are jealous of your ability to afford this amazing car, and were determined to punish you for it. 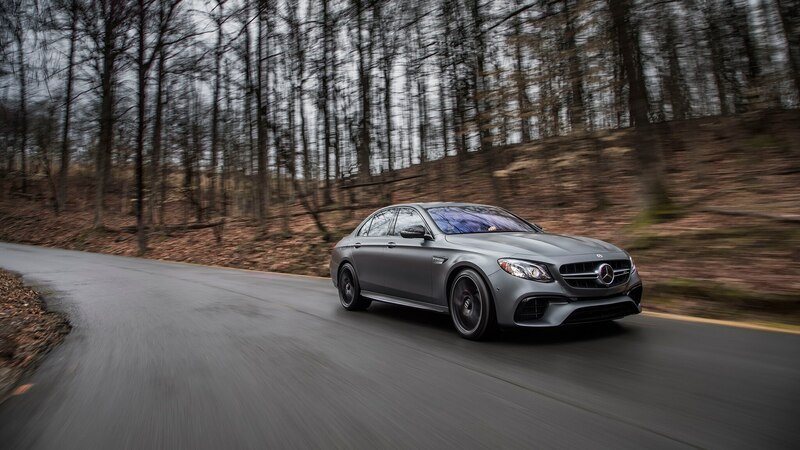 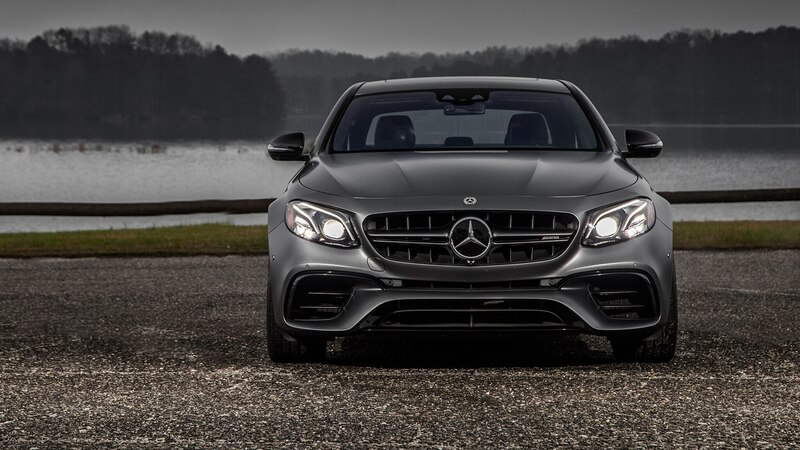 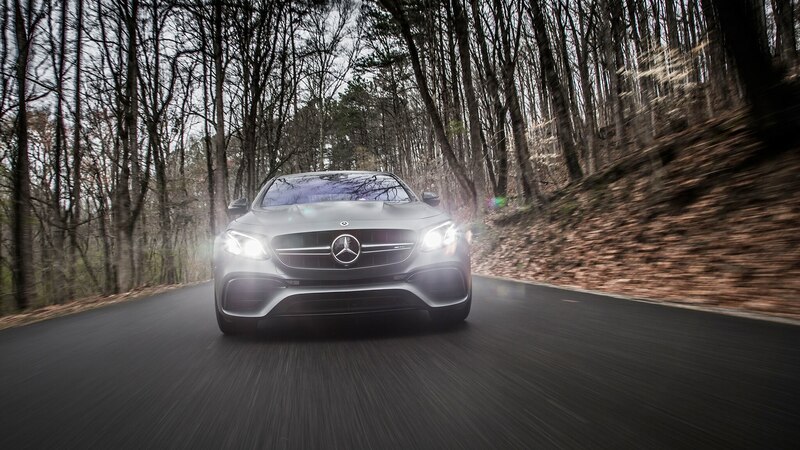 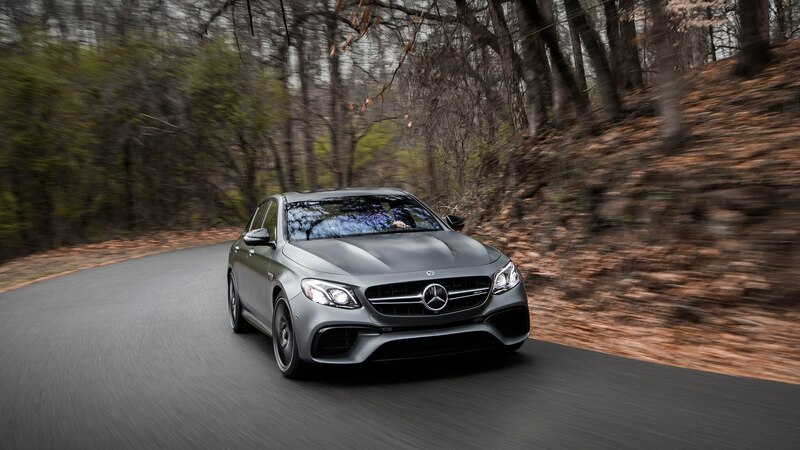 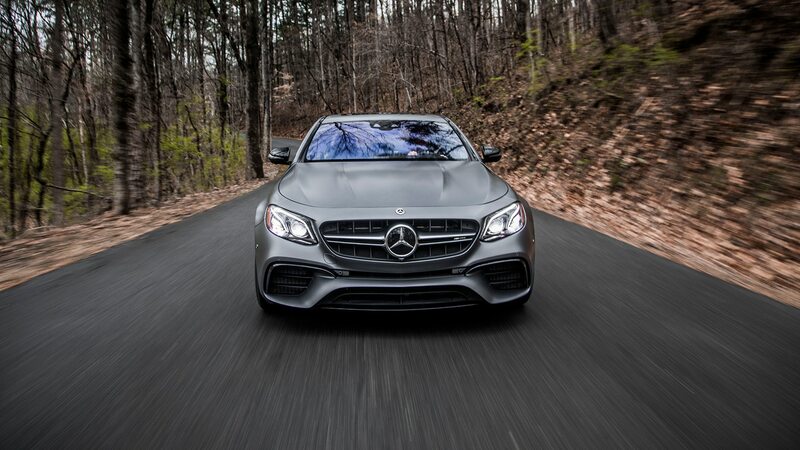 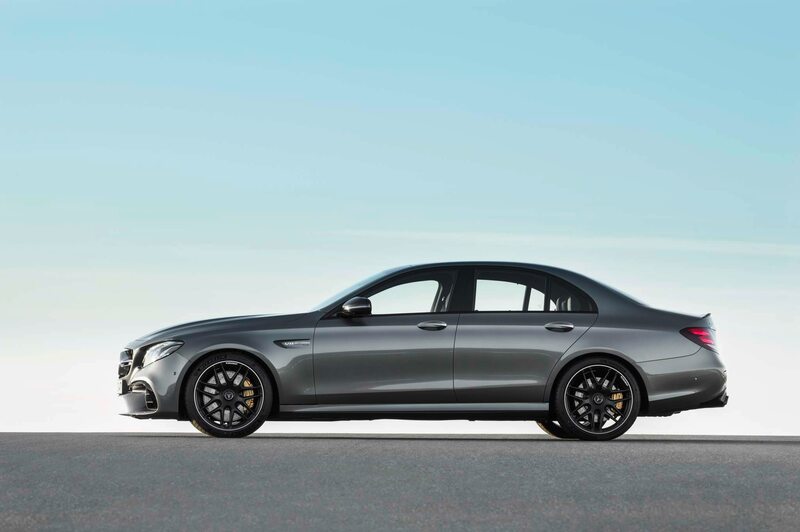 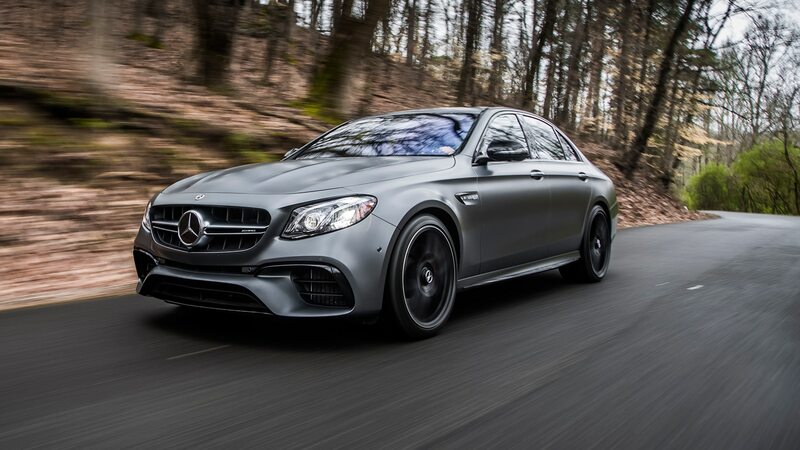 In an ideal world, I would own a Mercedes-AMG E63 S. I would have it waiting at the foot of my favorite curvy canyon road, engine warmed up, in Race mode—primed and ready for attack. 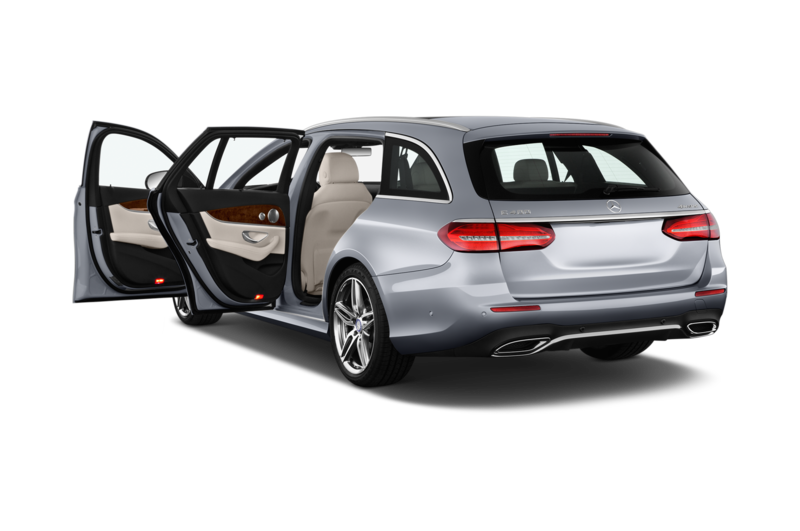 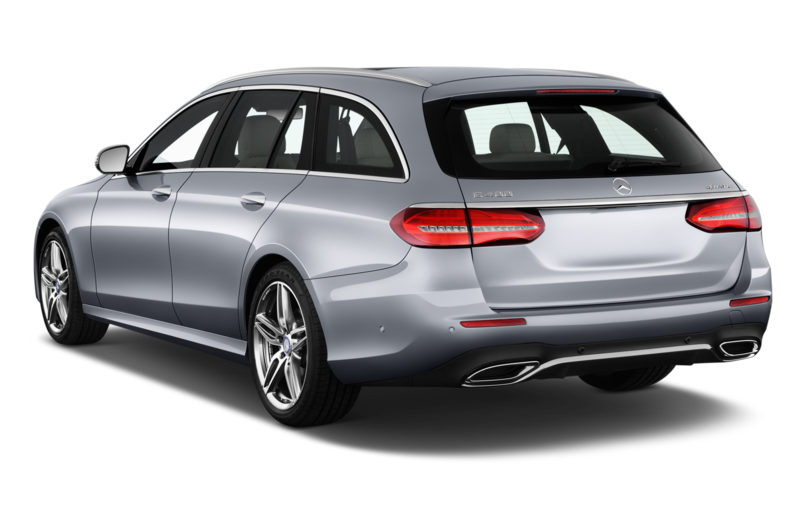 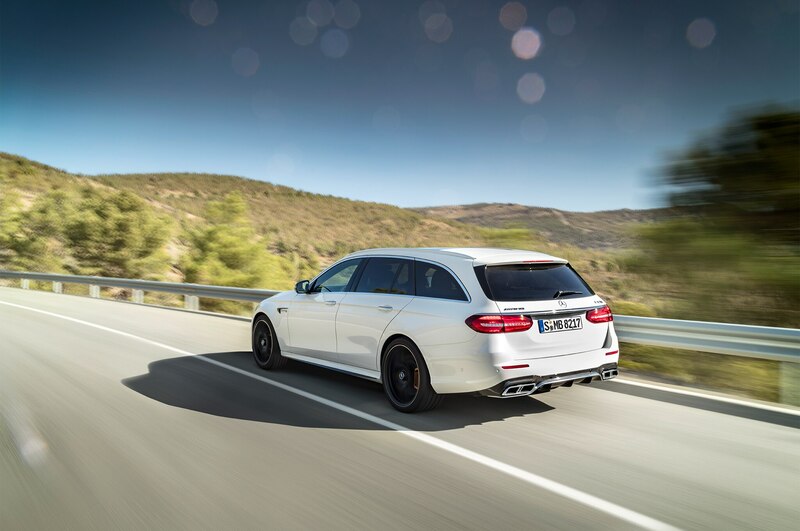 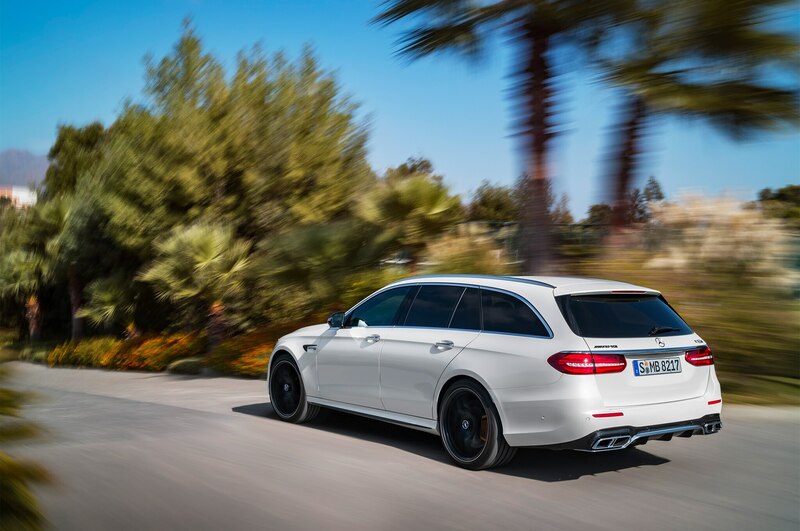 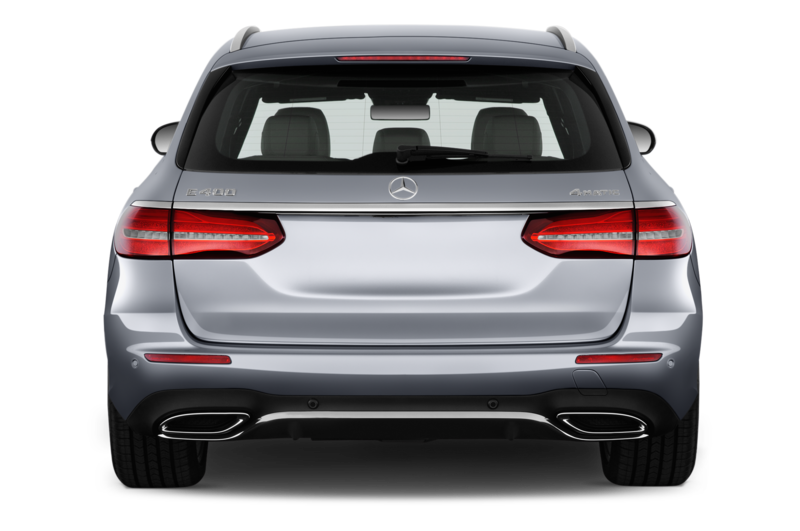 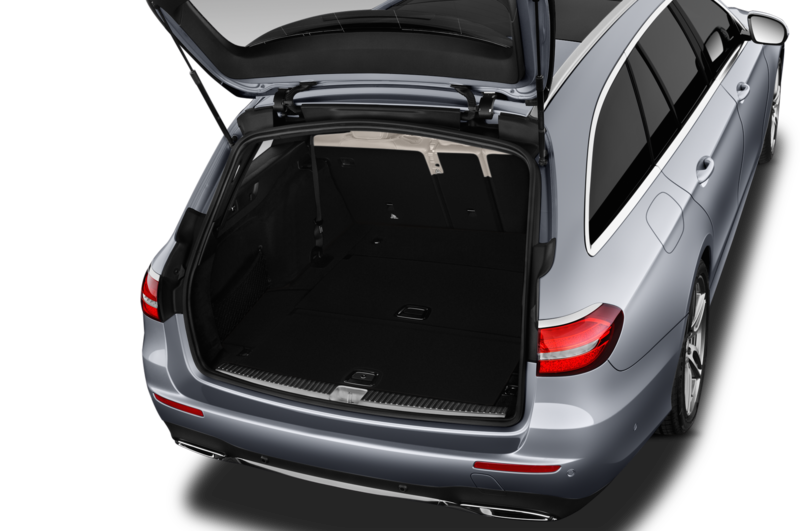 And in that same ideal world, I’d have a 10-year-old E63 wagon to commute between my house and the car.